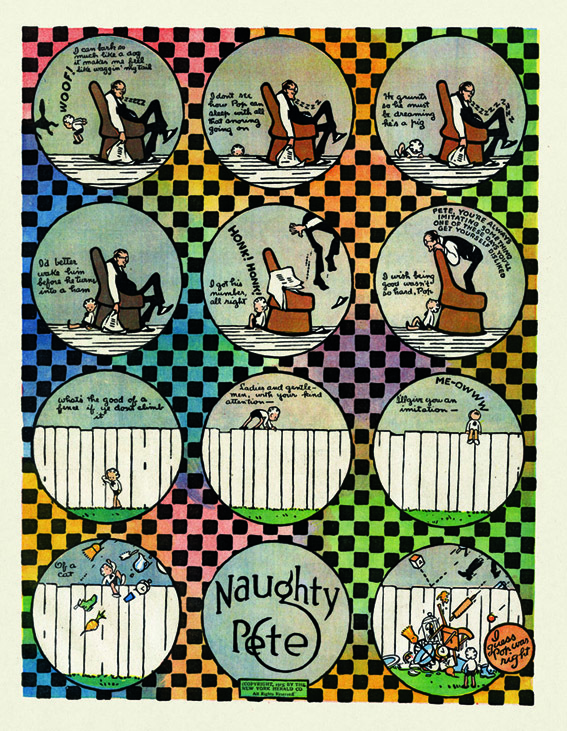 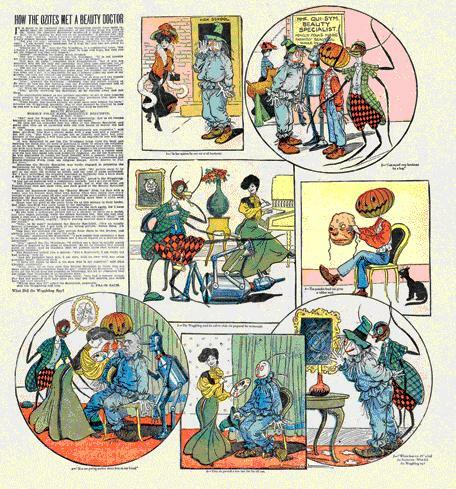 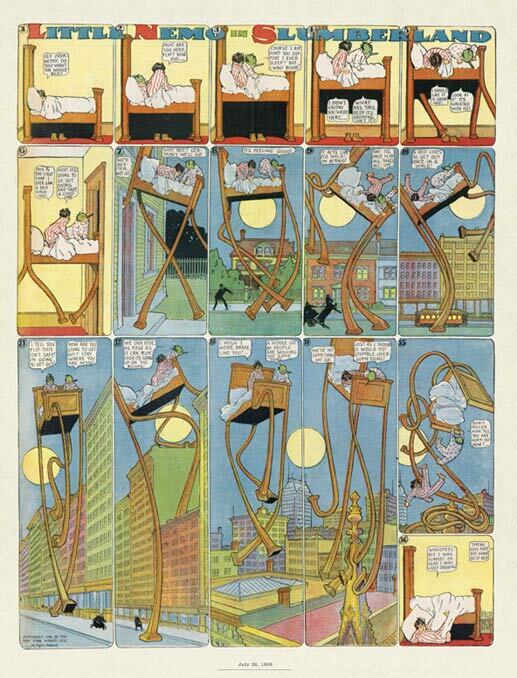 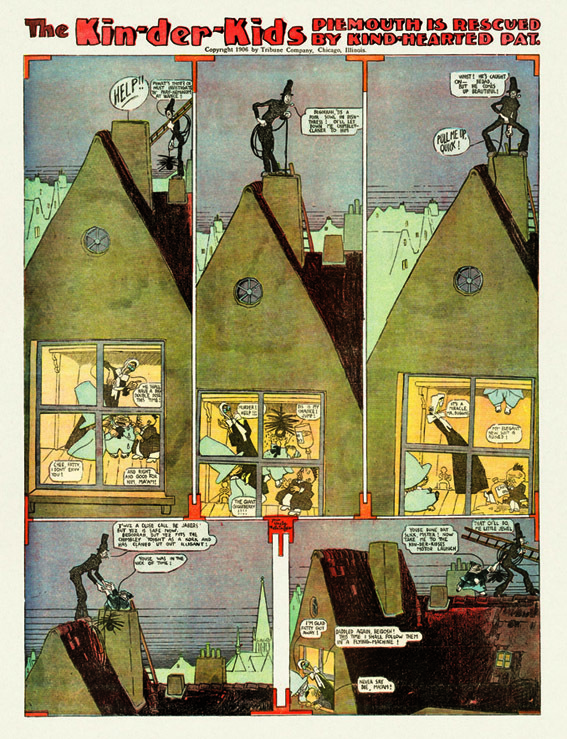 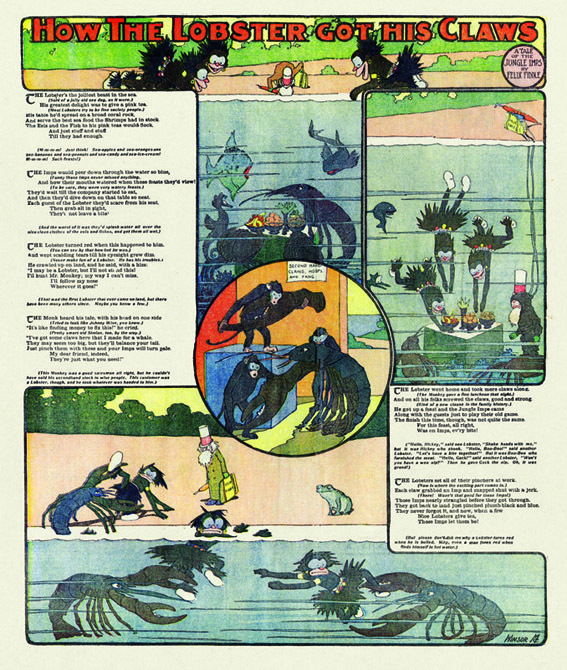 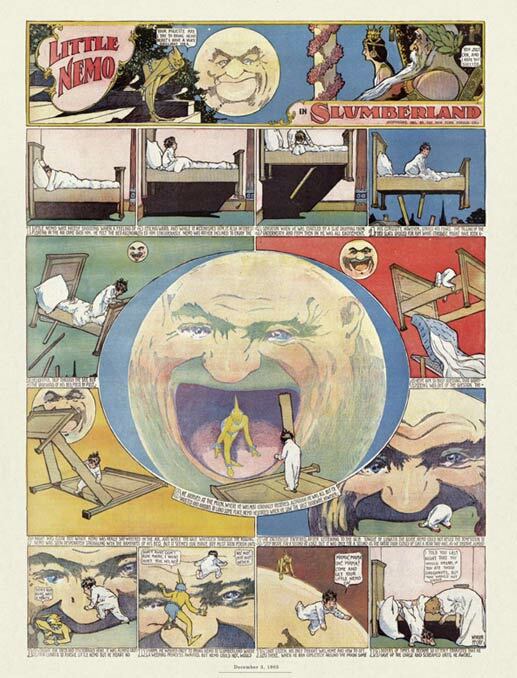 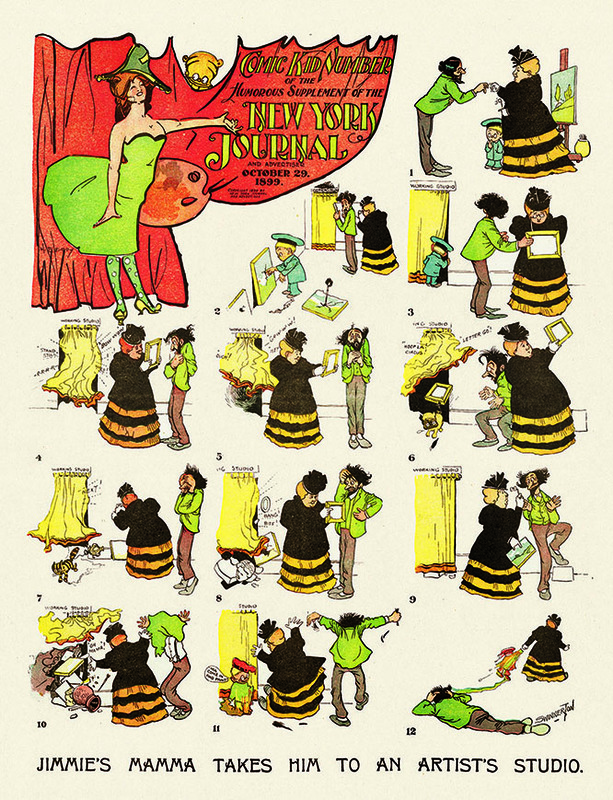 Turning the comics world "Upside-Down"
This new compilation from Sunday Press features a complete run of the "Upside Downs" (1903-1905), digitally restored and presented in their original size (11 x 16 inches) and colors. 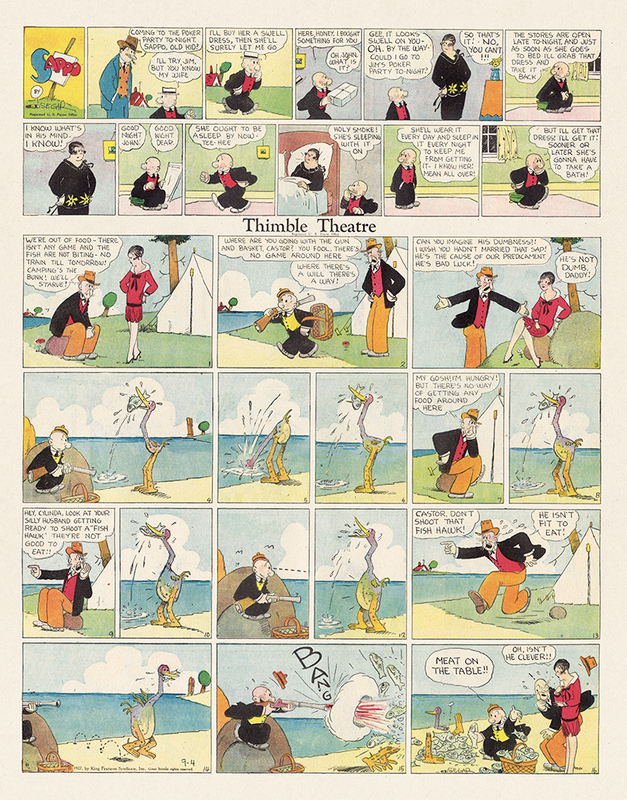 Also featured are a complete run of Verbeek's "Loony Lyrics of Lulu" (1910) and a sampling of his long-running, "Terrors of the Tiny Tads" (1906-1914). 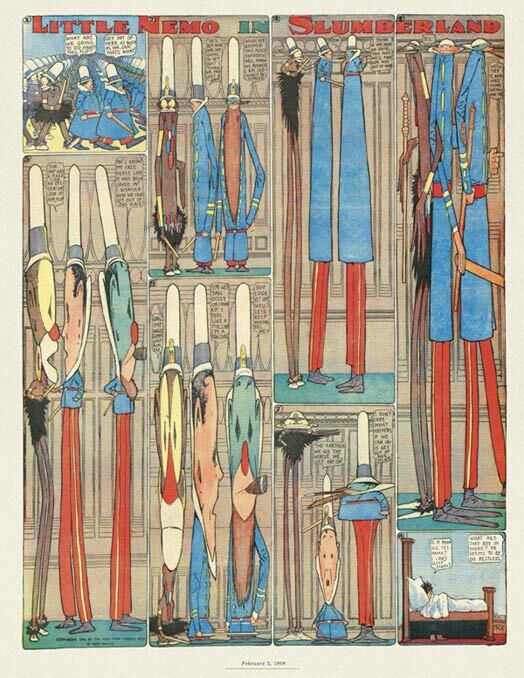 A collection of 25 paintings and drawings from books illustrated by Verbeek (1910-1915) fills out this large hard-bound volume. 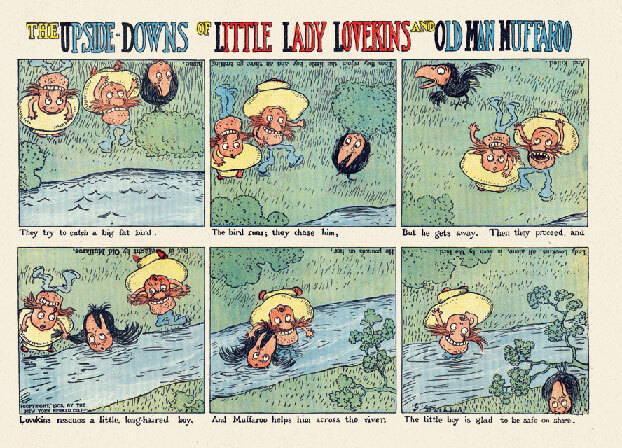 Included in the book ia a set of 12 Tiny Tads postcards, facsimilies of a series created by Verbeek as a promotional tool for retail stores around the U.S.
Verbeek's Upside-Downs and Tiny Tads have been favorites since my earliest days of comic strip collecting. 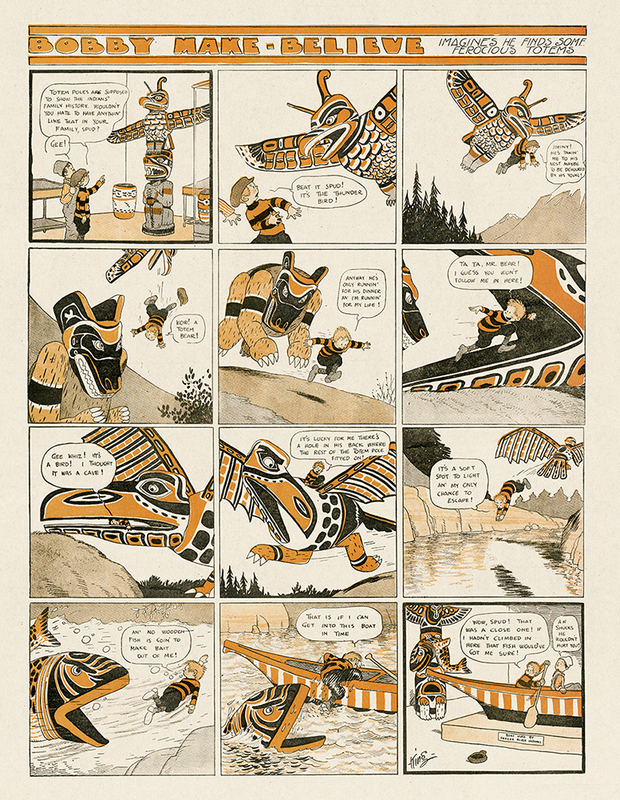 But not until I set out to do this book did I discover the incredible variety offered to the world of comics and illustration by Gustave Verbeek. 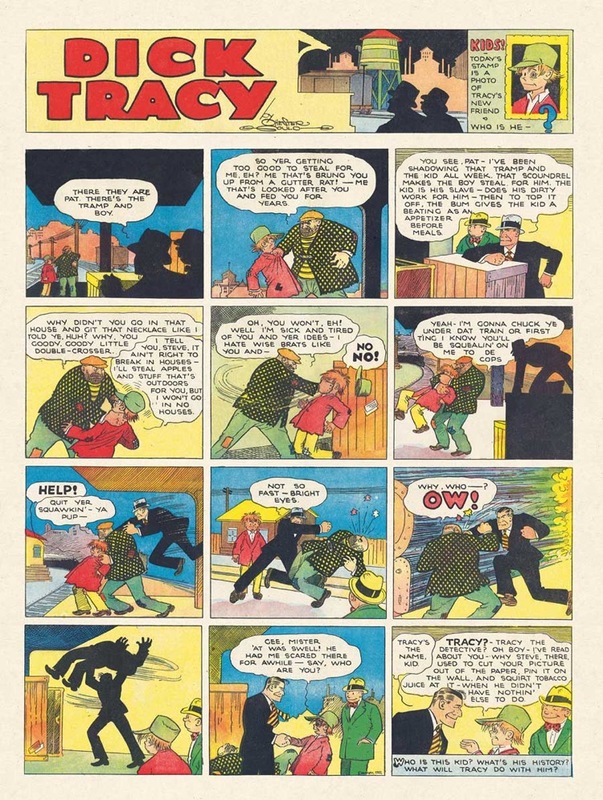 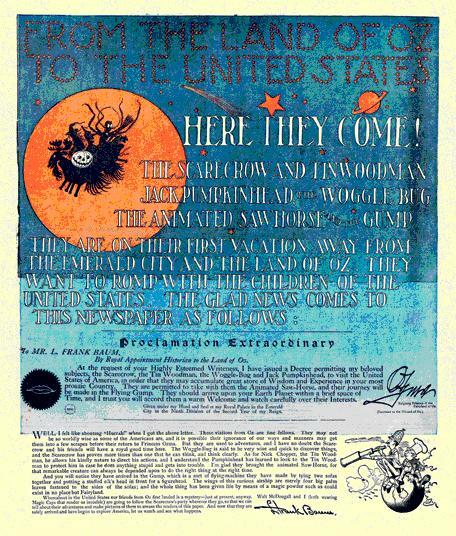 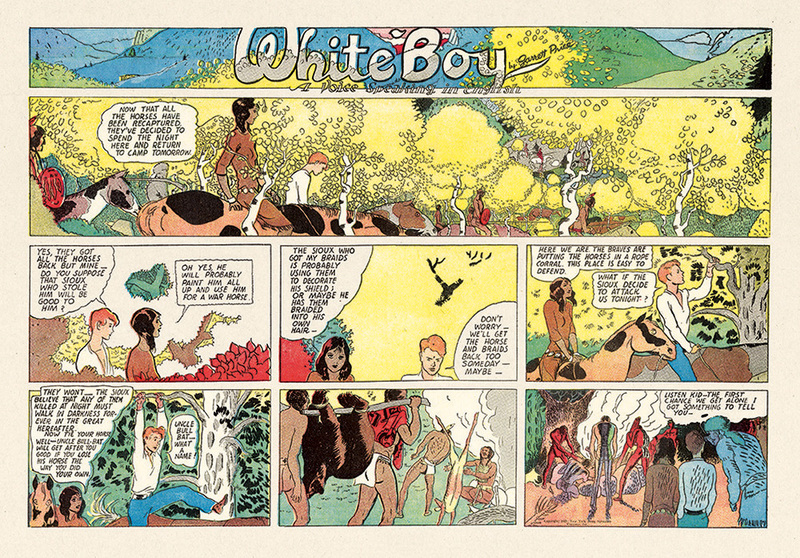 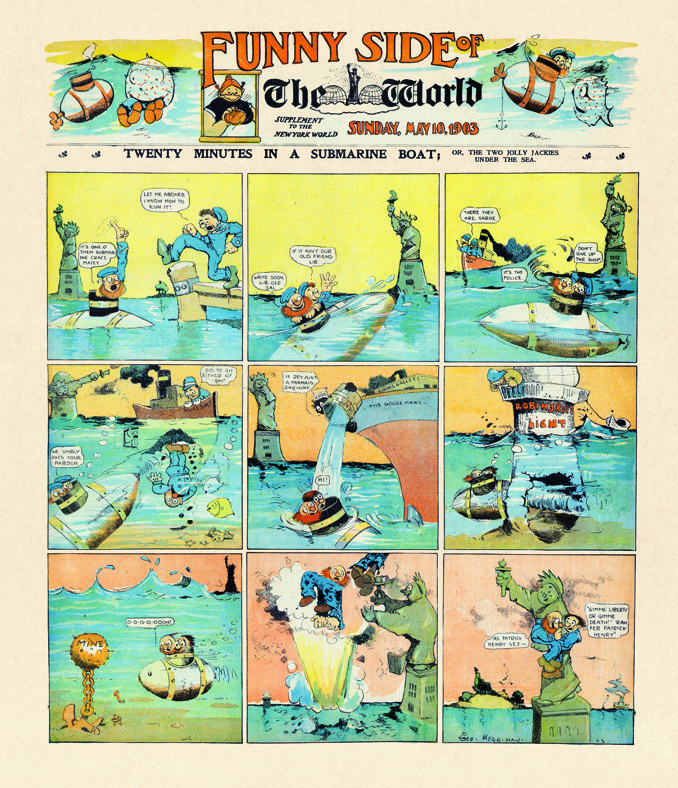 This book, originally planned to be simply a reprinting of the Upside-Downs comic strip, grew to feature the full spectrum of the artist's work. 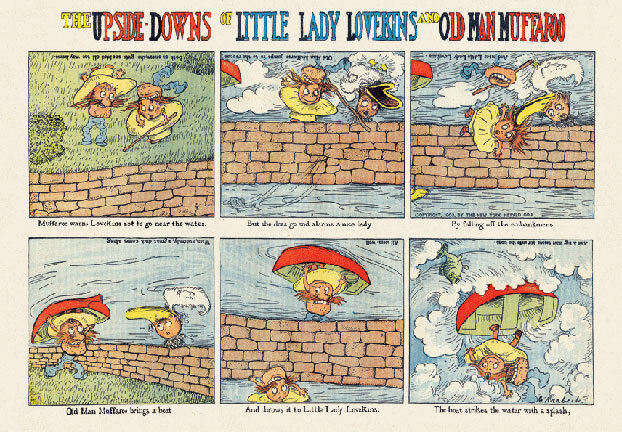 The Upside-Downs of Little Lady Lovekins and Old Man Muffaroo - such inspired lunacy! 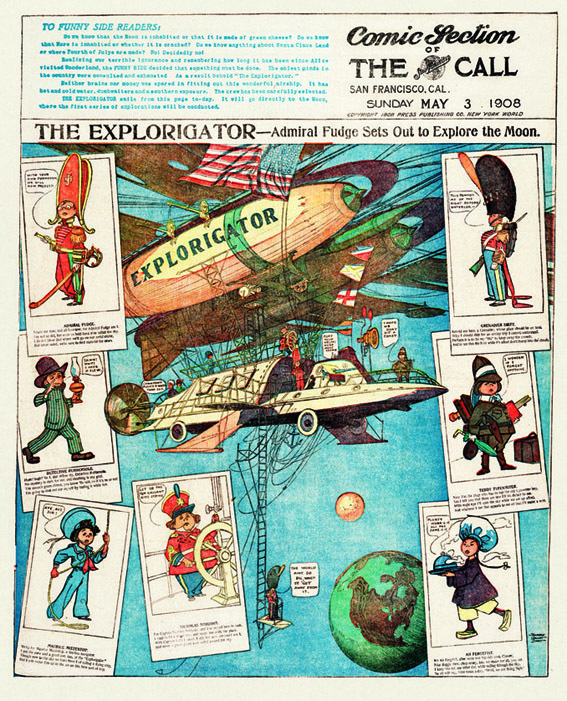 To be able to create one of these fascinating stories is amazing enough, but to do it every week for nearly 18 months is mind-boggling. 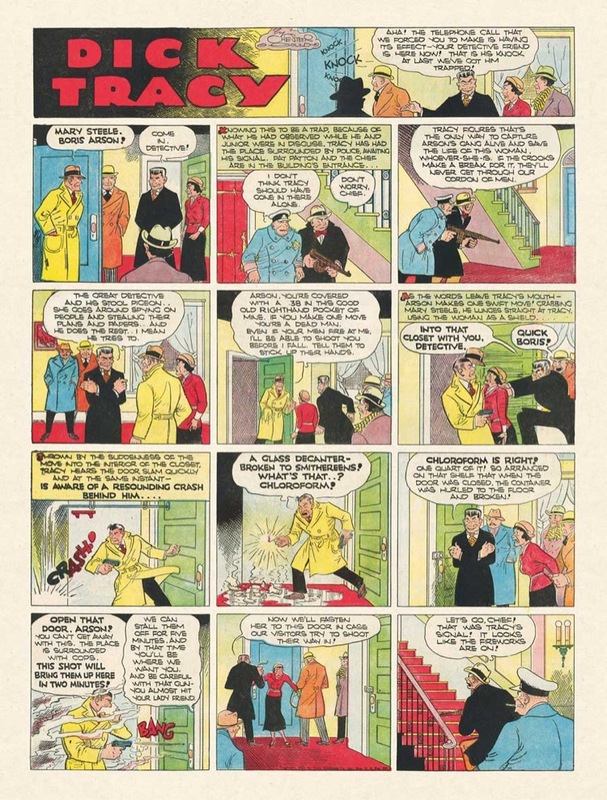 But these were not his first such comics. 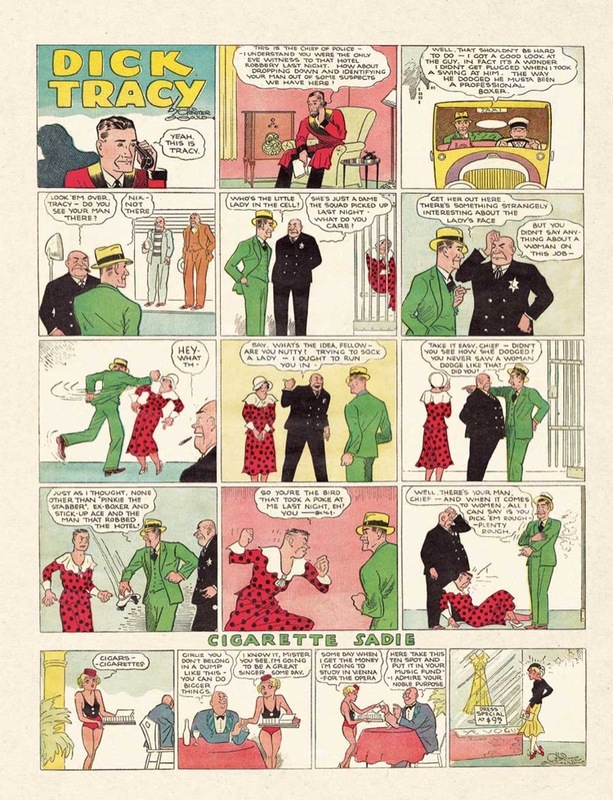 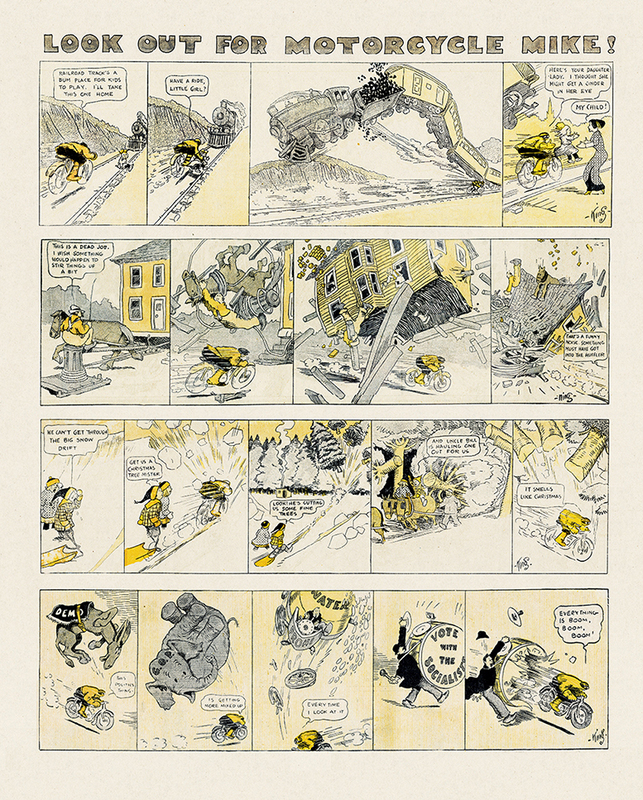 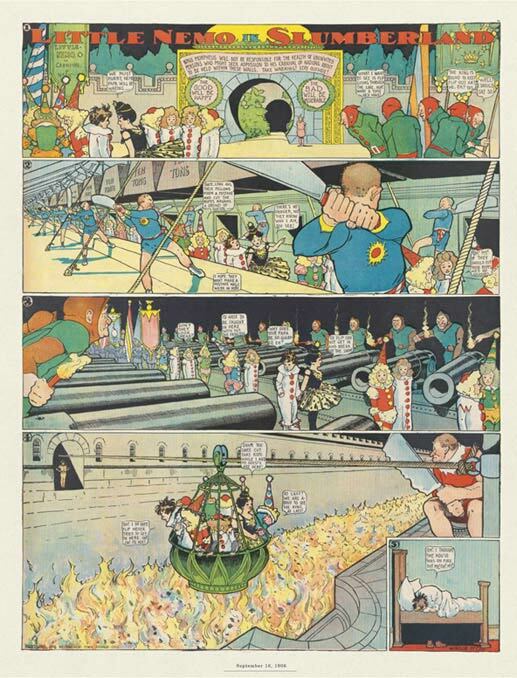 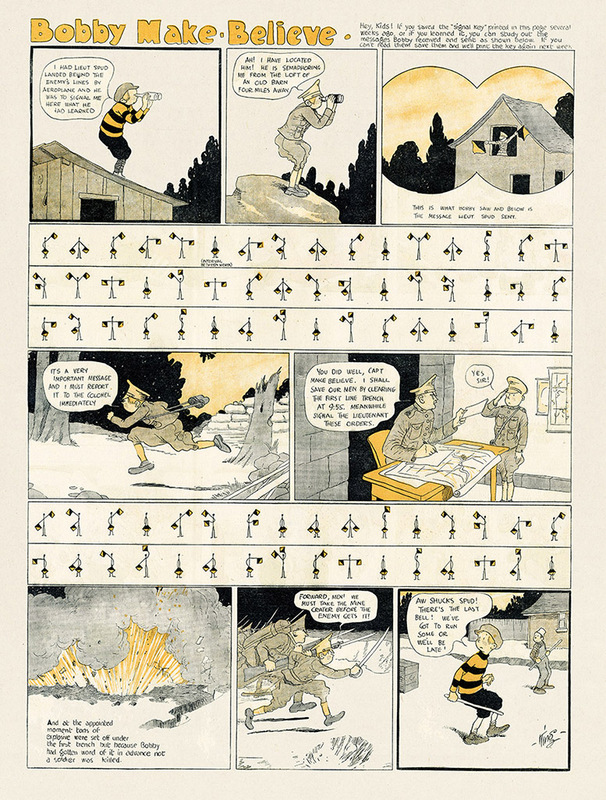 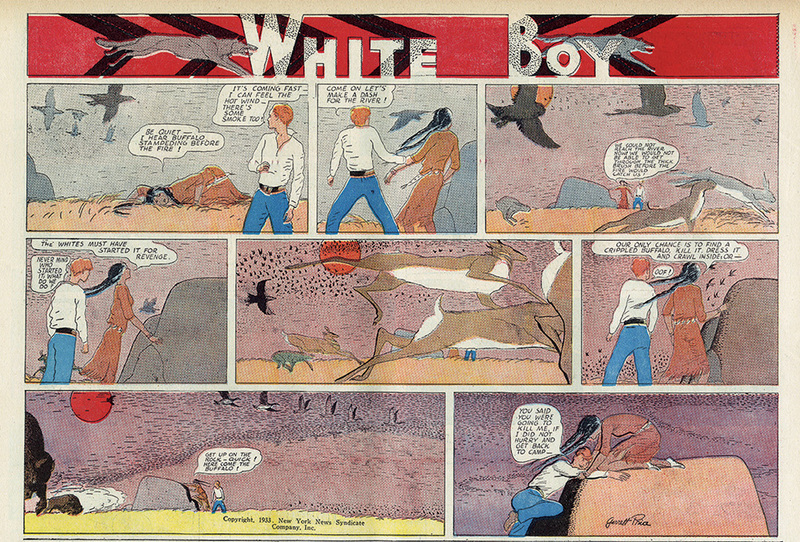 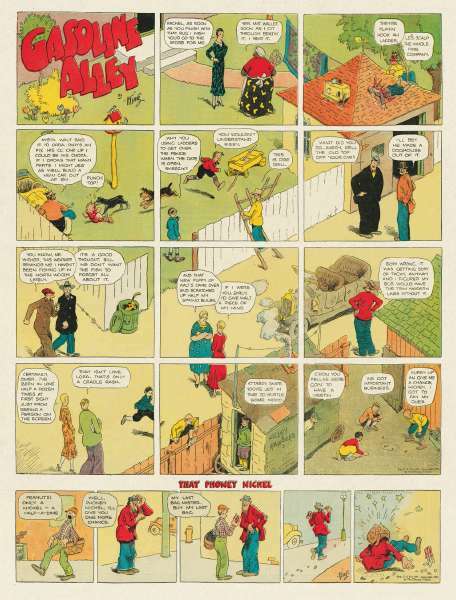 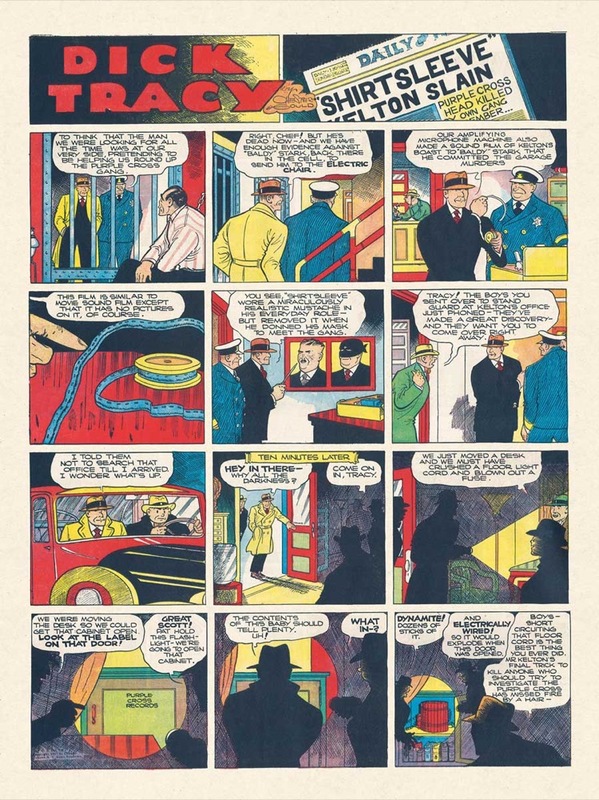 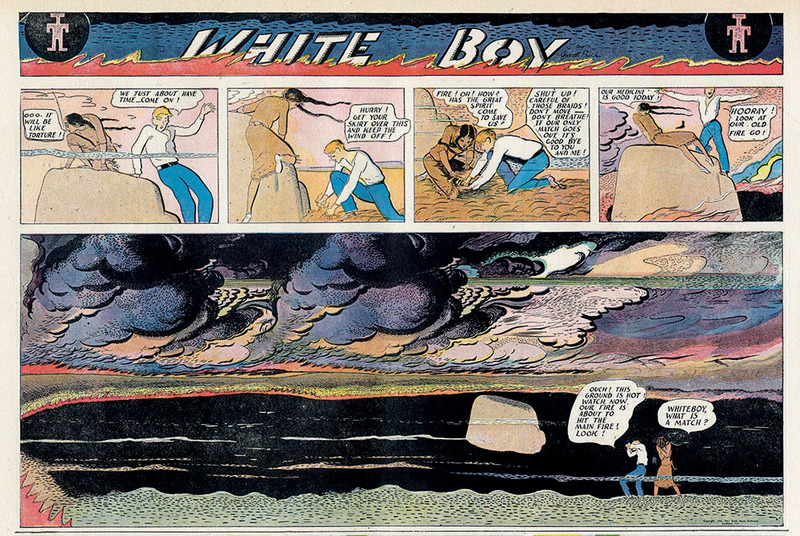 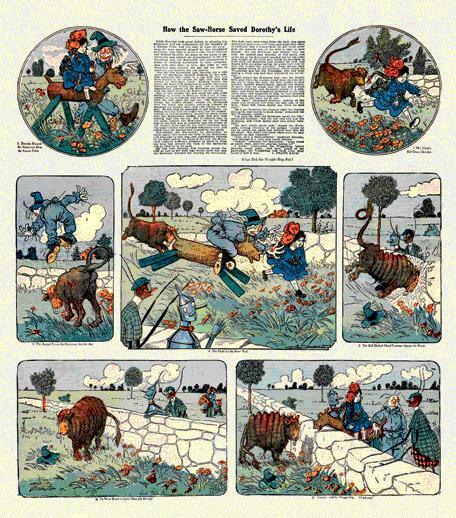 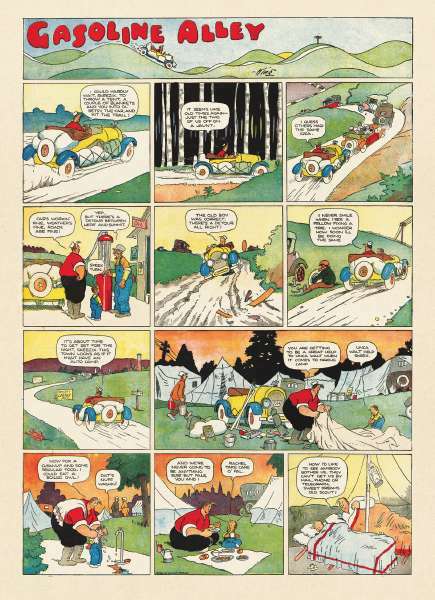 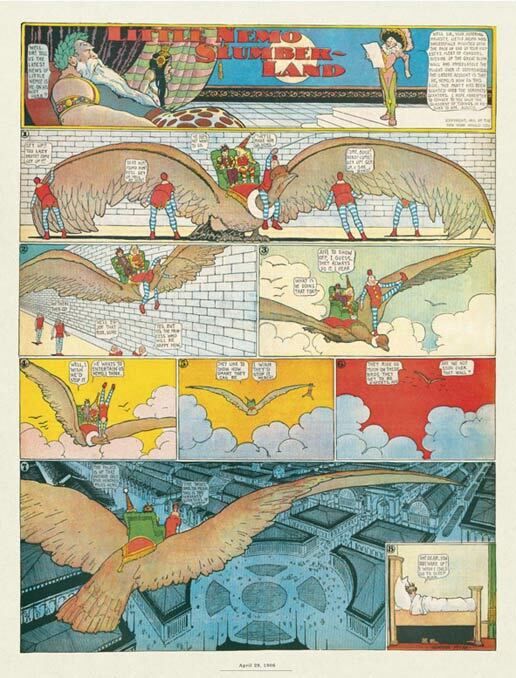 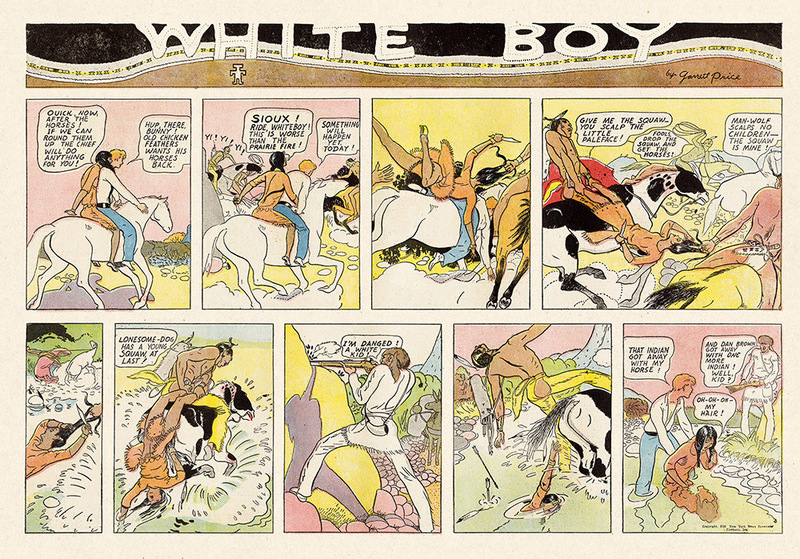 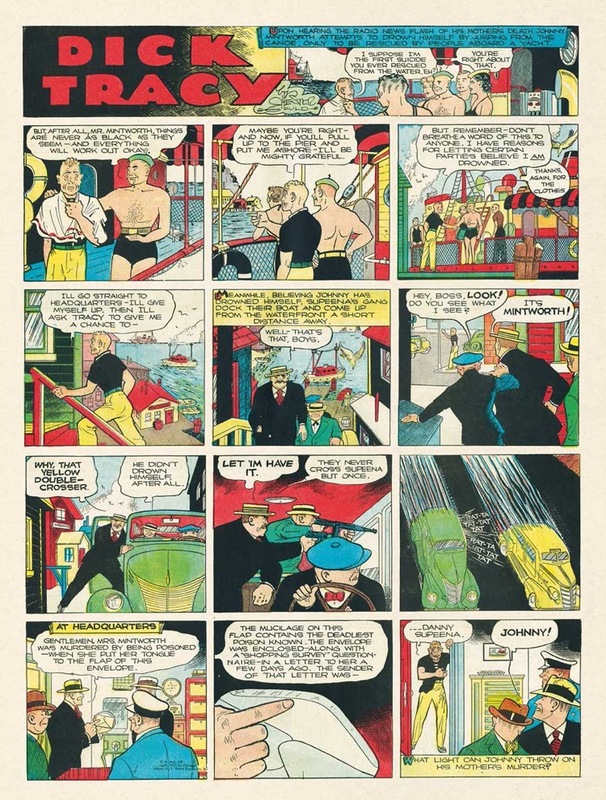 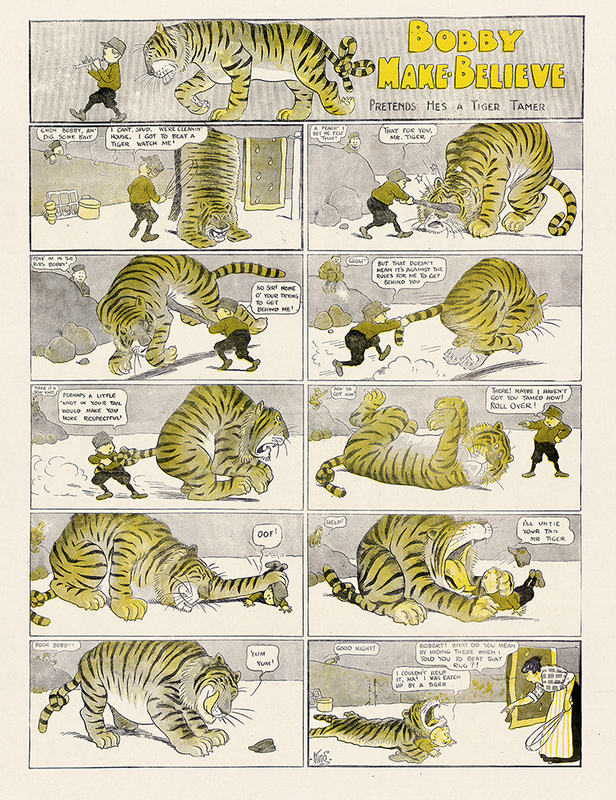 Looking at the work Verbeek did in France in the early 1890's, predating what was considered the birth of American comic strips, one can see his talent with illusion and visual irony. 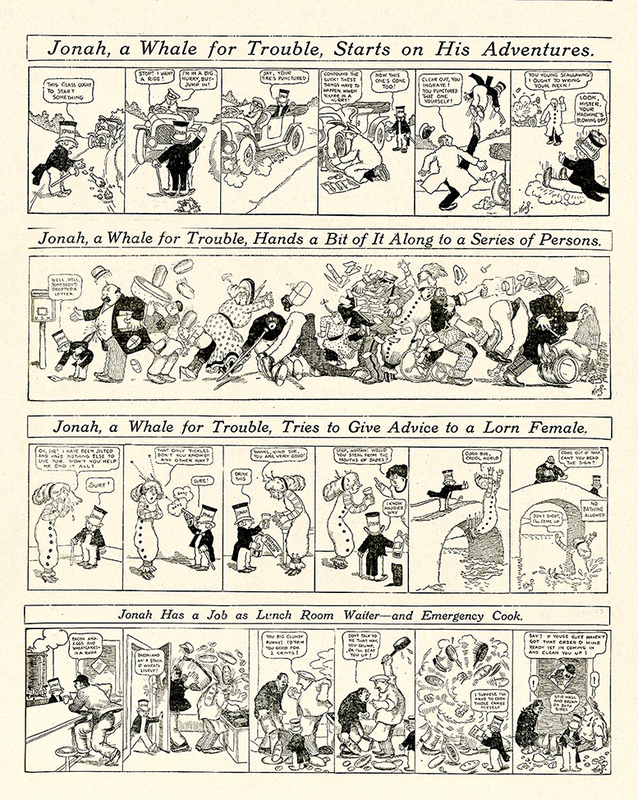 His other works for the New York Herald: Andiron Tales, The Loony Lyrics of Lulu, and The Terrors of the Tiny Tads, demonstrate his influence, direct or indirect, on artists who followed. 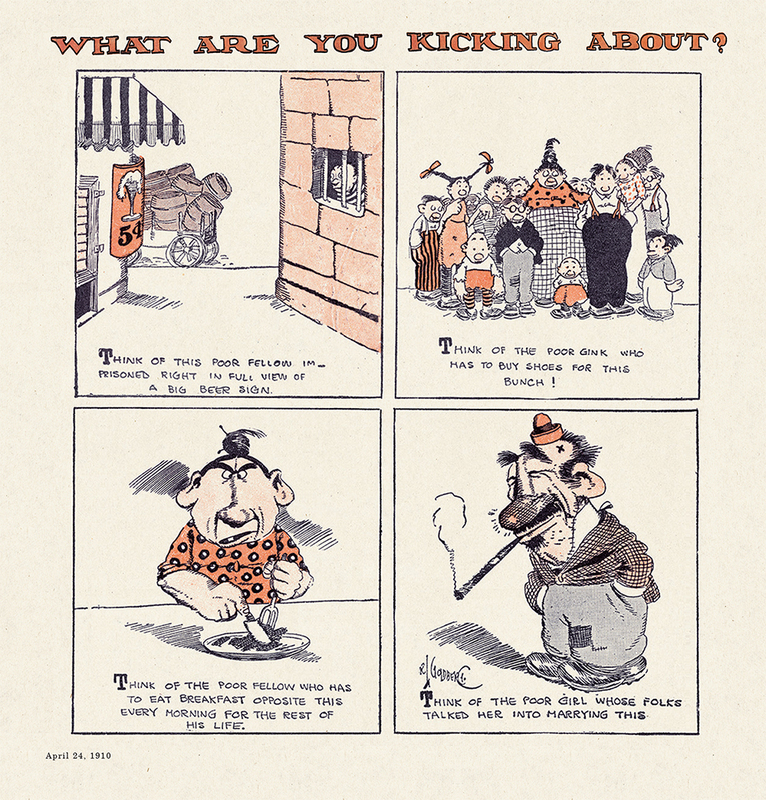 Early work by Dr. Seuss, Maurice Sendak, even Charles Schulz, all have bits of Verbeek in their style and sentiment. 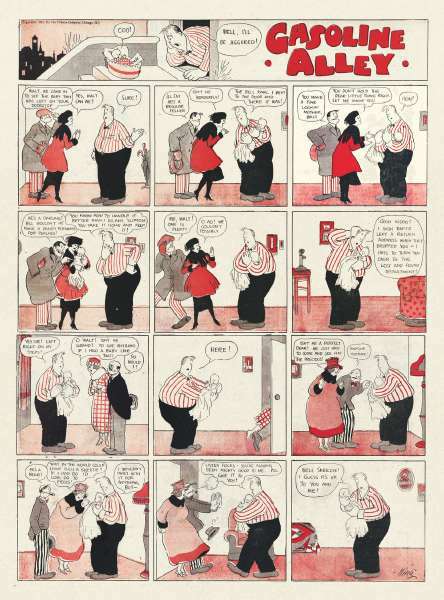 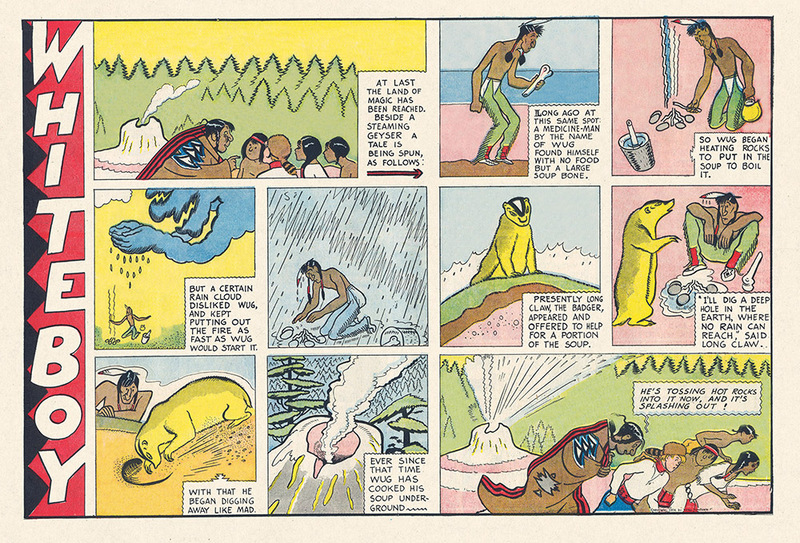 Despite their "nonsense" style, Verbeek's comics often touch on serious social issues. 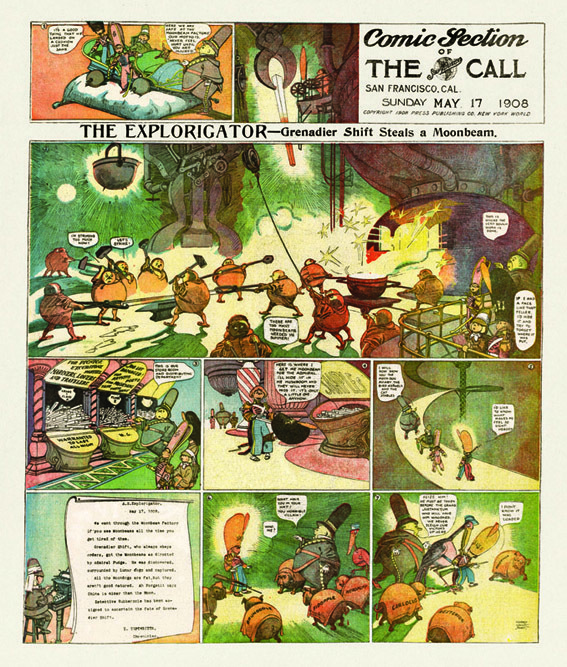 The final Upside-Downs page expresses a true antiwar statement with Russian-looking soldiers fighting a colony of dwarves, this at the height of the brutal Russo-Japanese War in the winter of 1905. 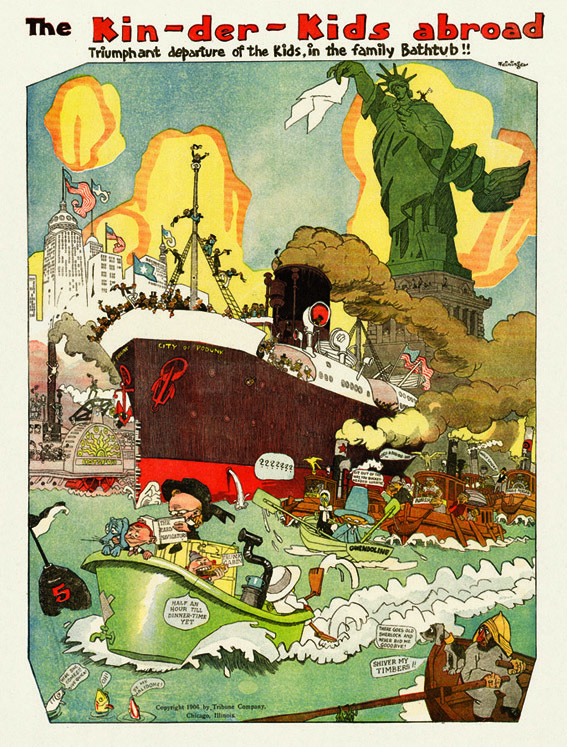 He takes a less "liberal" stance in 1914 when the Tiny Tads take on women's voting rights by tossing overboard some arrogant suffragettes. 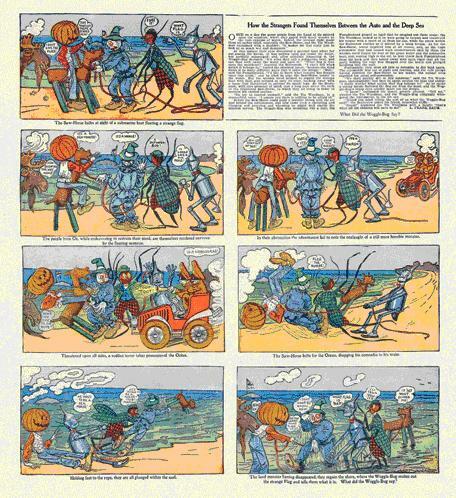 As with our other Sunday Press volumes, these pages have been restored and printed to approximate the look of their appearance in the Sunday newspapers over 100 years ago. 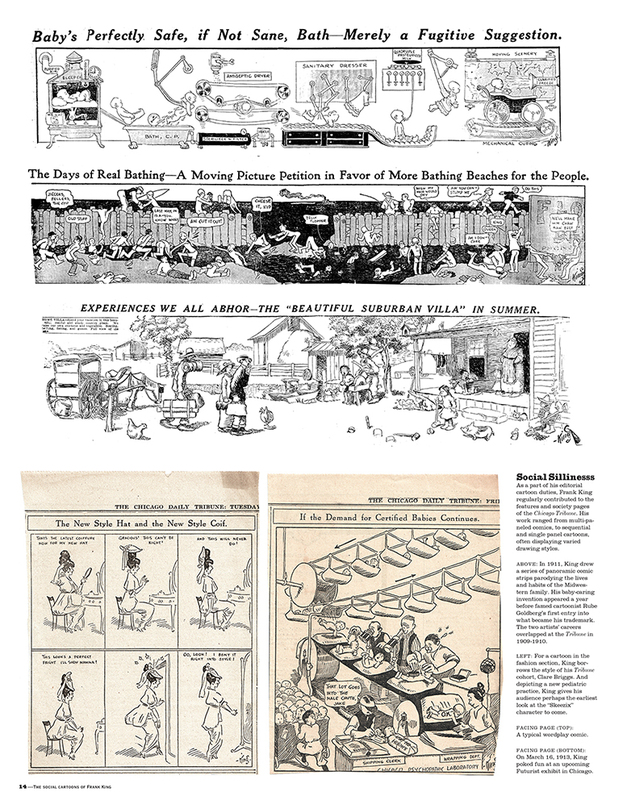 The ravages of time on old newsprint, such as stains, excessive yellowing, and tears, have been repaired. 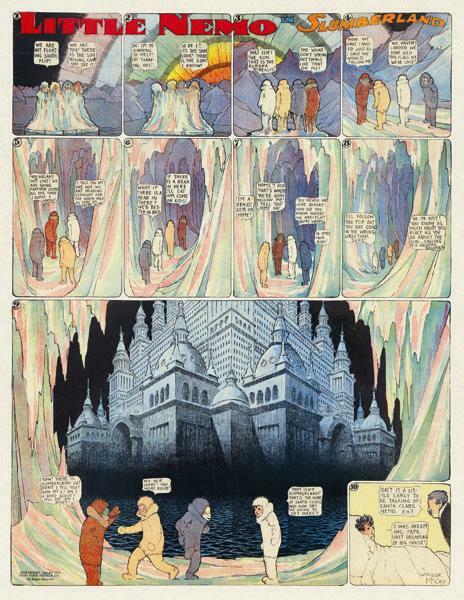 Many of the natural flaws, such a bleed-through, off-register colors, ink smudges, and paper irregularities, remain. 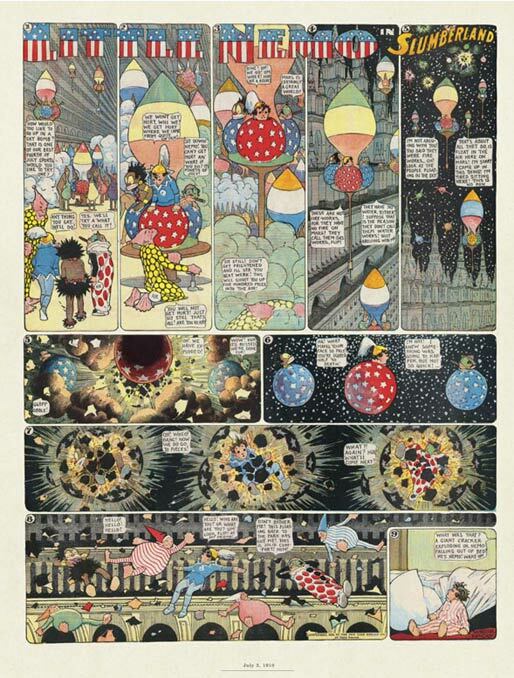 So step back into another time, find a large area for turning the book upside-down time and again, and enjoy the unique and fascinating world of Gustave Verbeek.
. . . 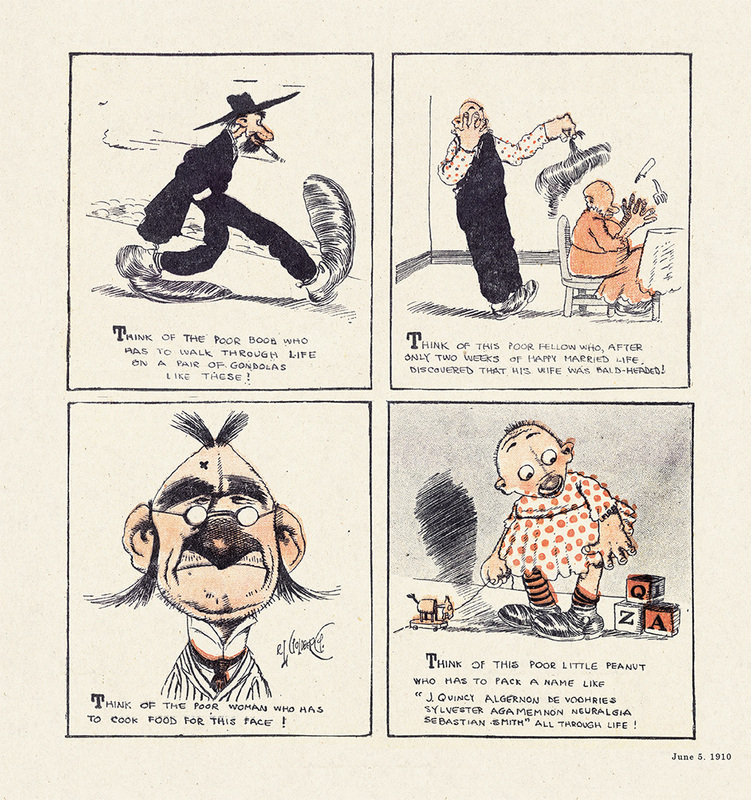 In the nineteenth century, political cartoonists were fond of drawing pictures of despised politicians who turned into pigs or jackasses when upside down. 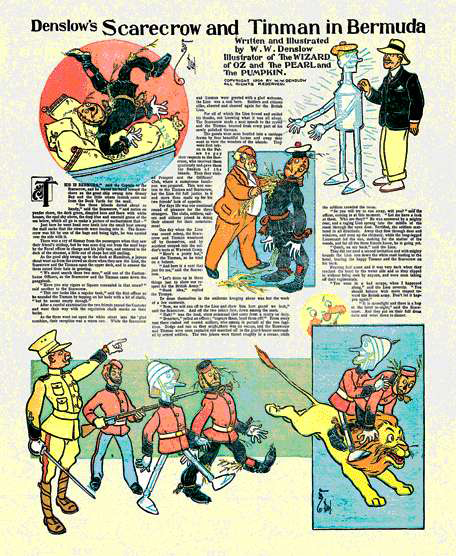 Life, in the September 18, 1950 issue, reproduced an Italian poster on which the face of Garibaldi became Stalin upside down! 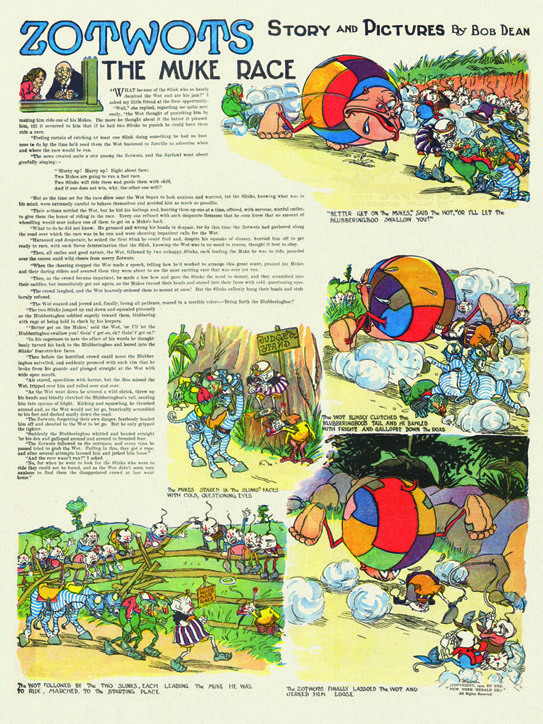 The back of the November 23, 1953 issue was an ad that showed an Indian Brave inspecting corn. 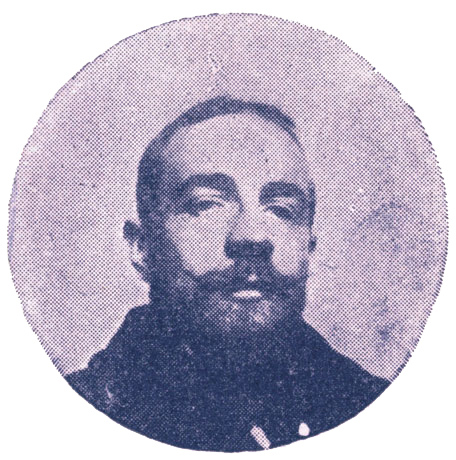 Inverted, the picture became a man's face. 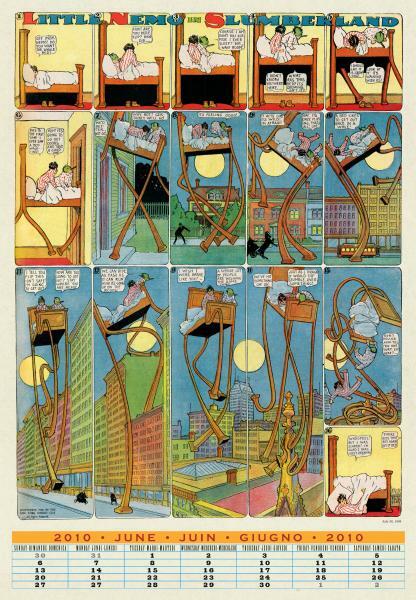 . . .We come now to the Dutch cartoonist Gustave Verbeek, who carried upside down art to unbelievable heights. 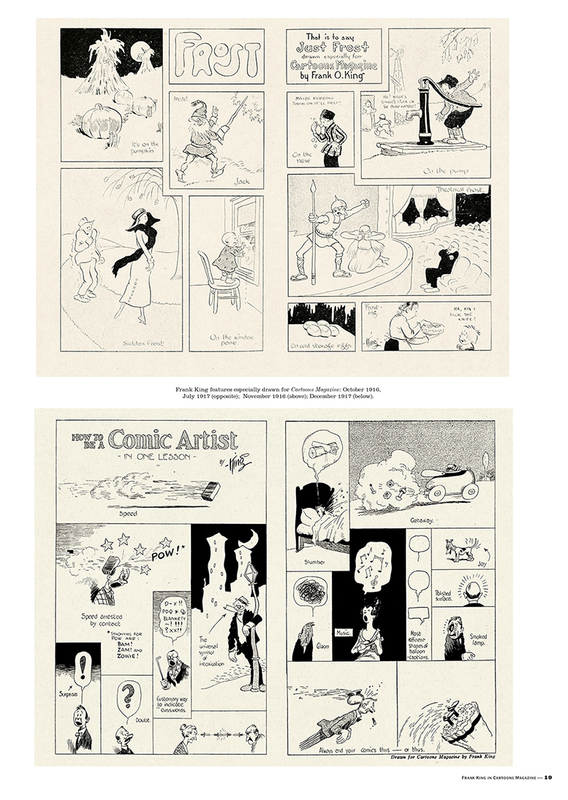 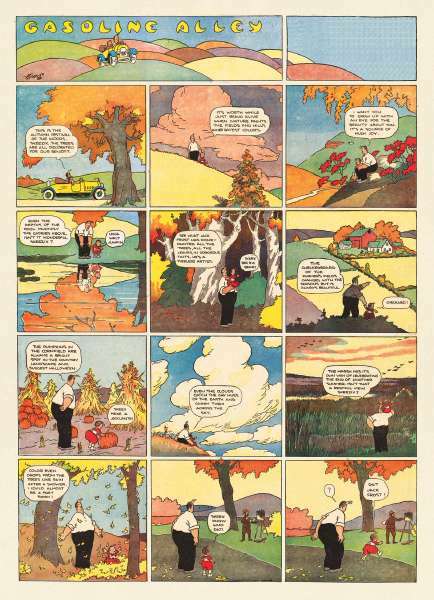 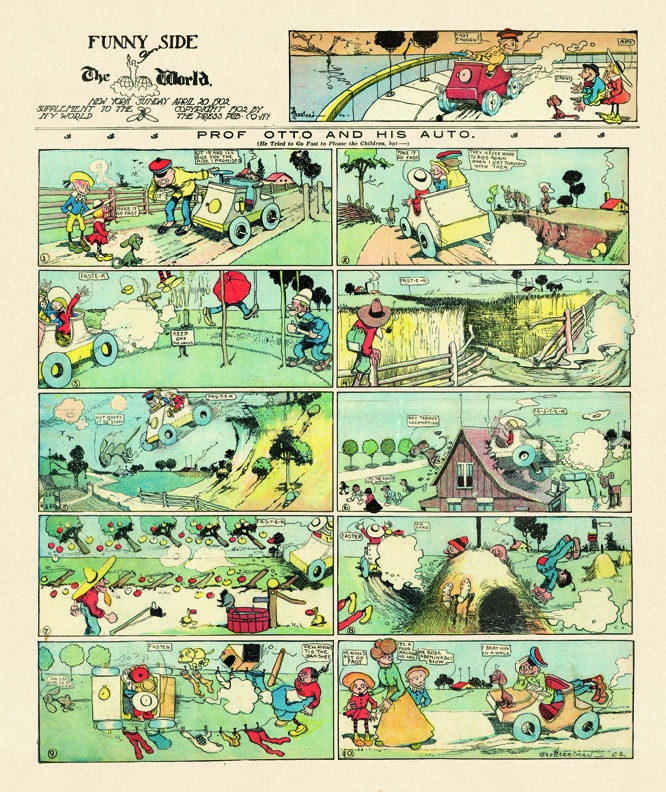 For 64 weeks he produced a Sunday comic strip for The New York Herald . 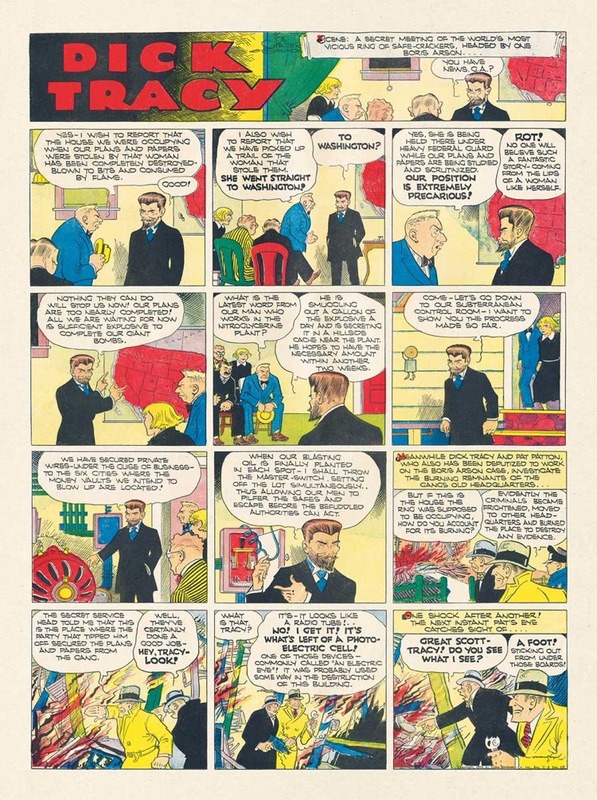 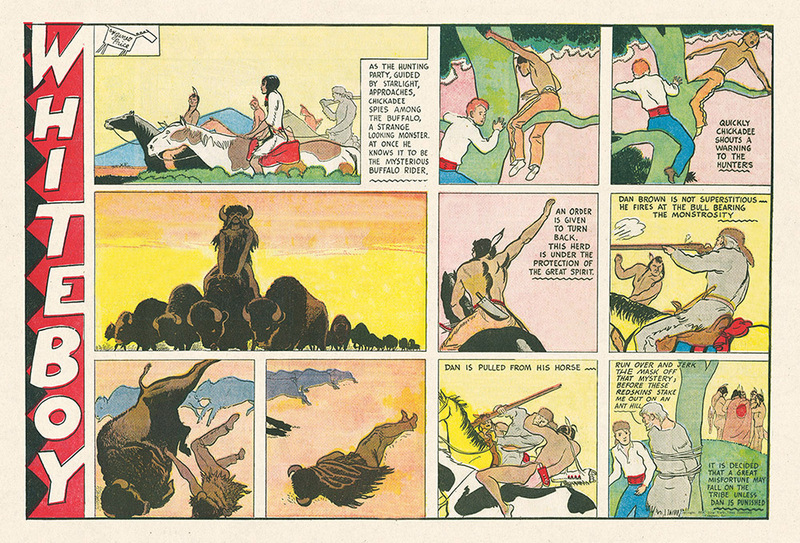 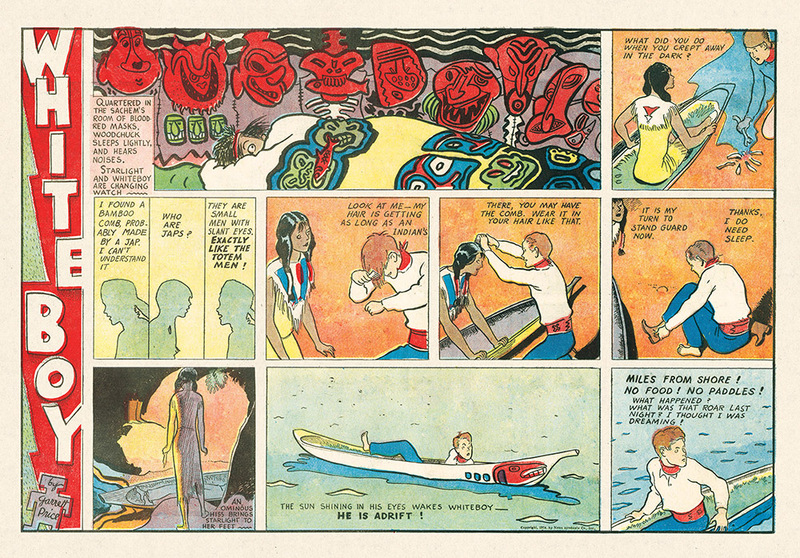 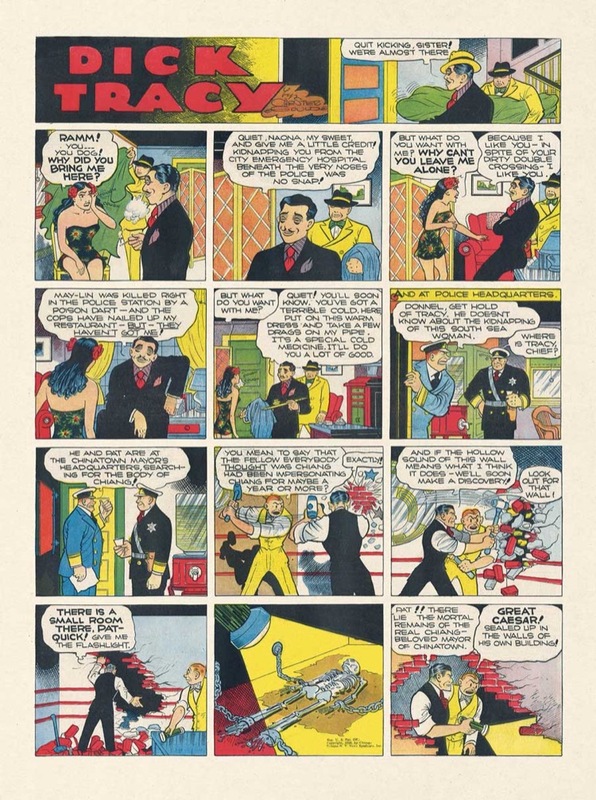 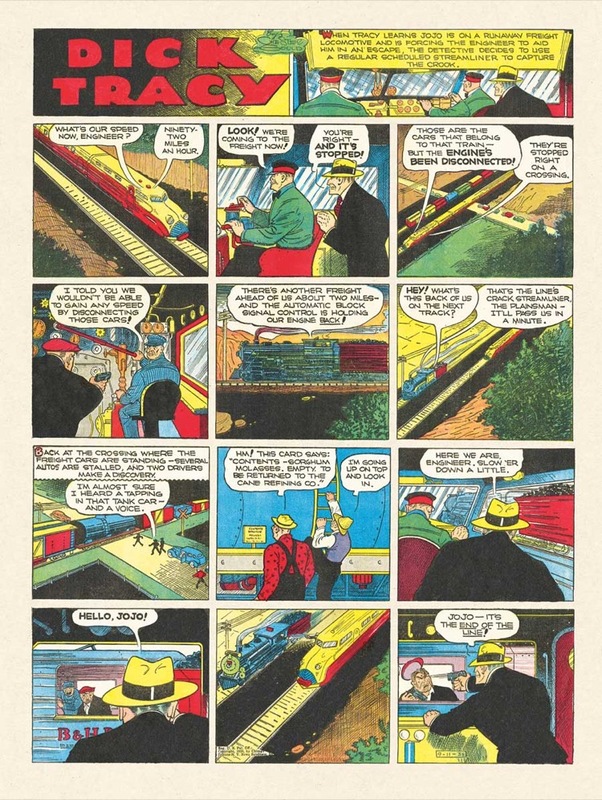 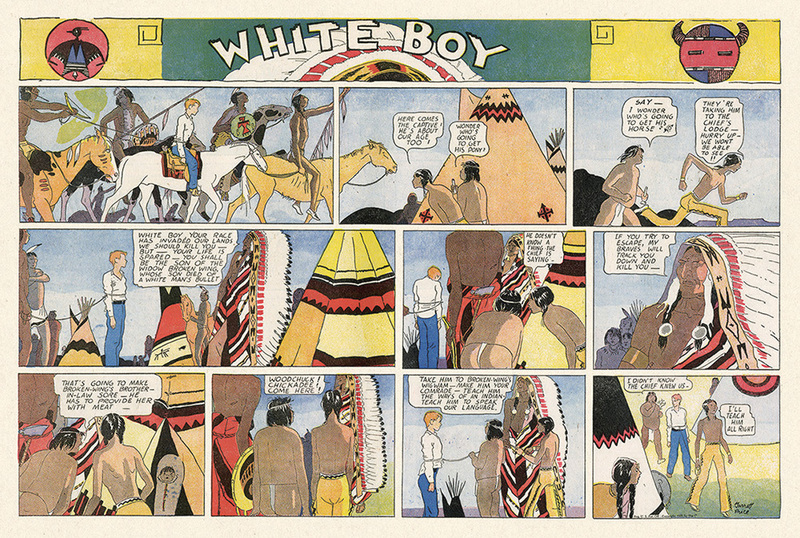 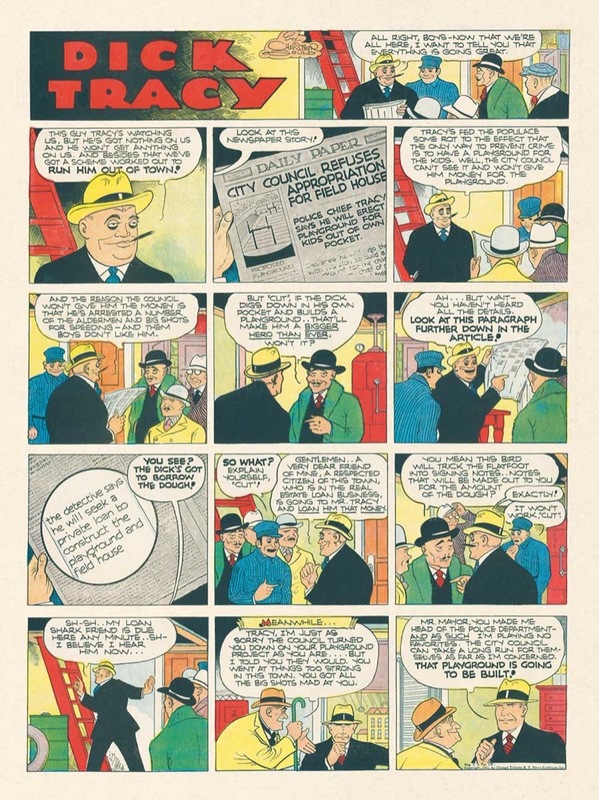 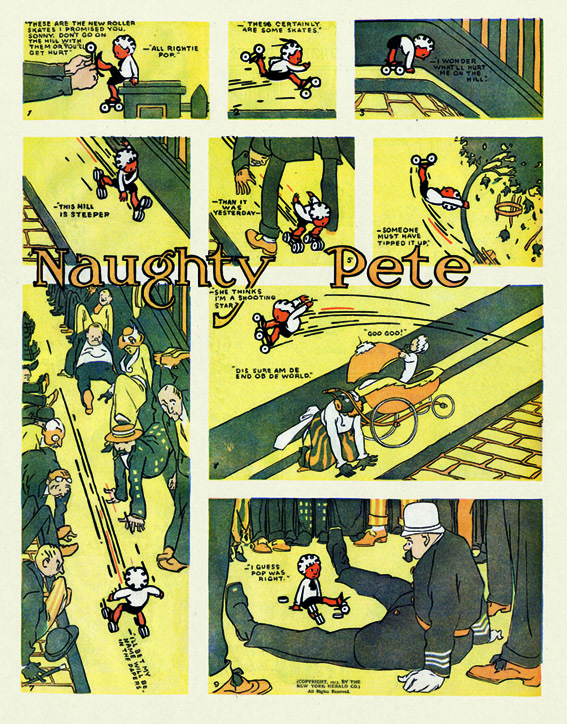 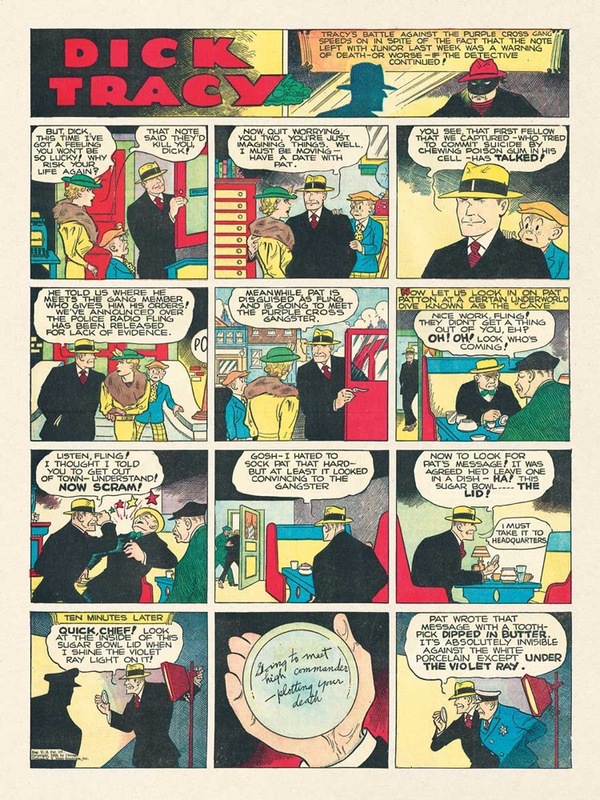 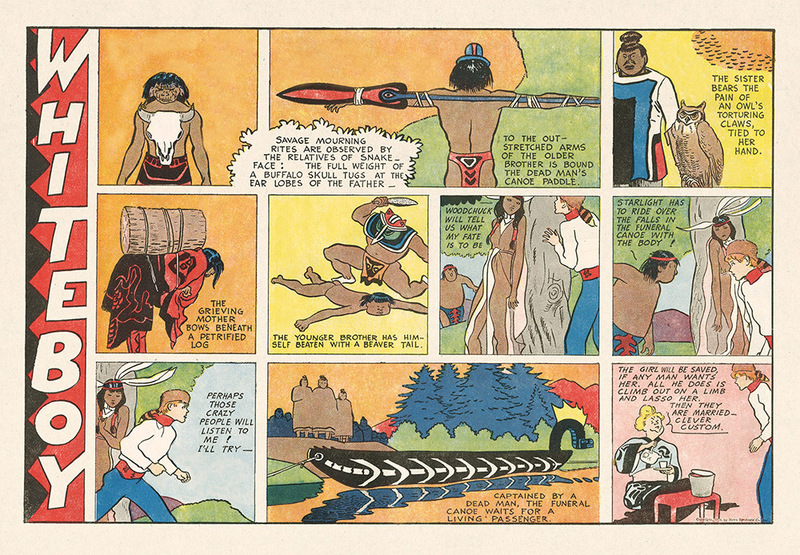 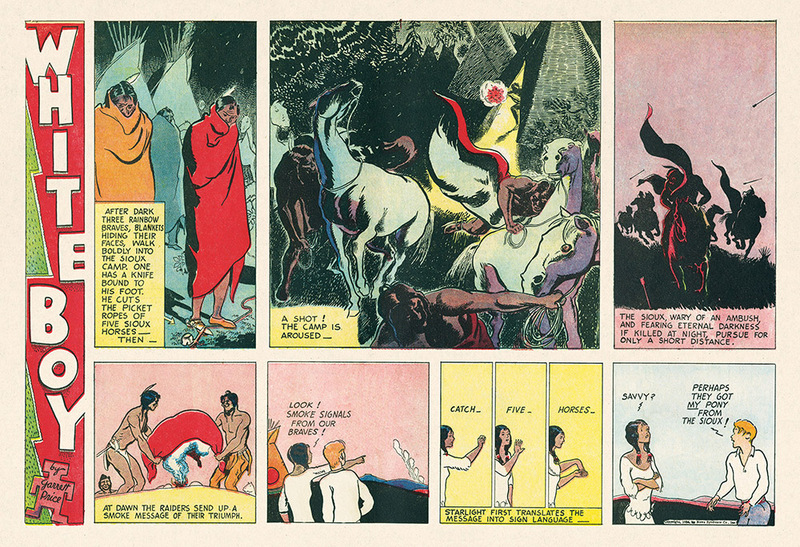 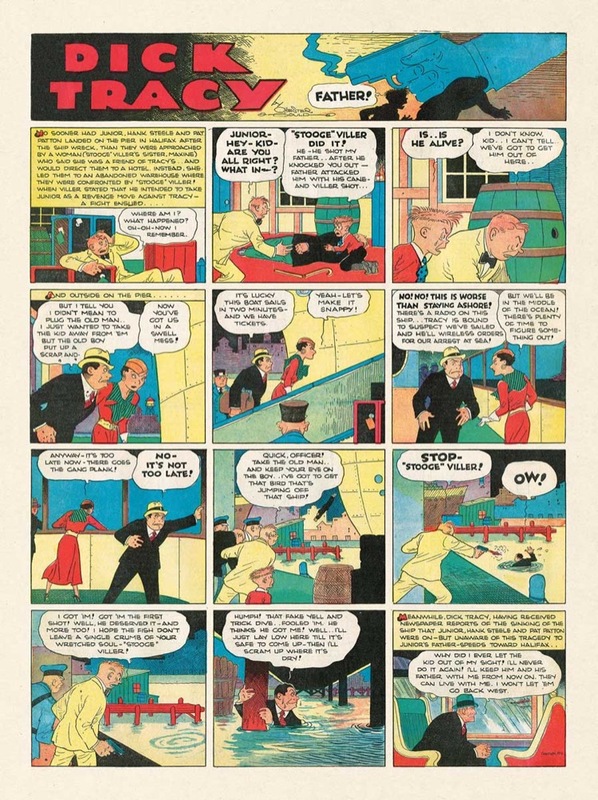 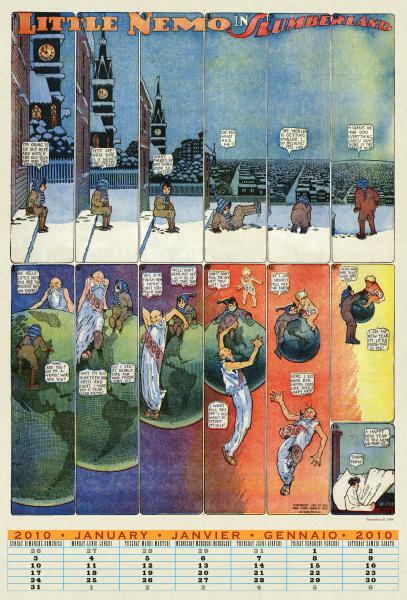 The strip consisted of six panels that illustrated a story line. 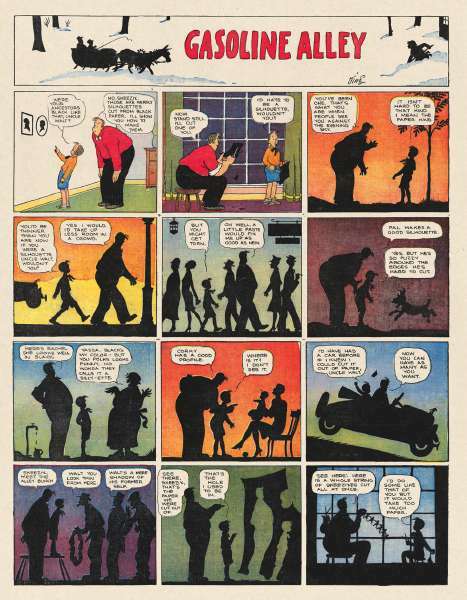 Inverted, the same six panels were different pictures that continued the story! 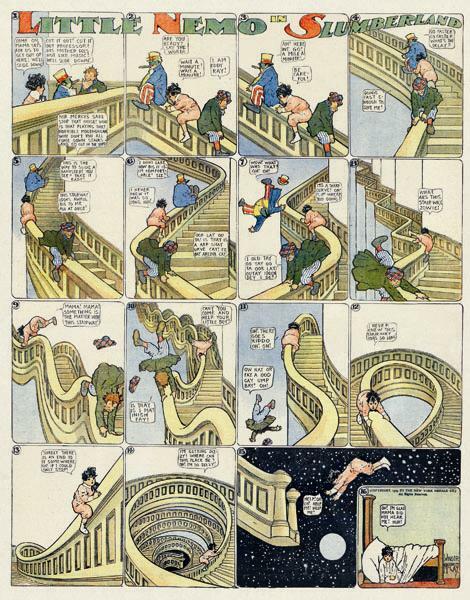 How Verbeek managed this without going mad beats me! 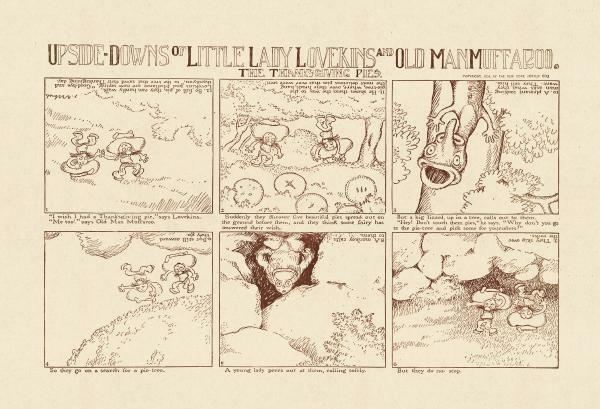 His big secret, of course, was that Old Man Mufaroo and Lady Lovekins turned into the other upside down! 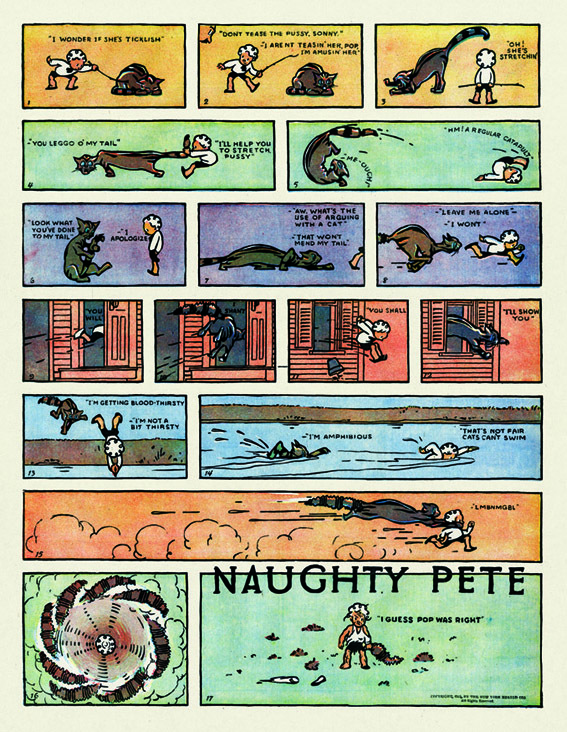 I don't know if Verbeek knew Peter Newell, but they both illustrated Mother Goose for Adults, a book of poems by Guy Wetmore Carryl. 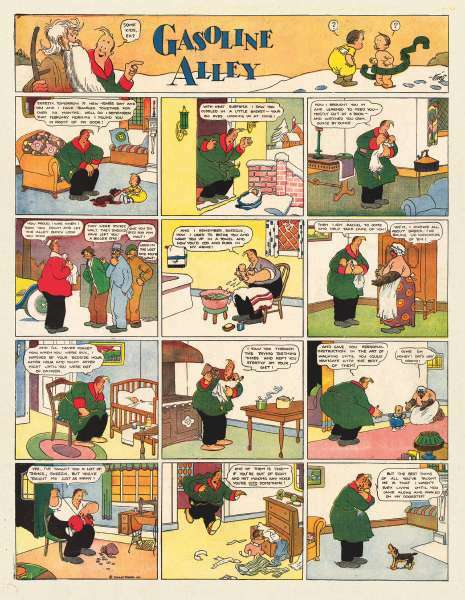 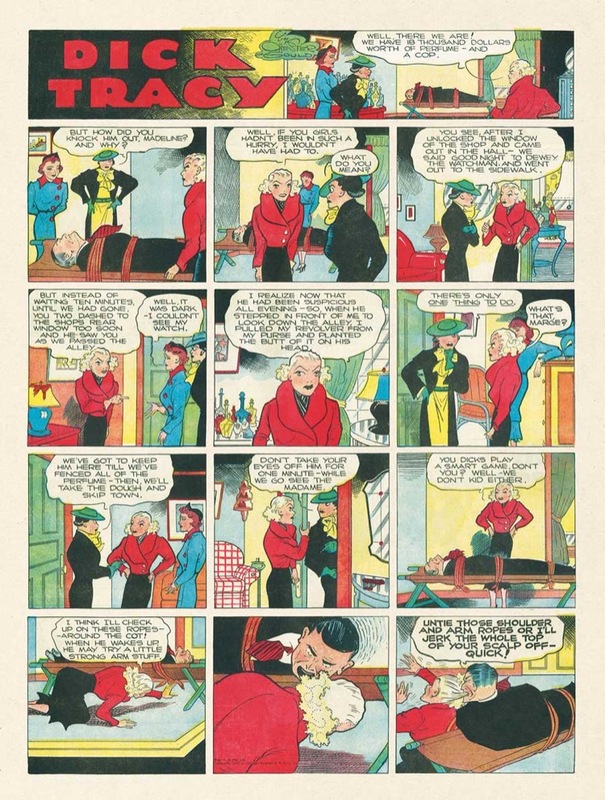 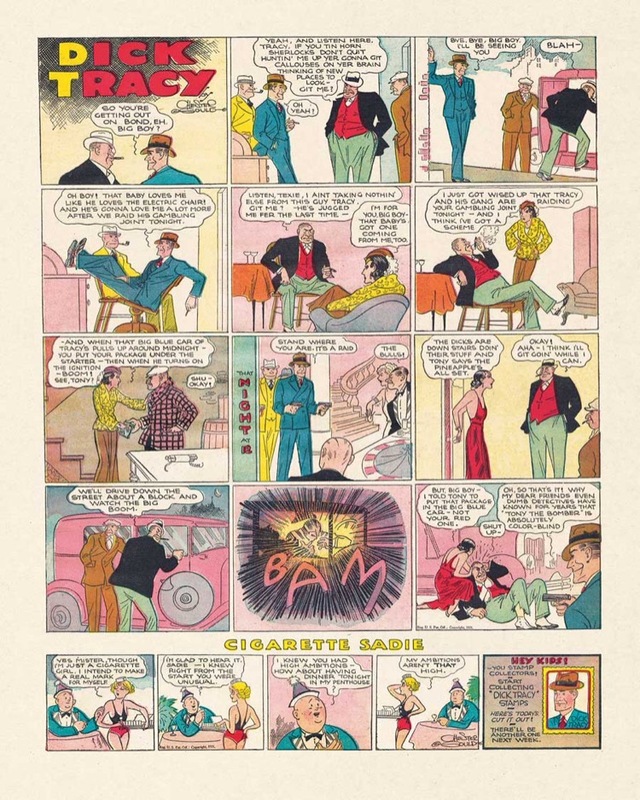 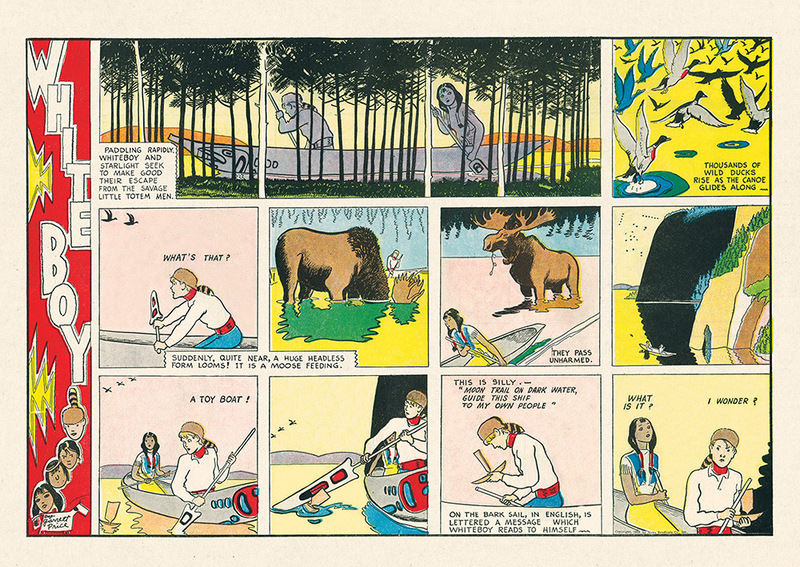 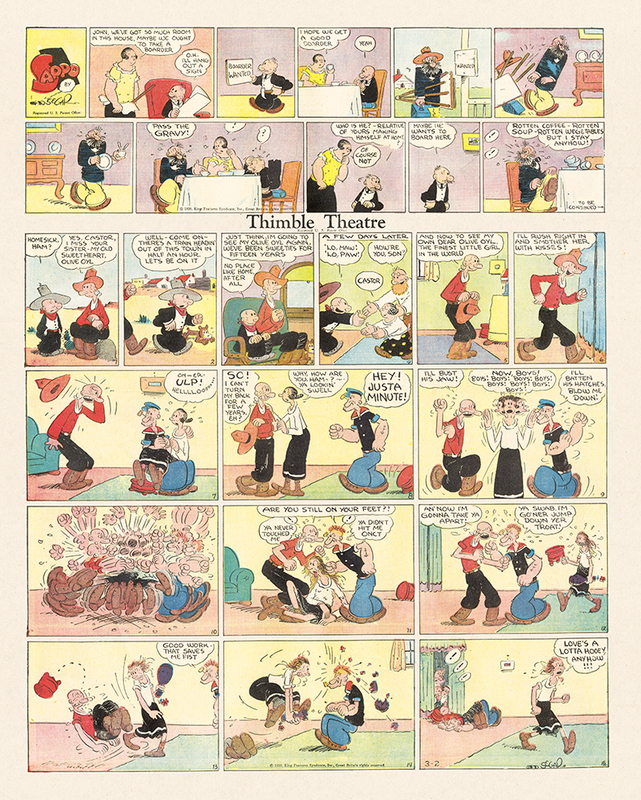 There have been earlier editions of Verbeek's amazing strips, but they contained only a fraction of them. 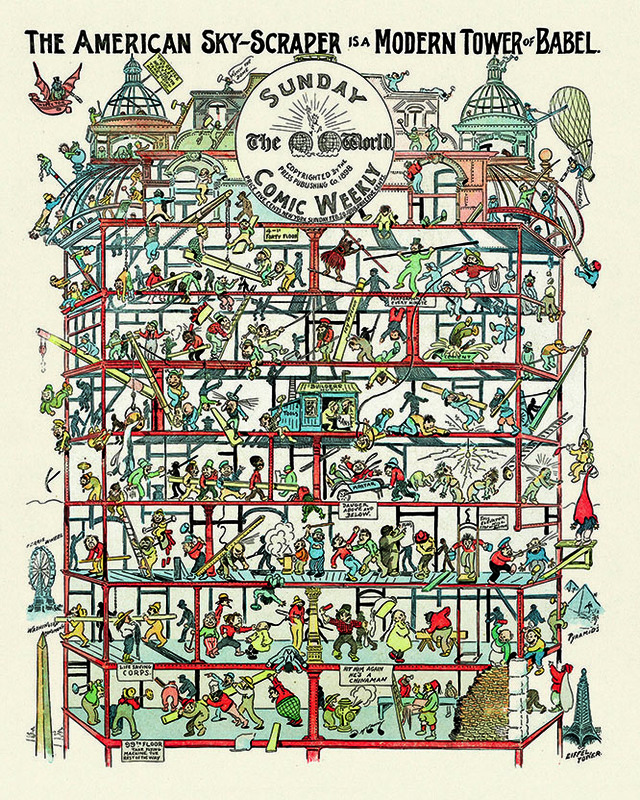 Now for the first time we have all 64, in their original color and size. 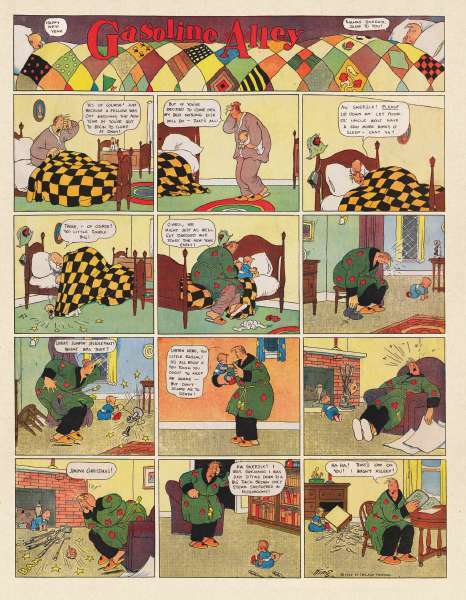 It will be a long time, if ever, before anyone comes close to duplicating Verbeek's incredible achievement. 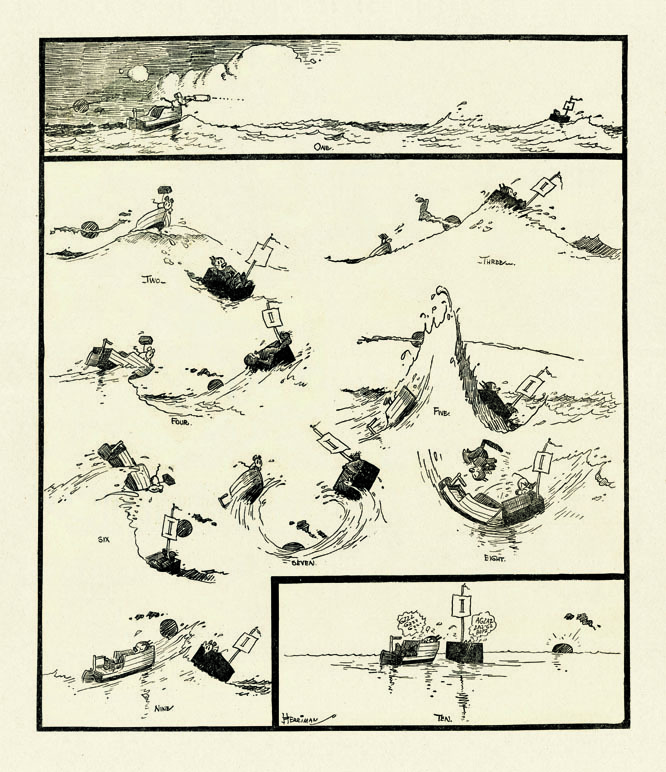 Gustave Verbeek was man of three continents, fusing the traditions of Asia, Europe, and North America in his remarkable career as a cartoonist, painter, and illustrator. 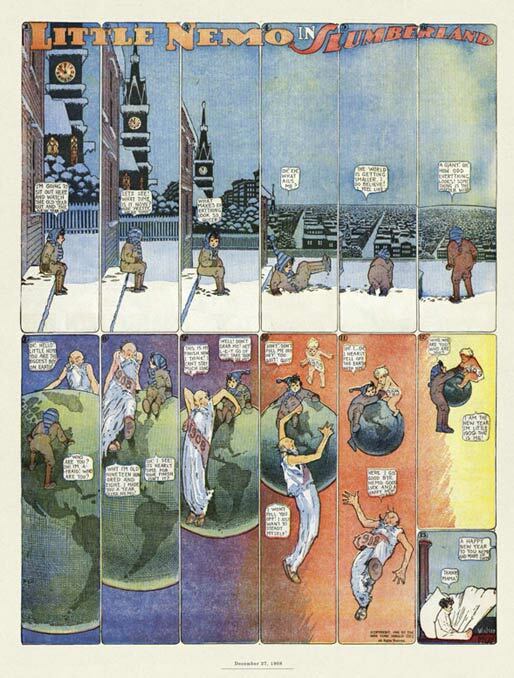 His artistic internationalism came with his birthright: he entered the world in 1867 in Nagasaki, Japan, the son of Guido Verbeck, a Dutch missionary who played a leading role in bringing Western higher education to the land of the rising sun. 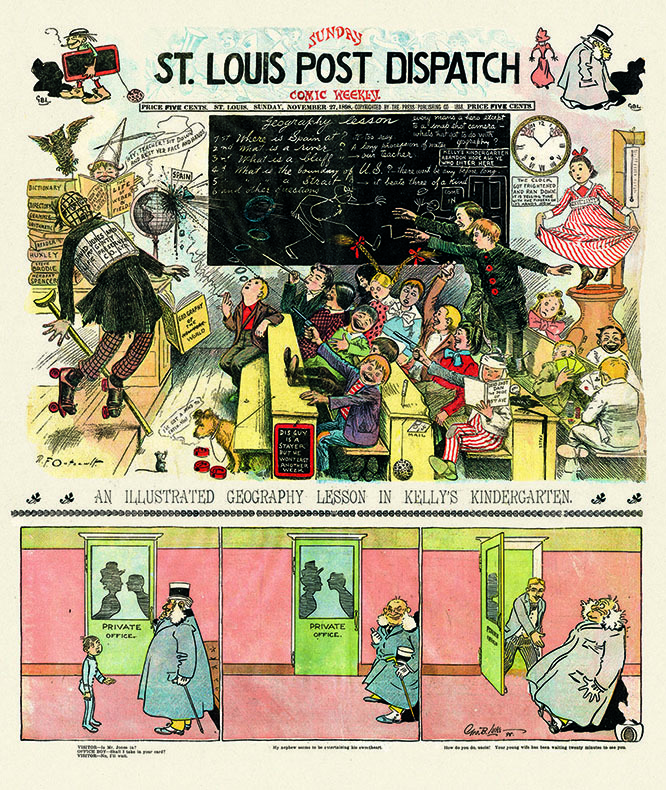 The family's name on early documents was Verbeck, but it was tweaked to Verbeek when they immigrated to the United States during Gustave's teenage years, an alteration perhaps made by the slip of an immigration official's pen. 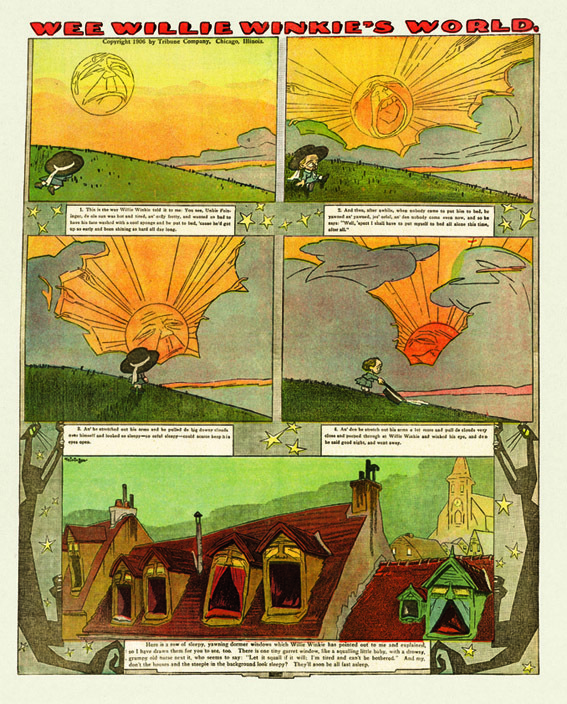 Gustave's earliest artistic education was in Japan but he would carry on his studies in San Francisco, New York, and Paris as well. 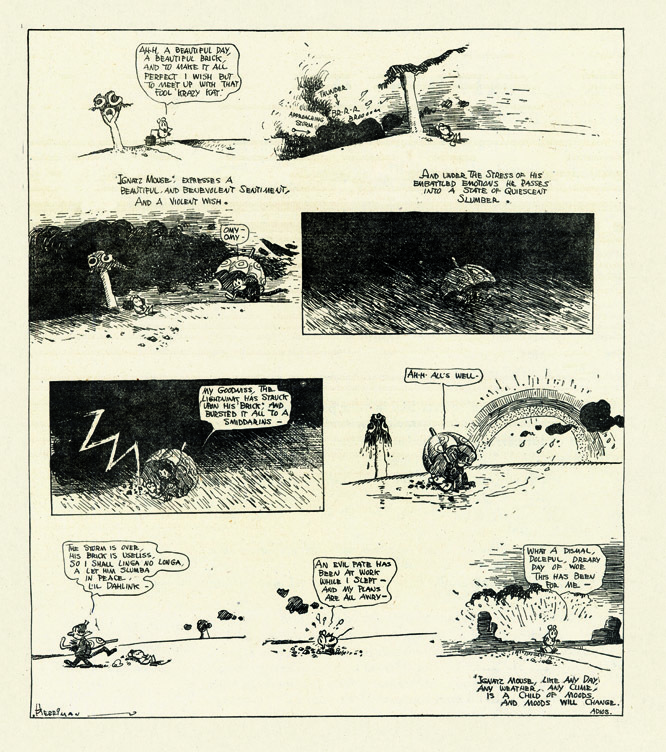 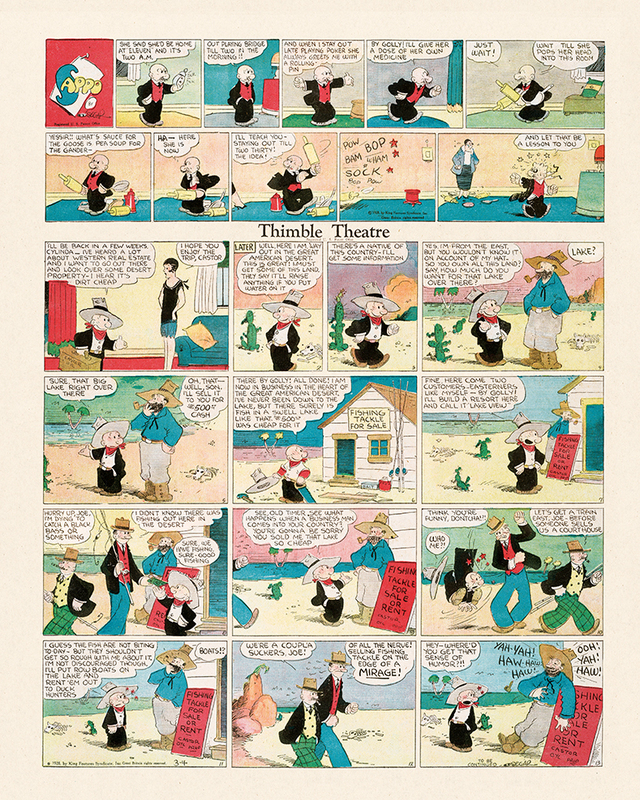 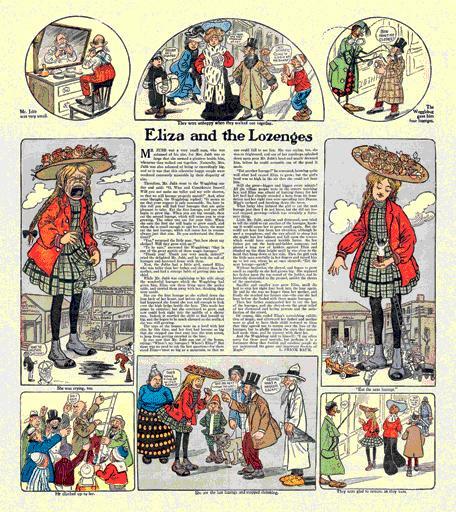 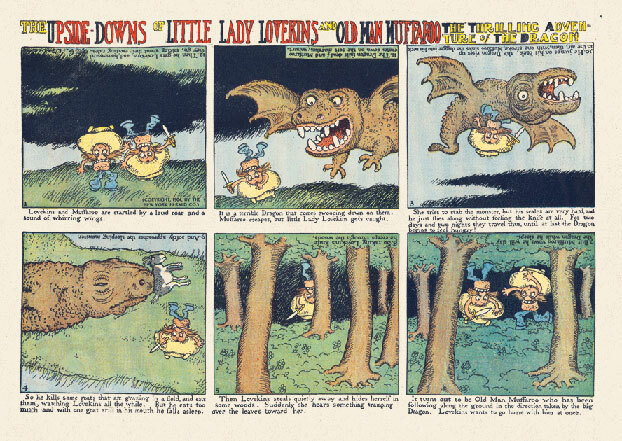 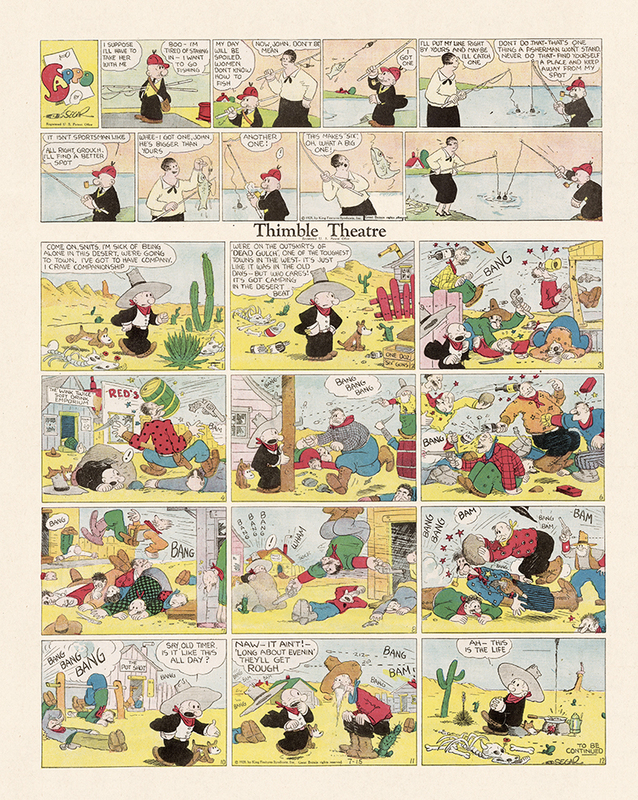 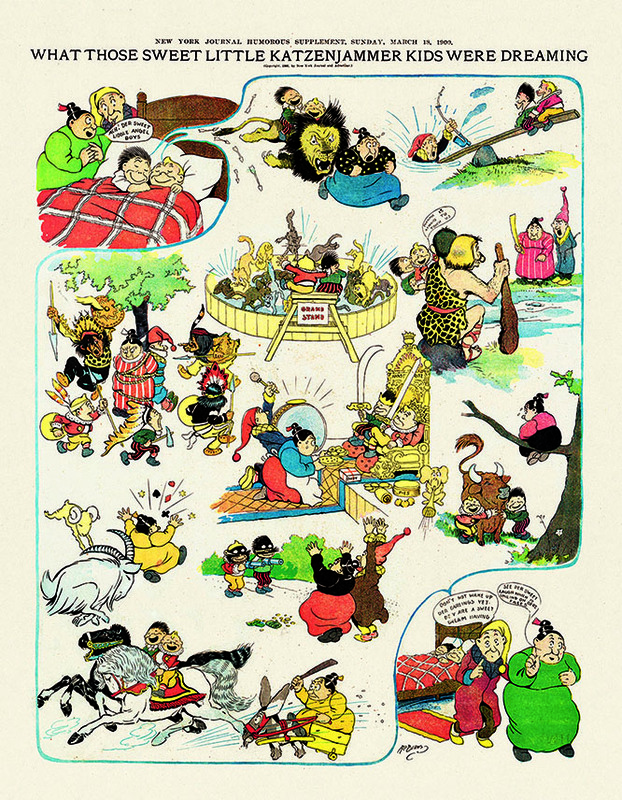 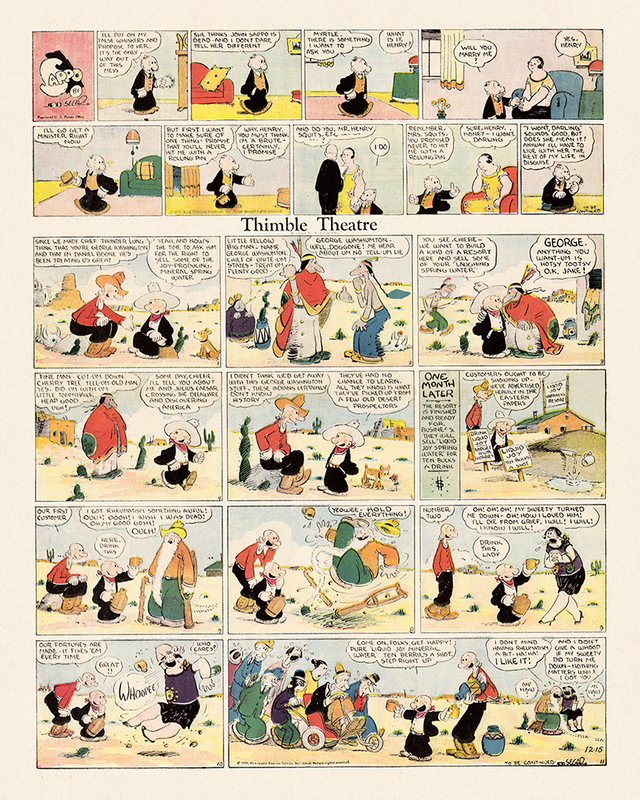 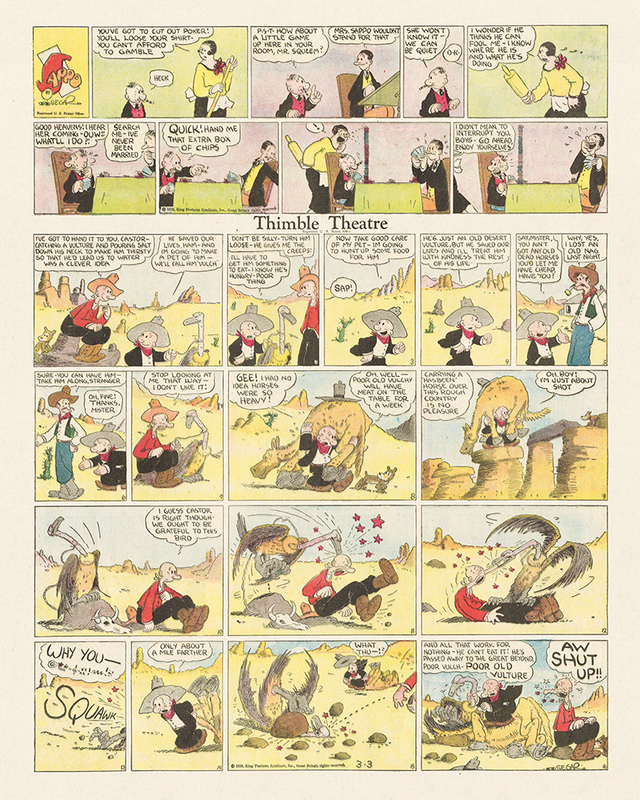 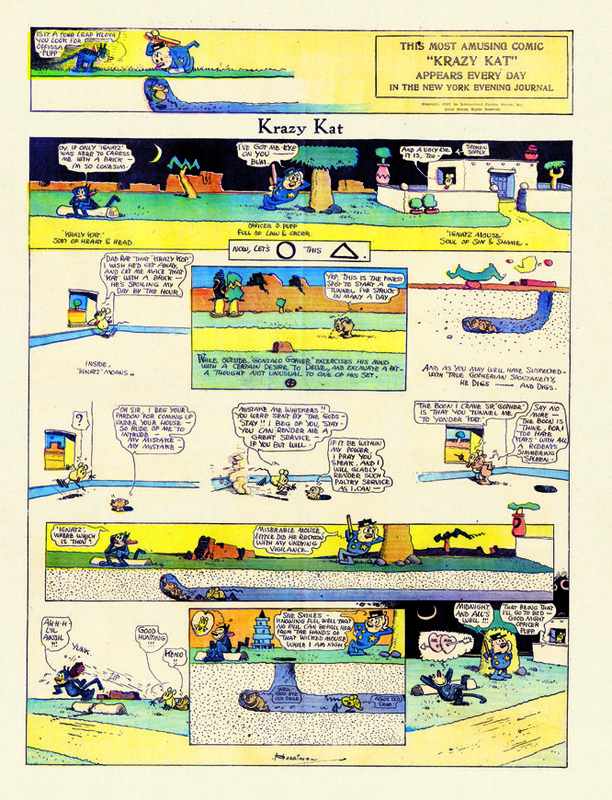 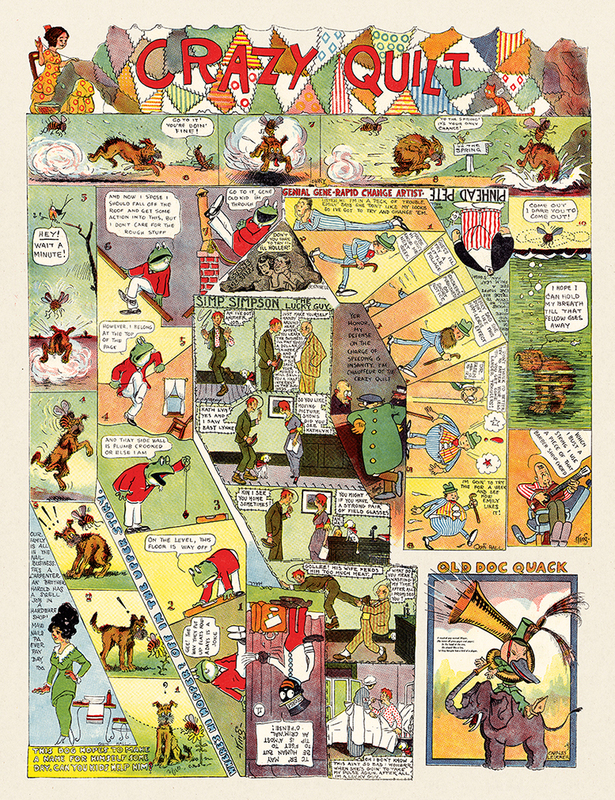 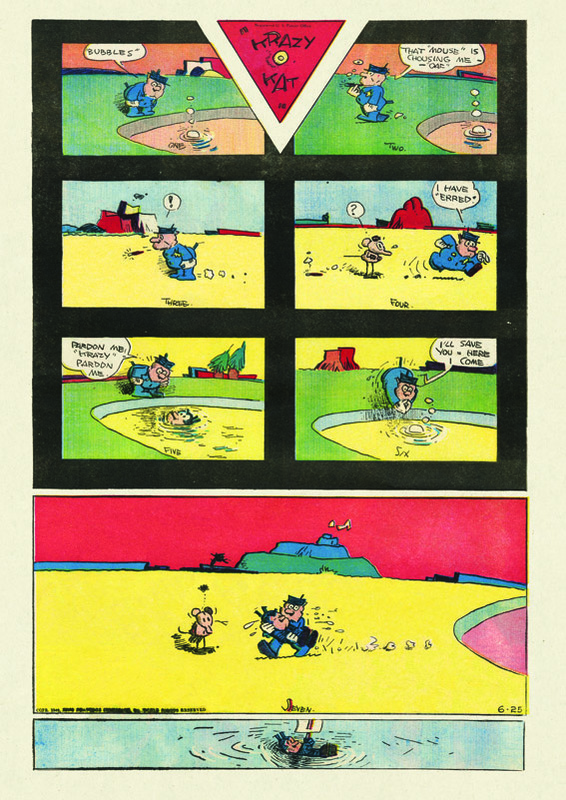 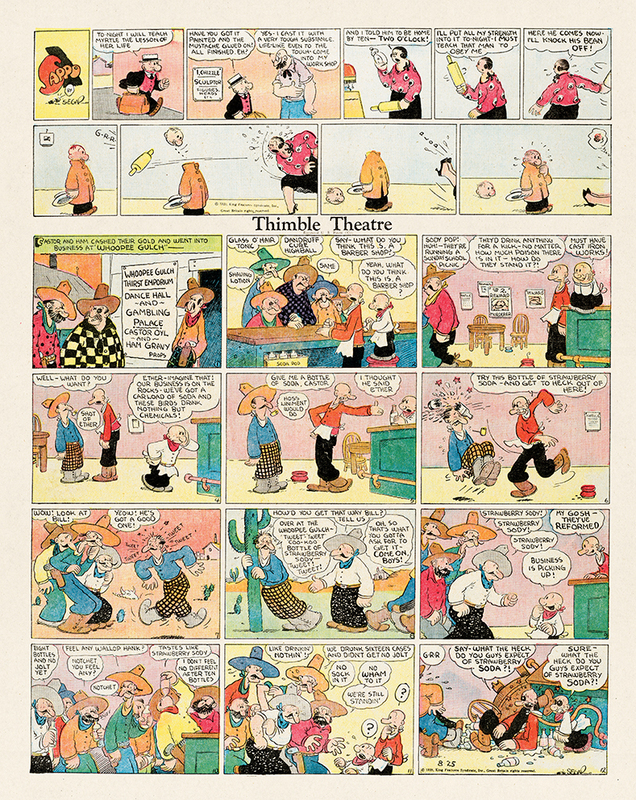 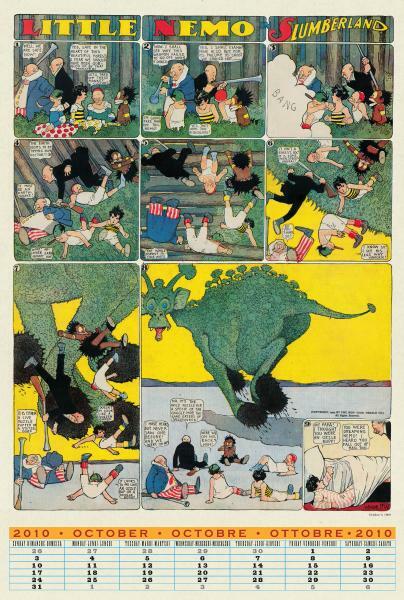 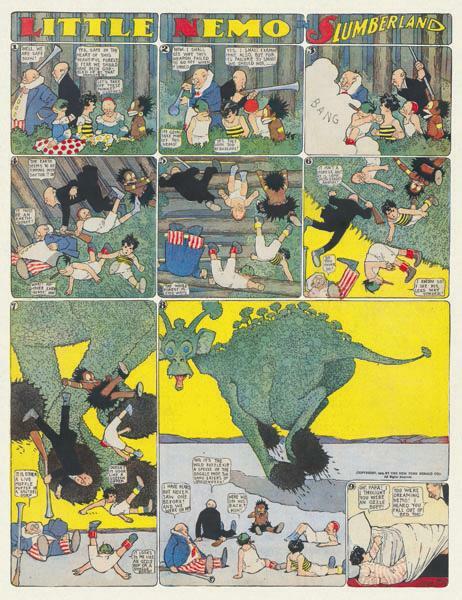 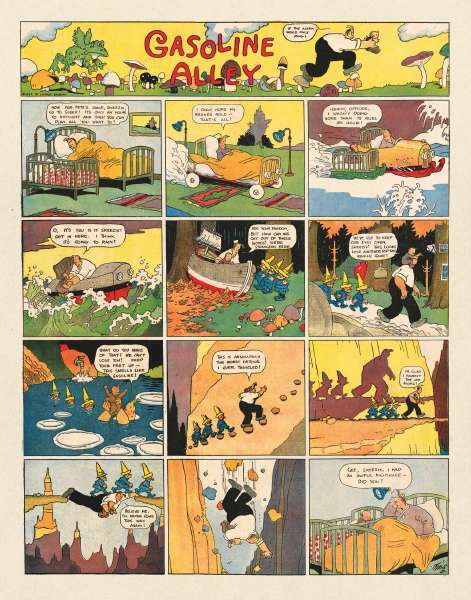 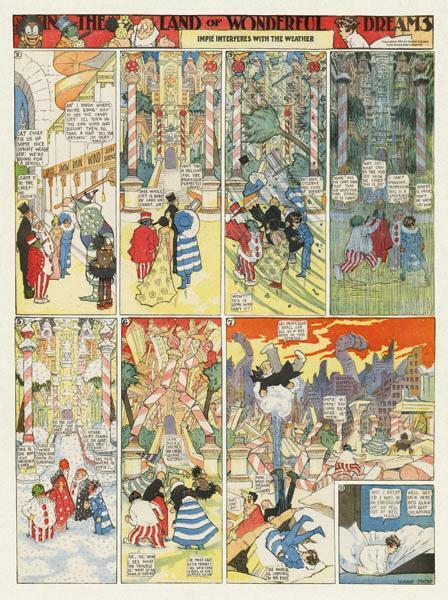 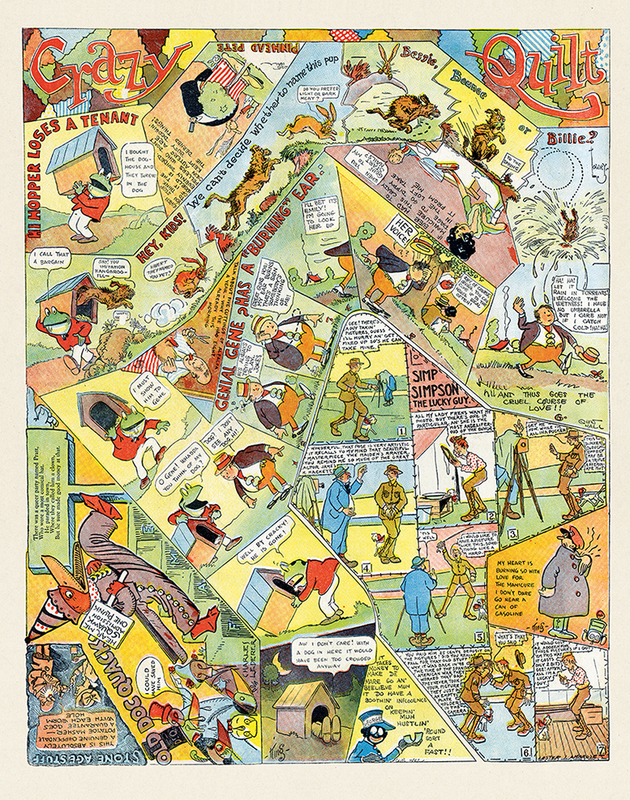 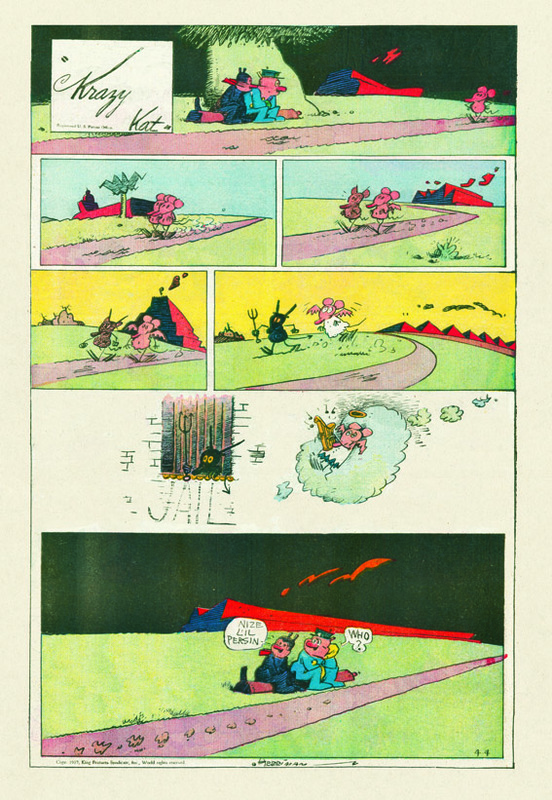 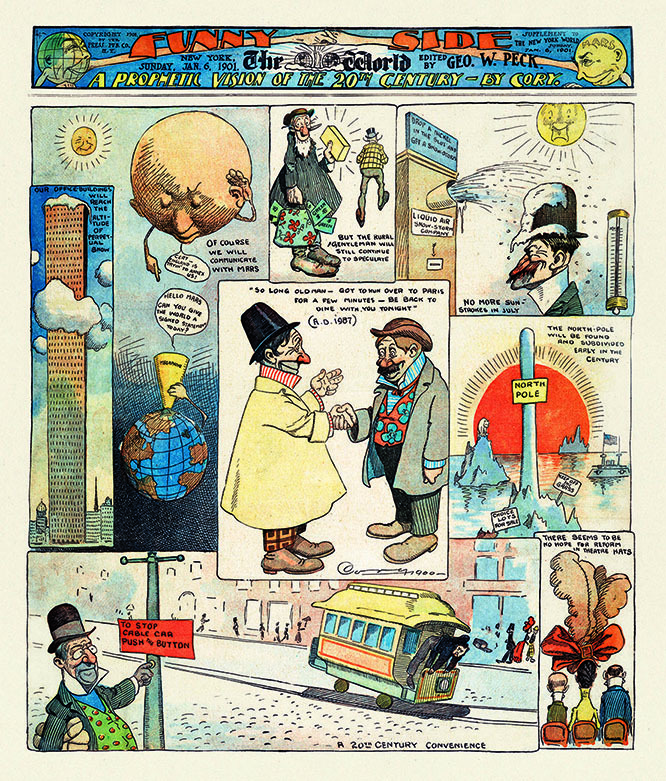 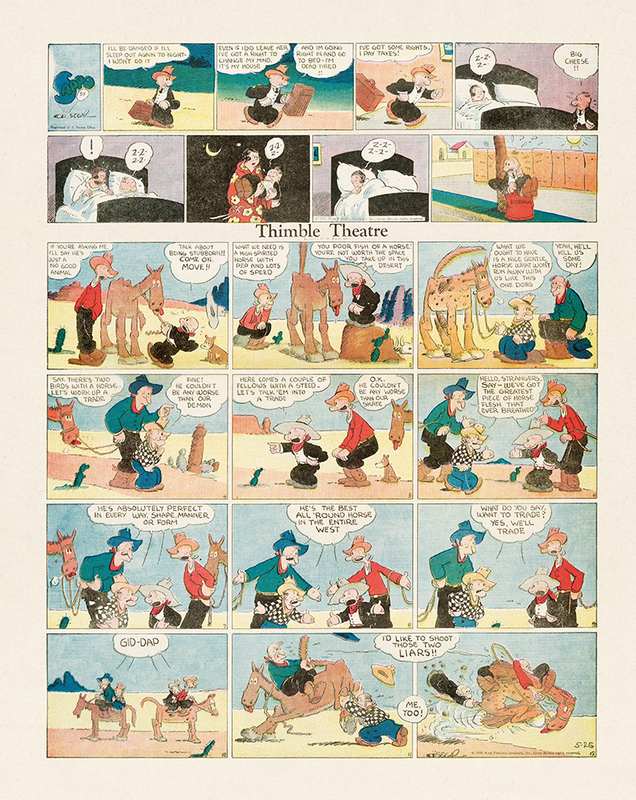 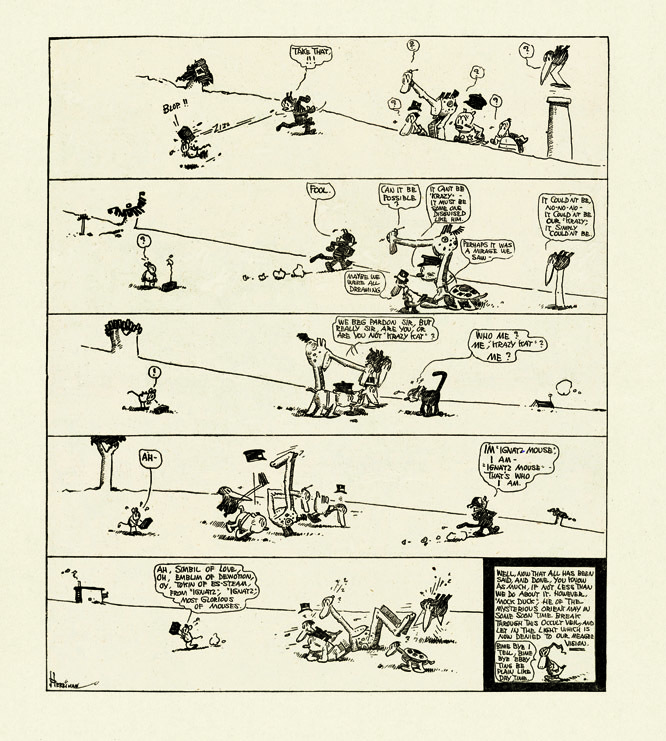 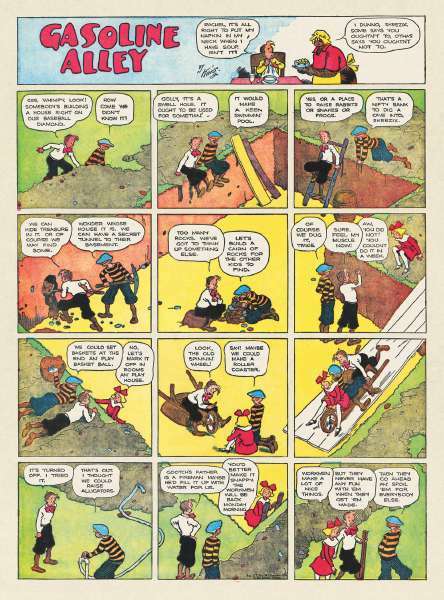 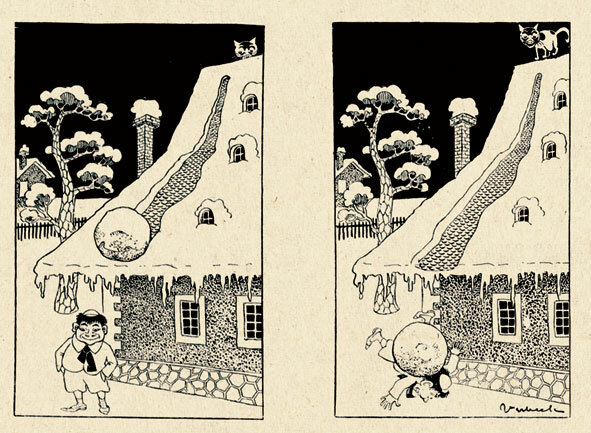 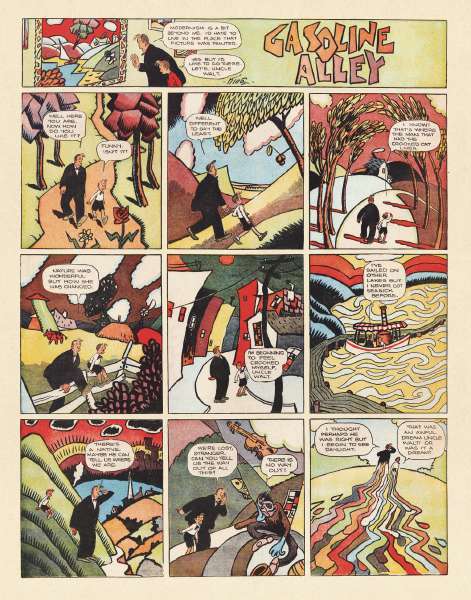 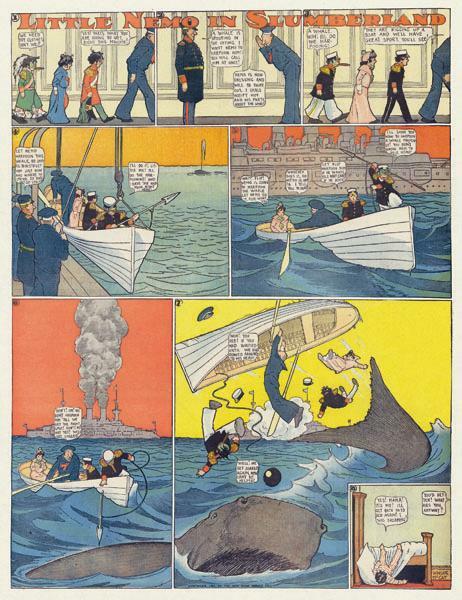 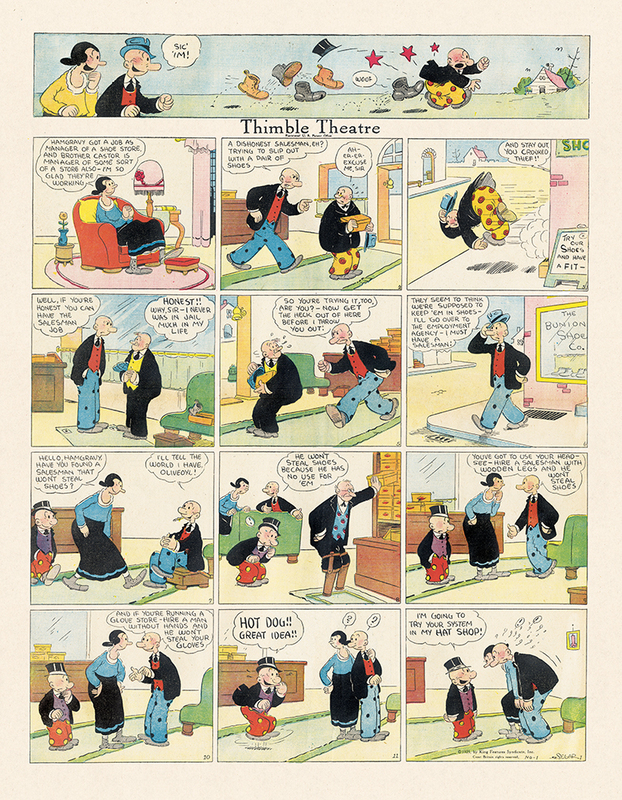 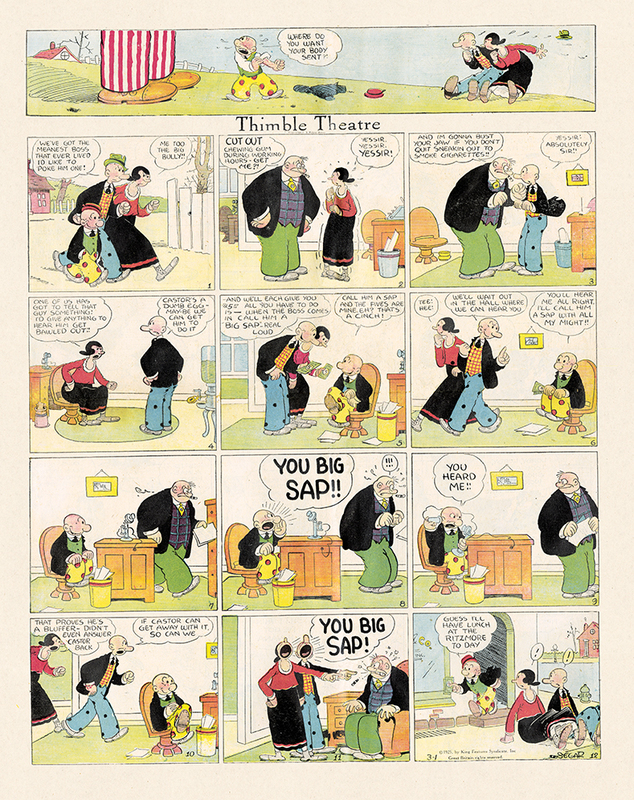 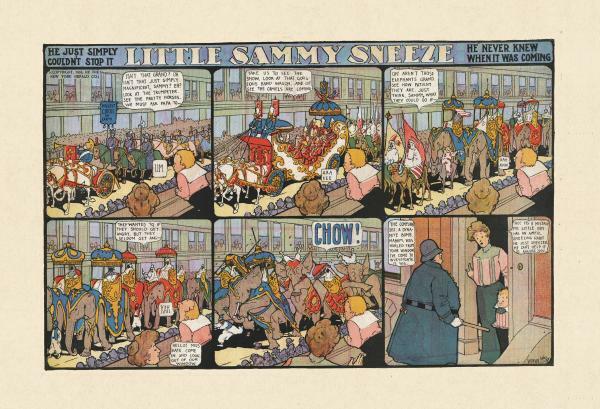 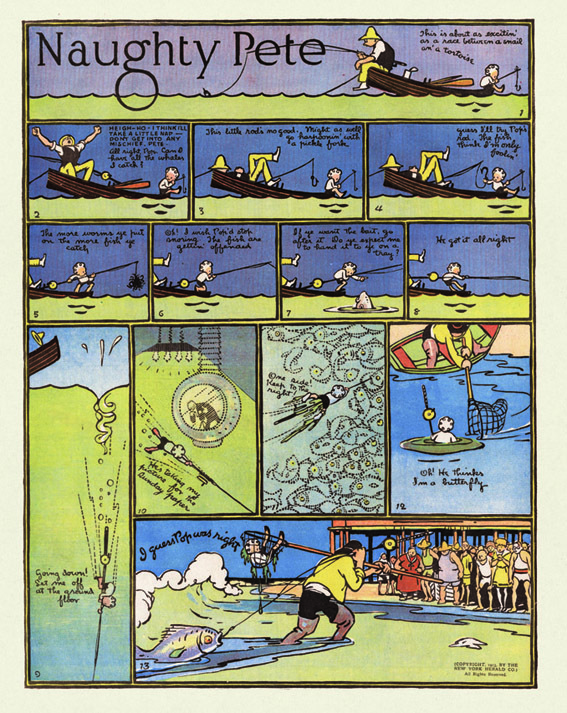 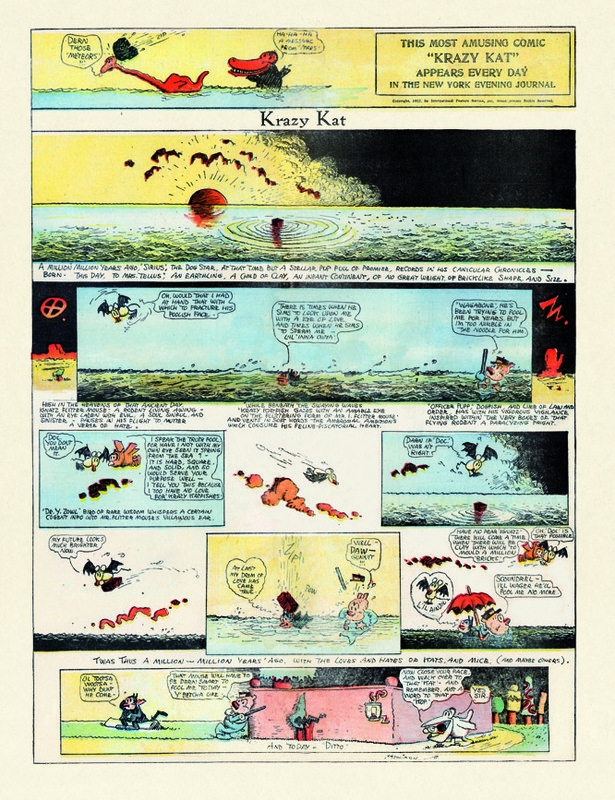 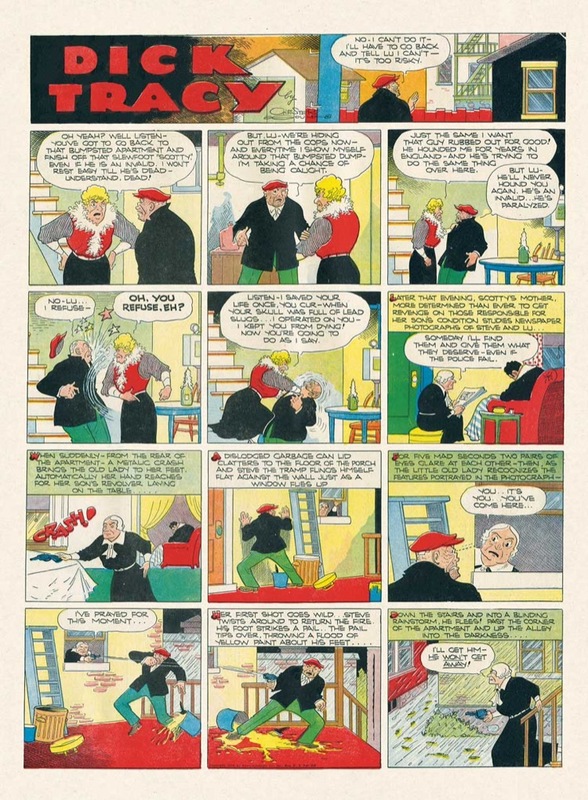 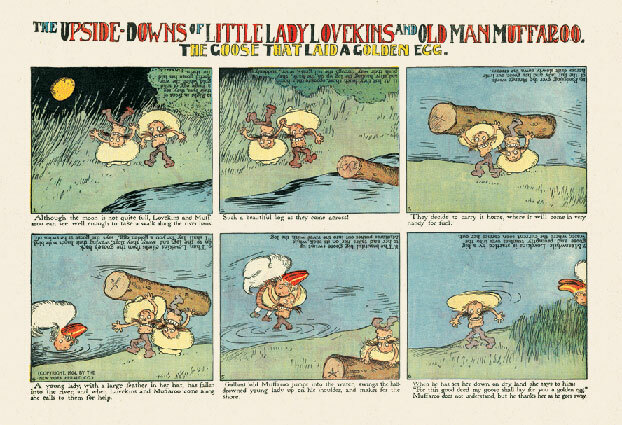 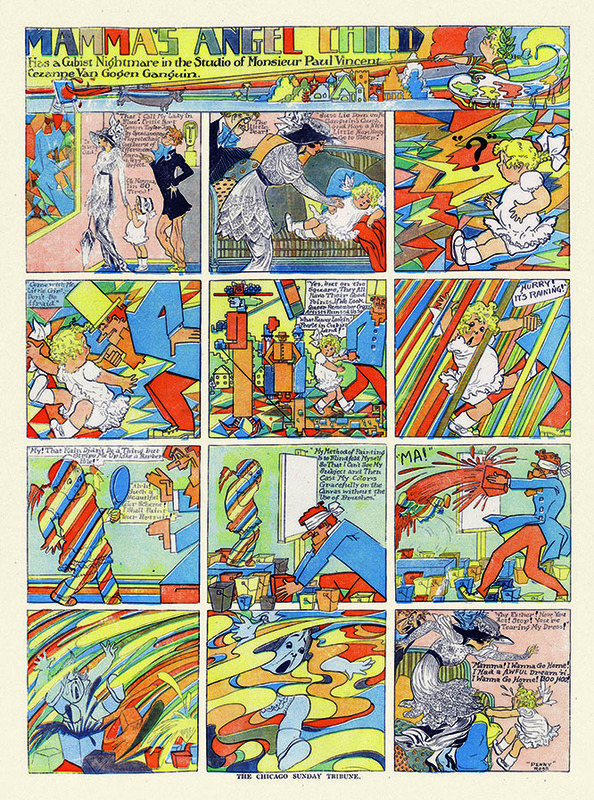 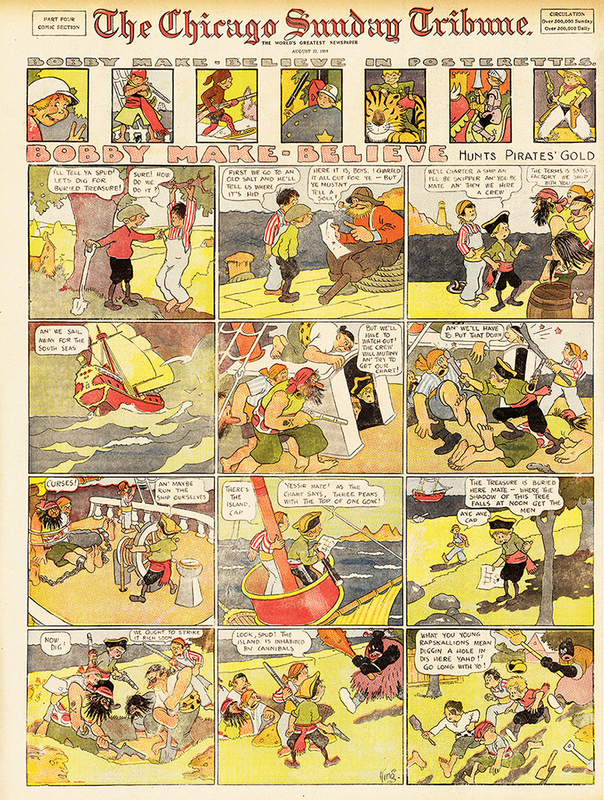 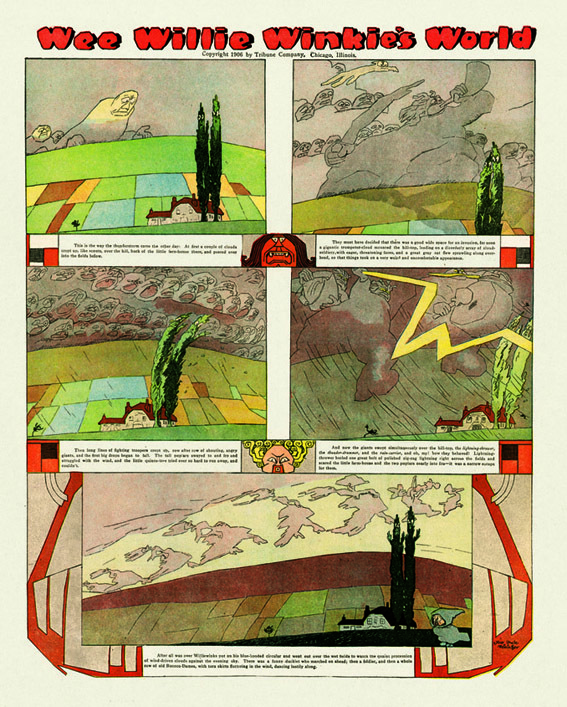 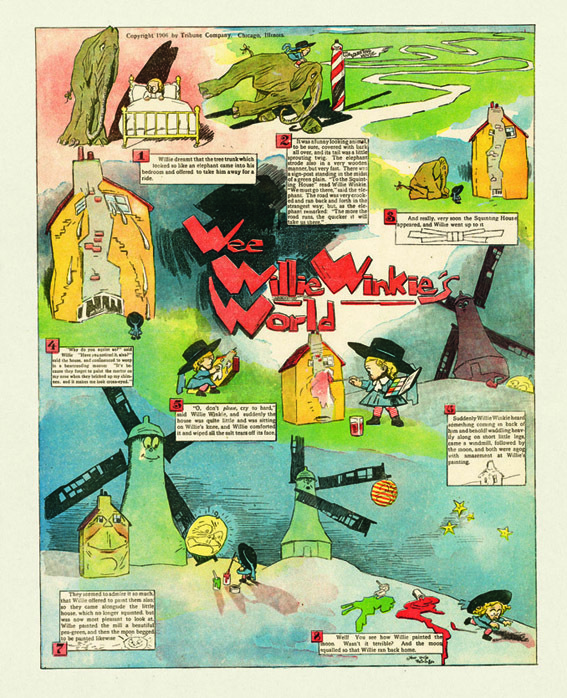 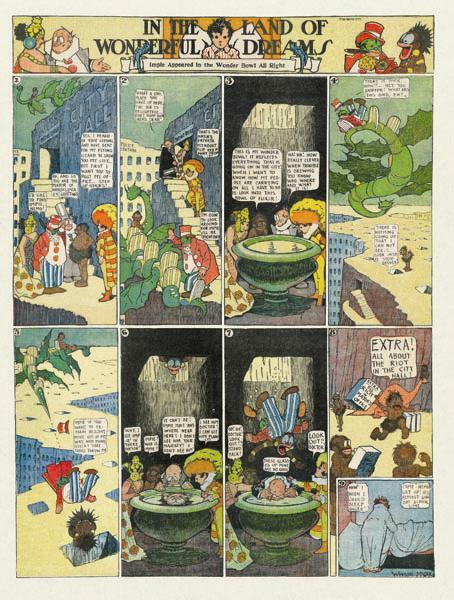 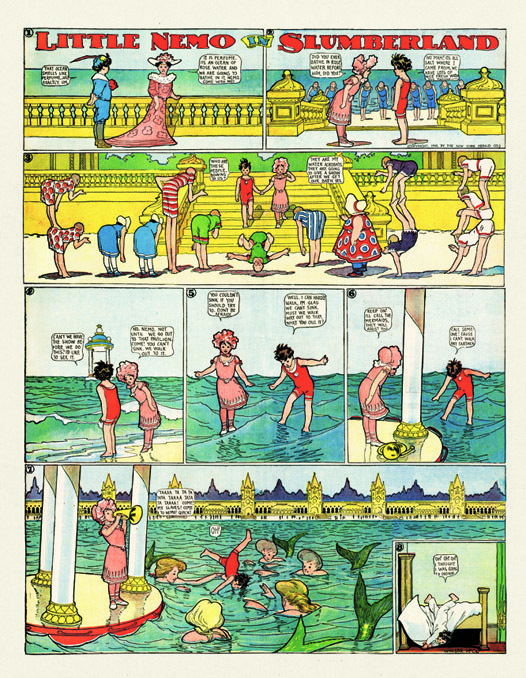 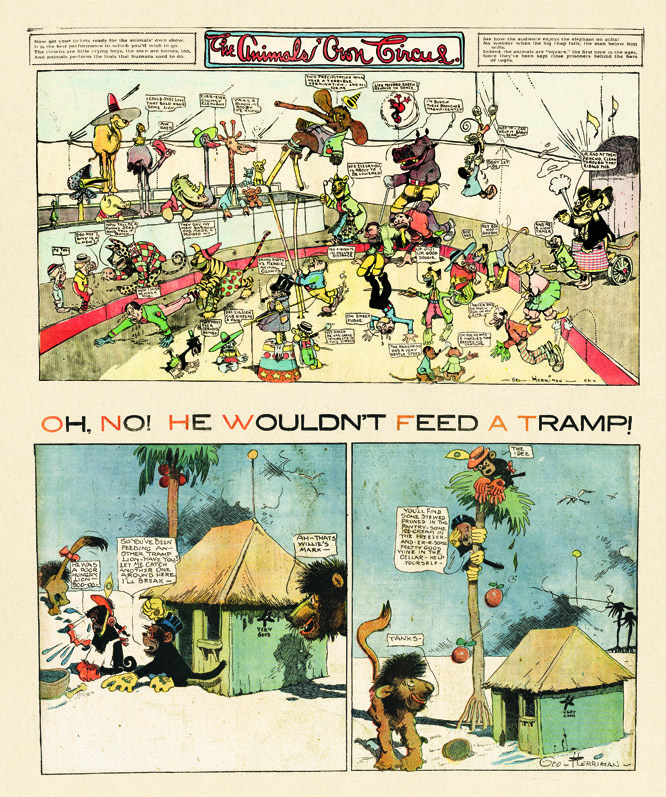 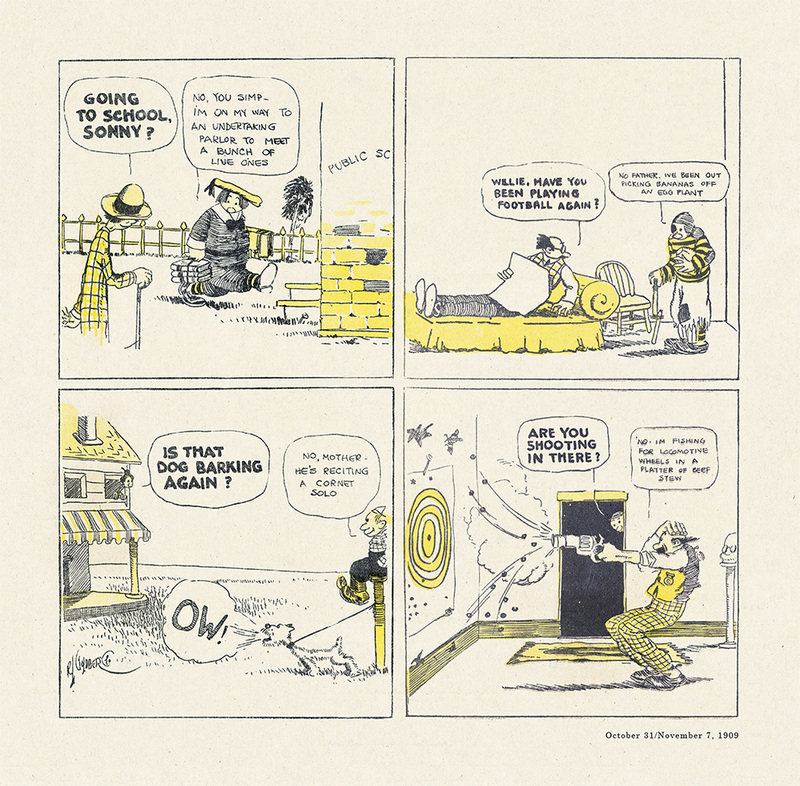 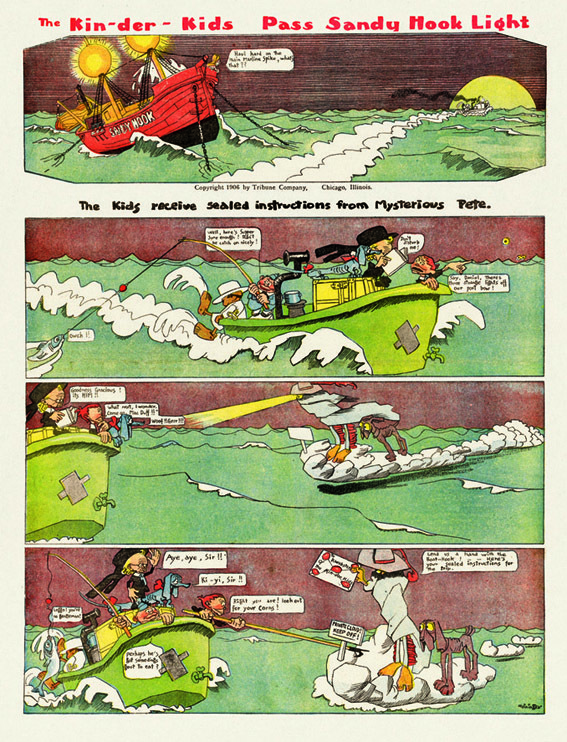 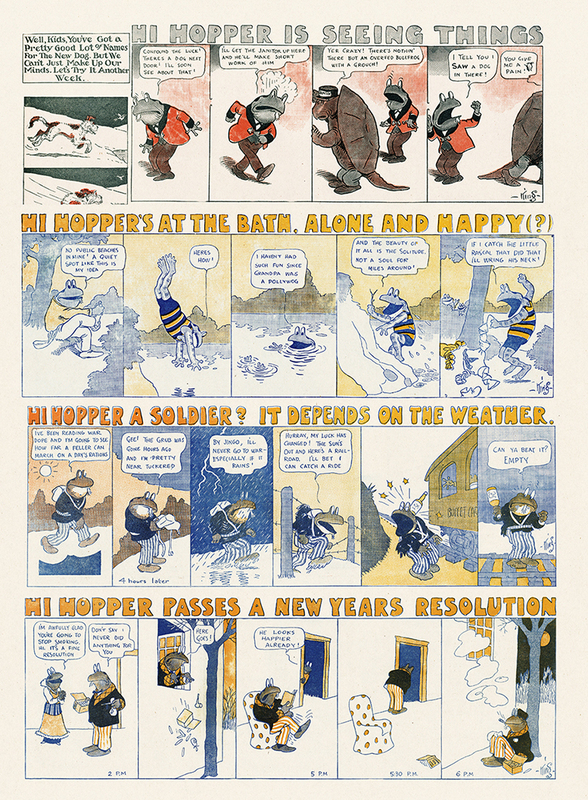 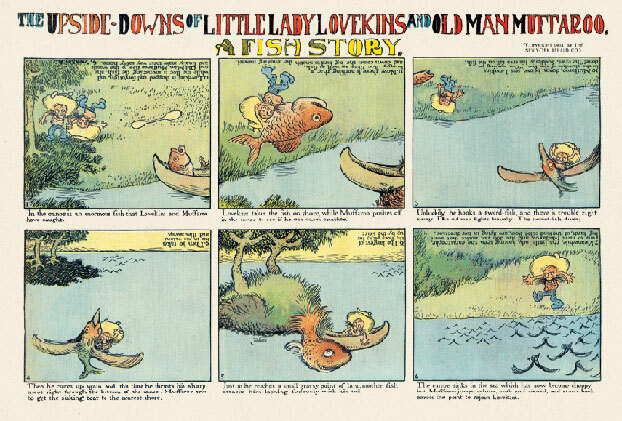 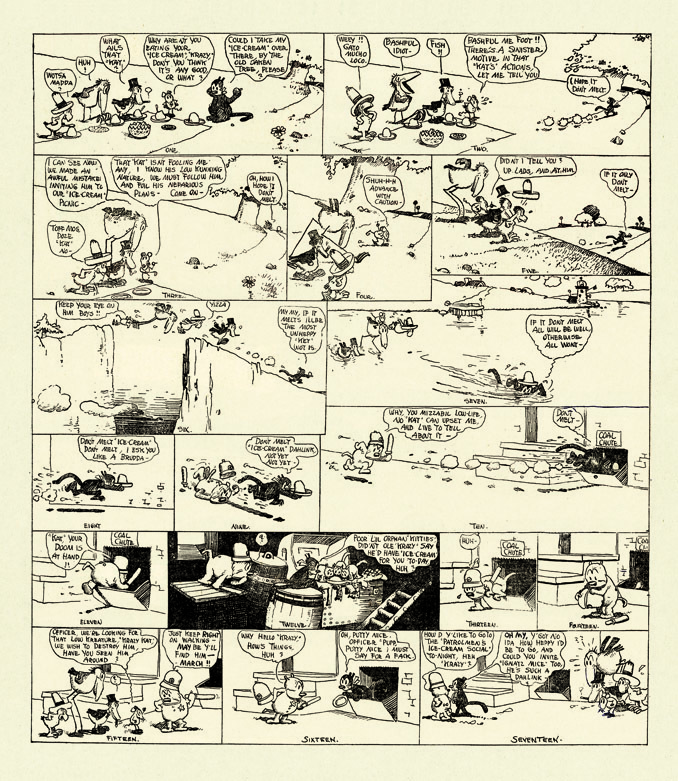 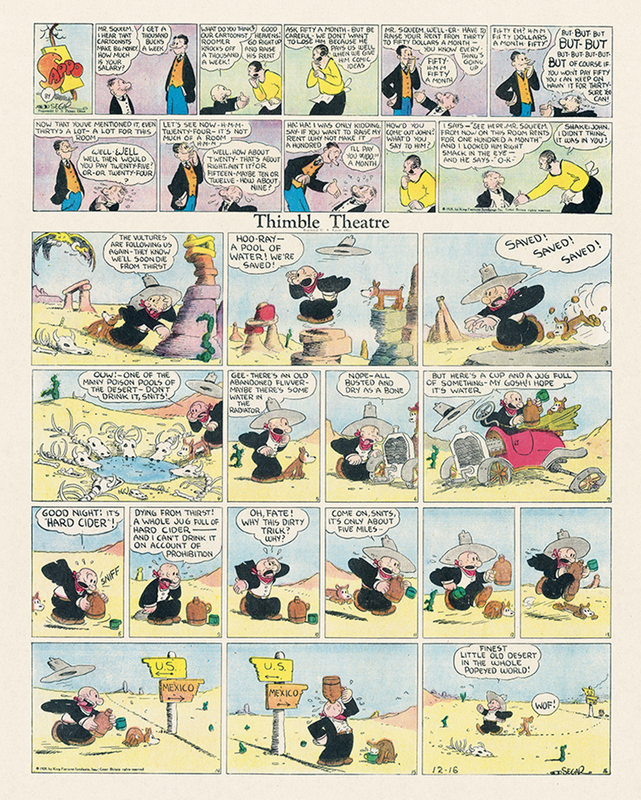 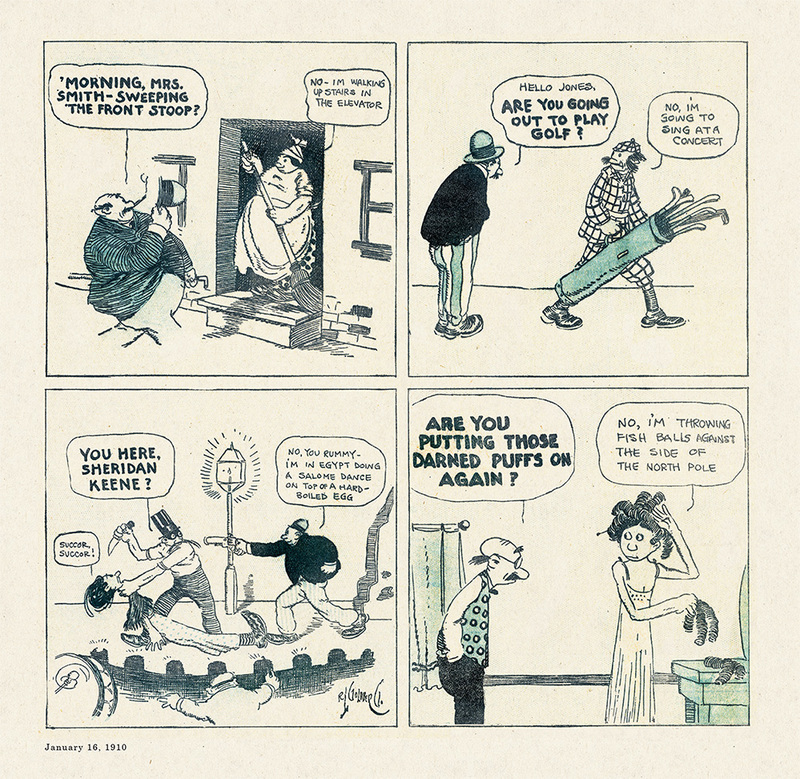 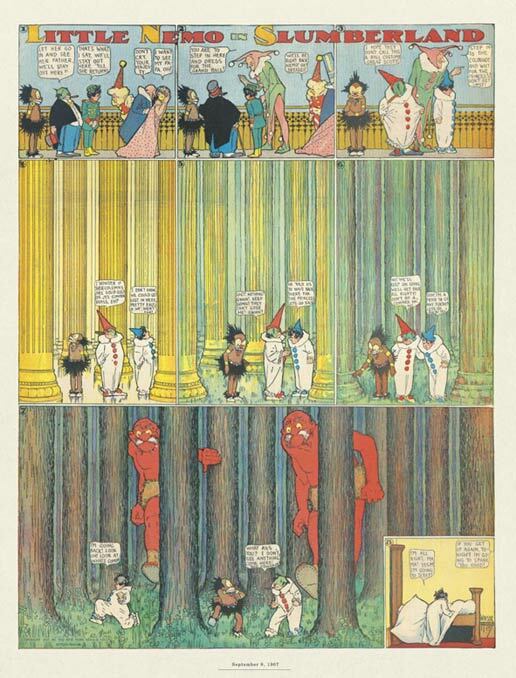 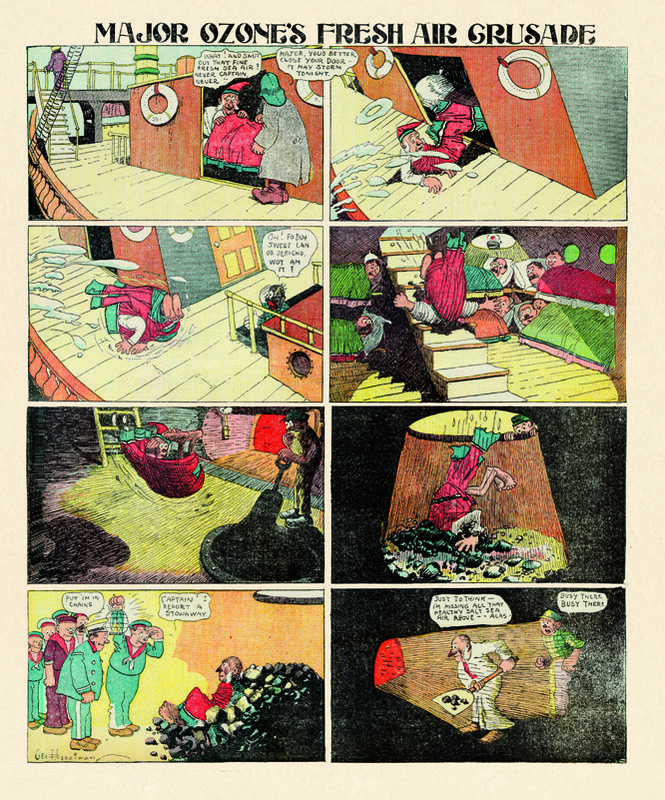 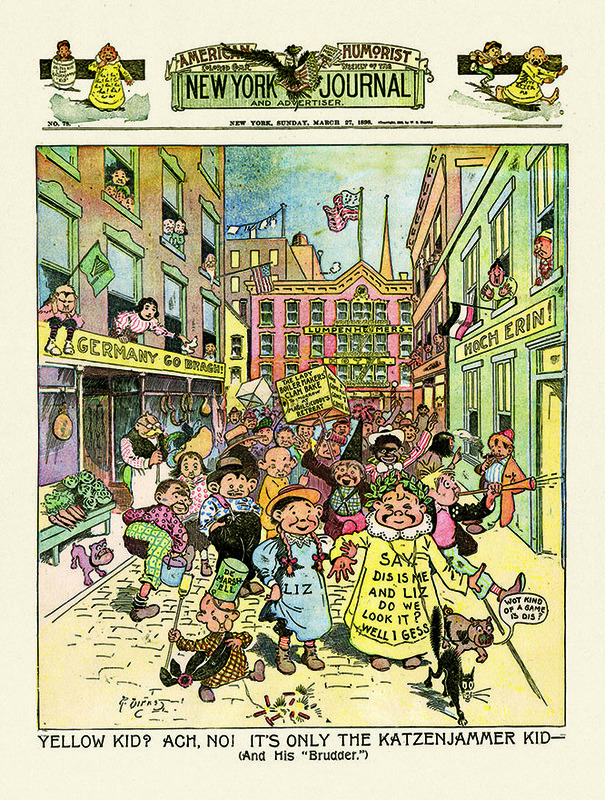 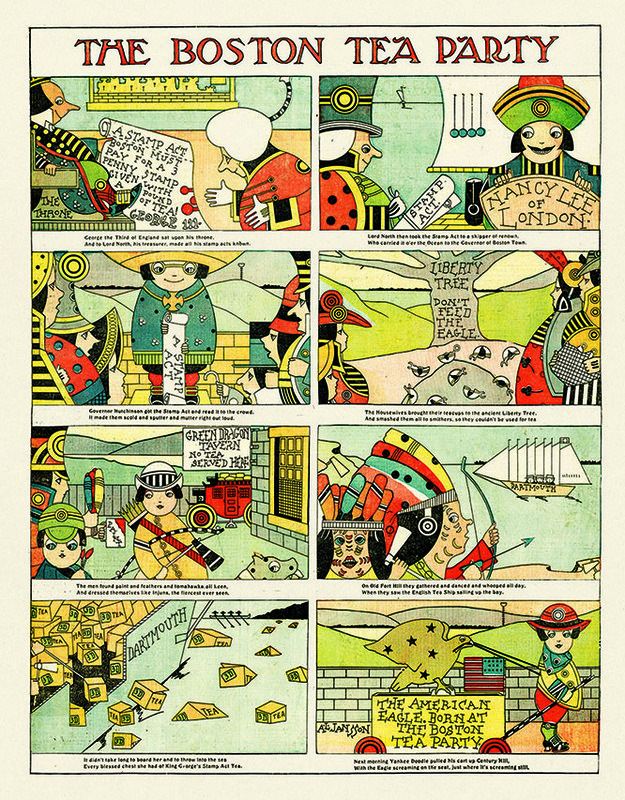 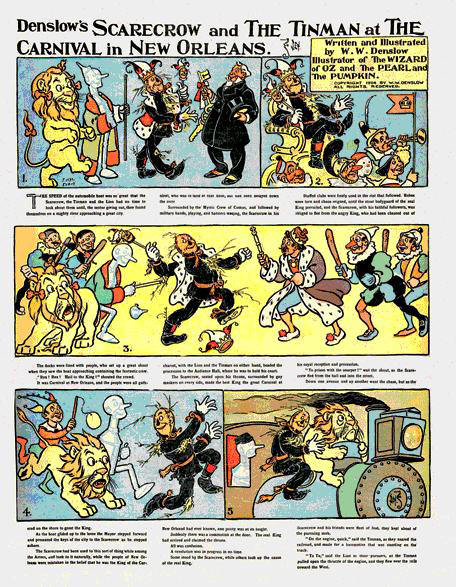 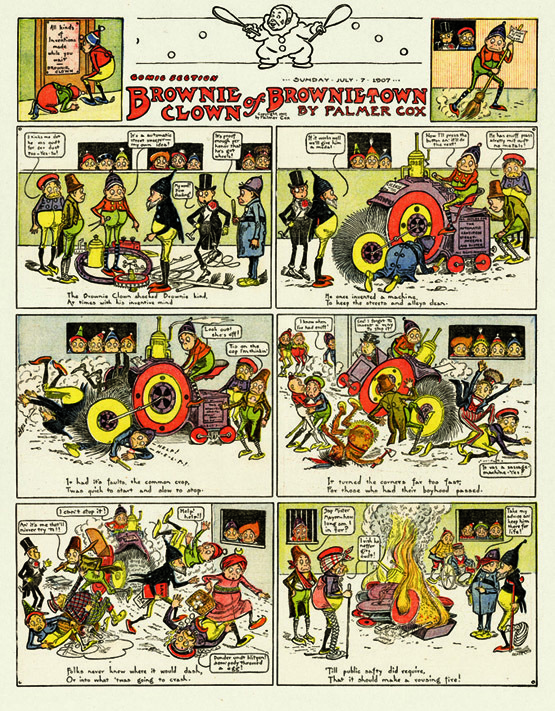 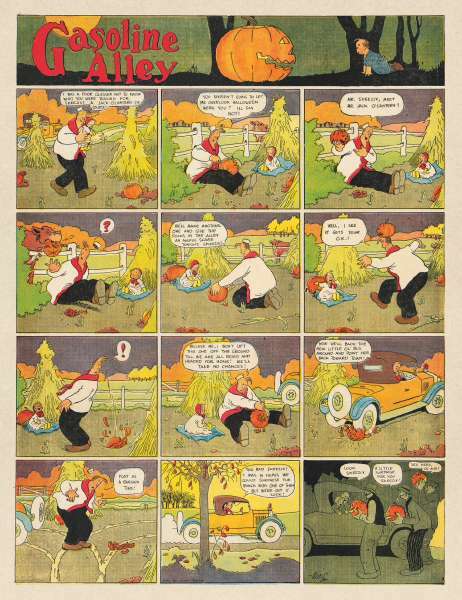 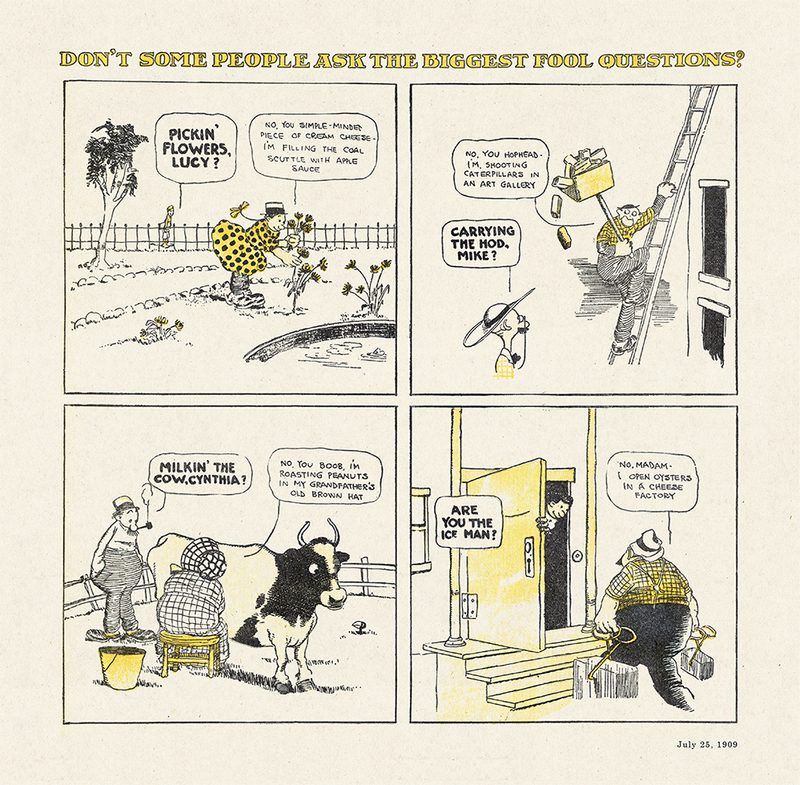 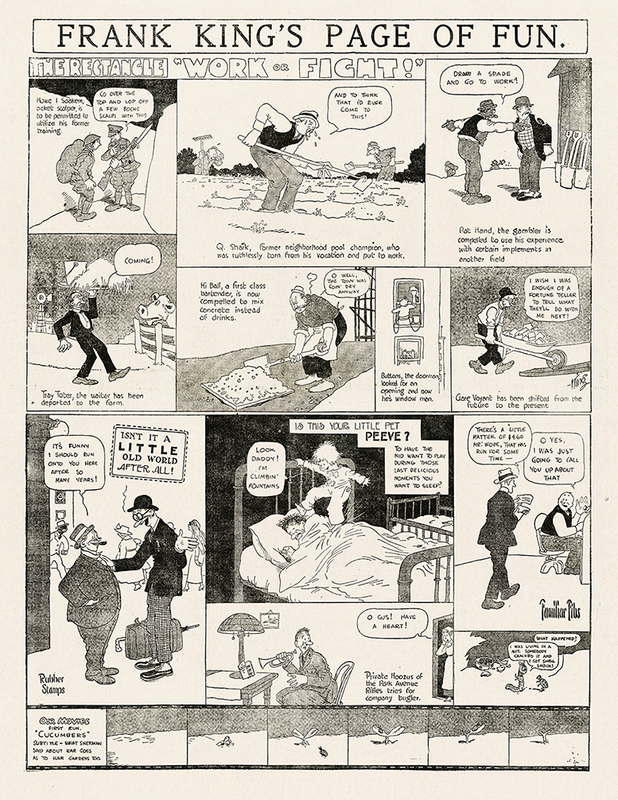 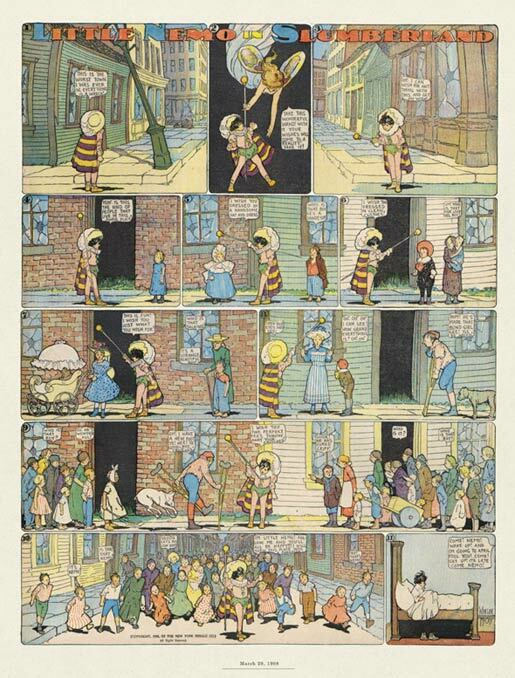 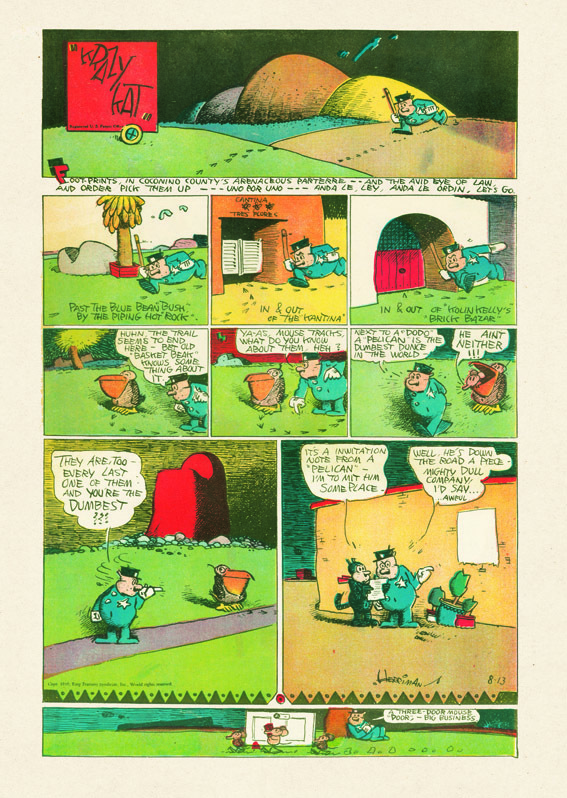 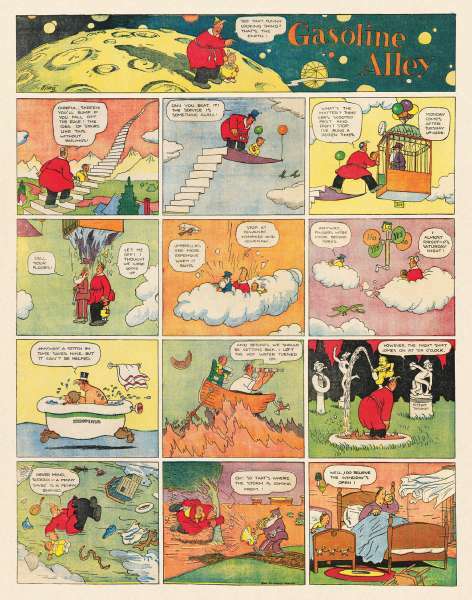 The confluence of East and West can be seen in Verbeek's most famous works, the two newspaper comic strips he created in the first decades of the 20th century: The Upside-Downs of Little Lady Lovekins and Old Man Muffaroo, which ran from 1903 to 1905, and The Terrors of the Tiny Tads, which ran from 1905-1914. 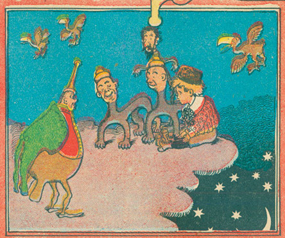 Beautifully composed, dreamlike in their eeriness and stillness, filled with bizarre invented beasts and visual trickery, these strips brought to North American popular culture a glimpse of Japan's tradition of subdued other-worldliness as well as the exaggerated iconic forms found in European expressionism.. . .
. . . After returning to the United States around 1896, Verbeek made a name for himself as a magazine artist, with his work adorning well-known humor journals such as Puck and Life. 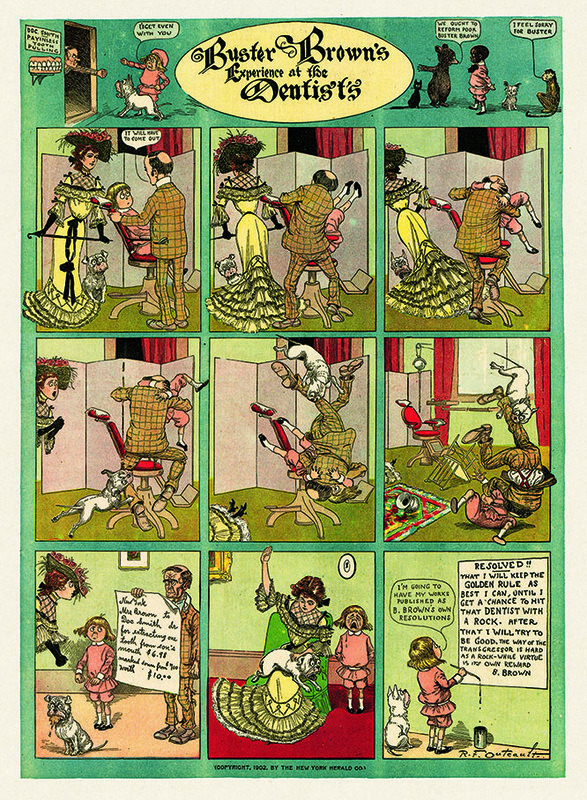 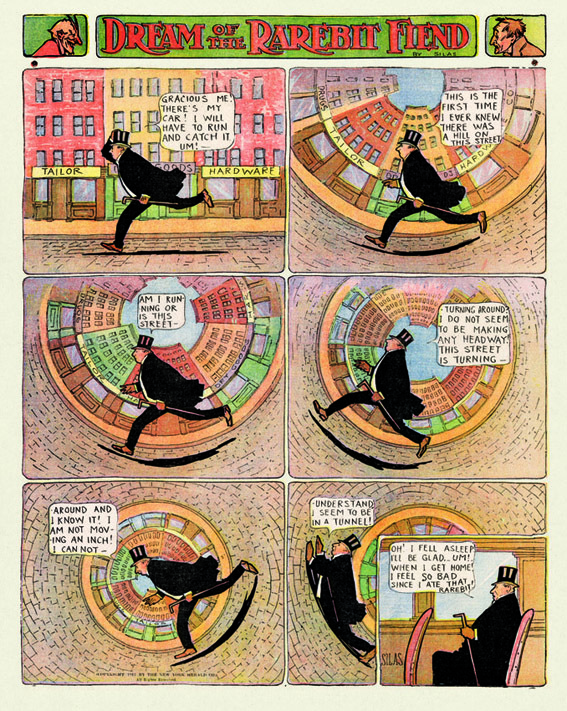 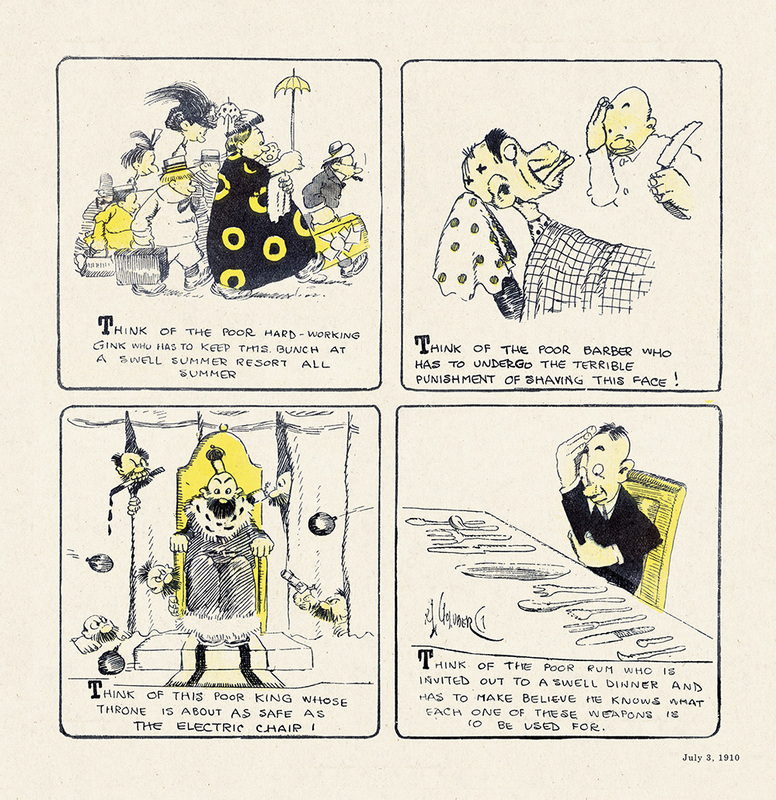 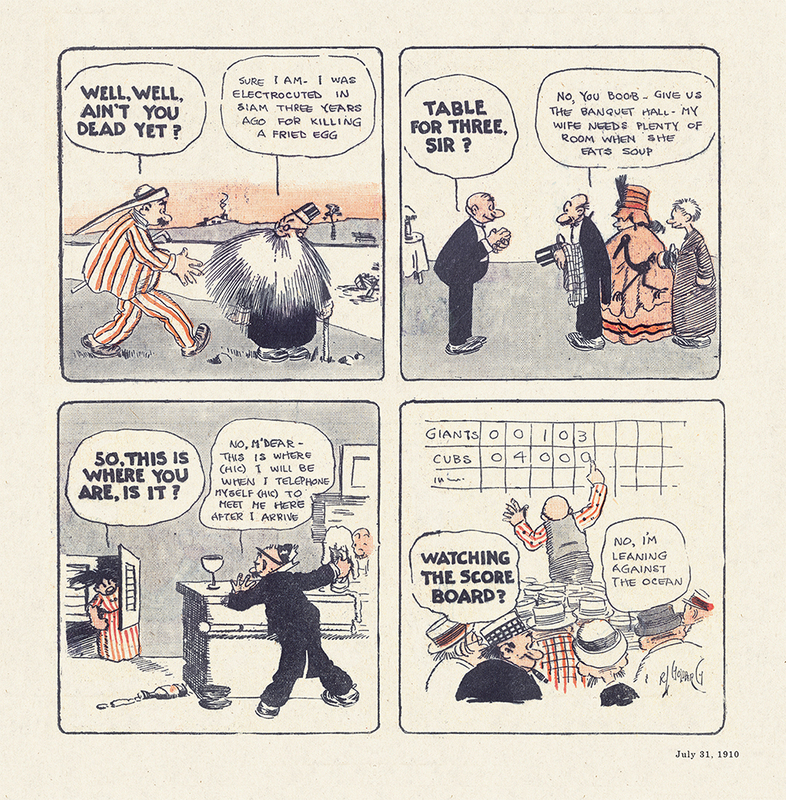 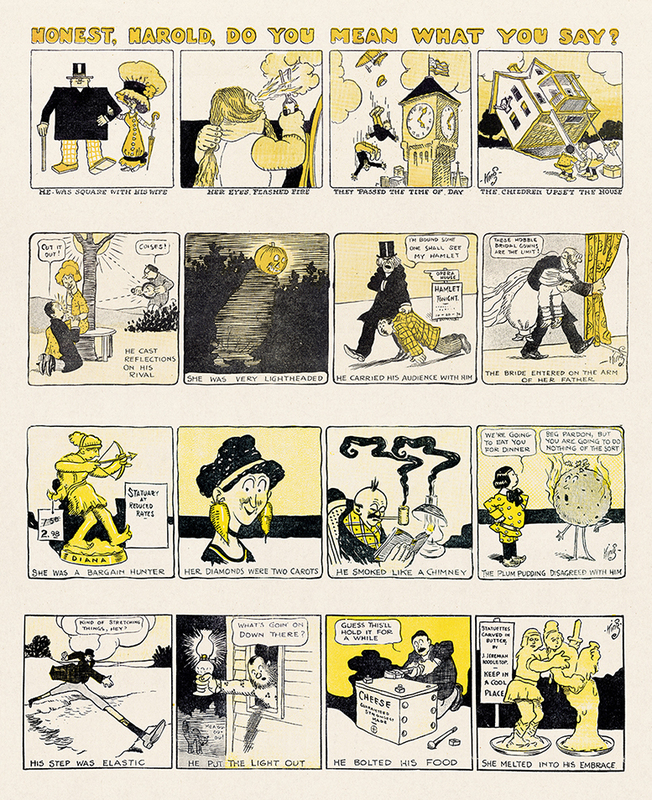 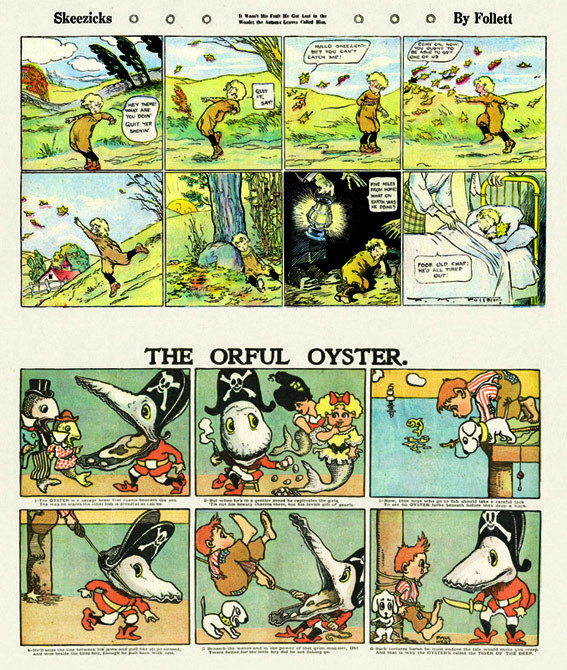 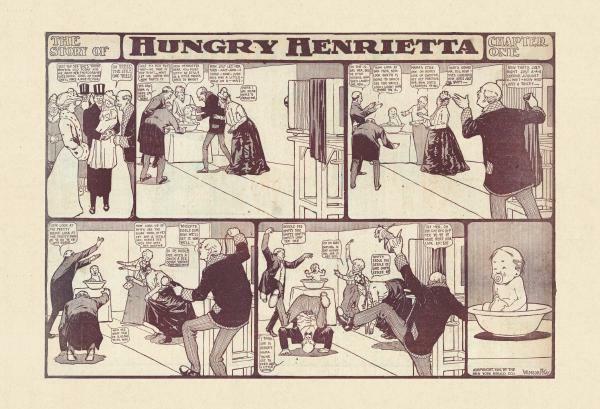 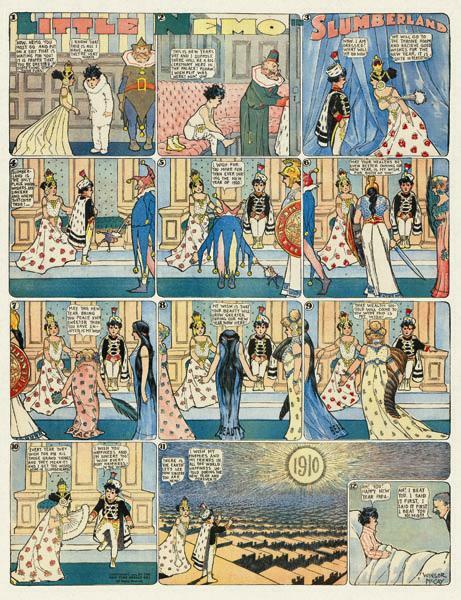 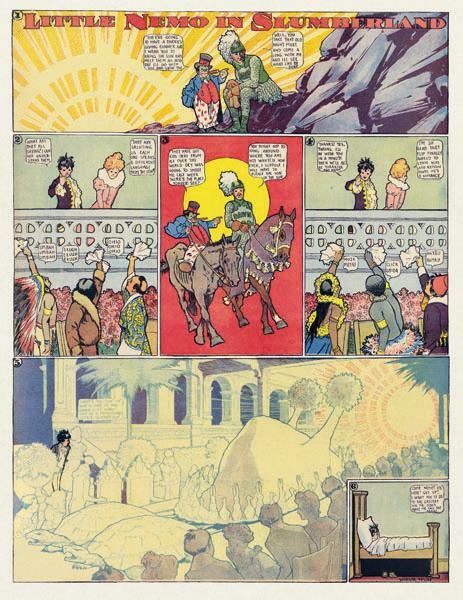 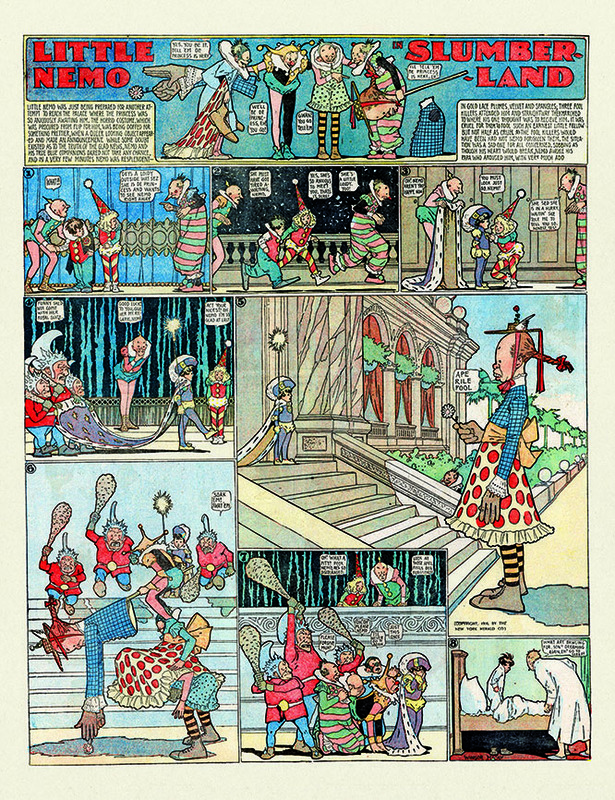 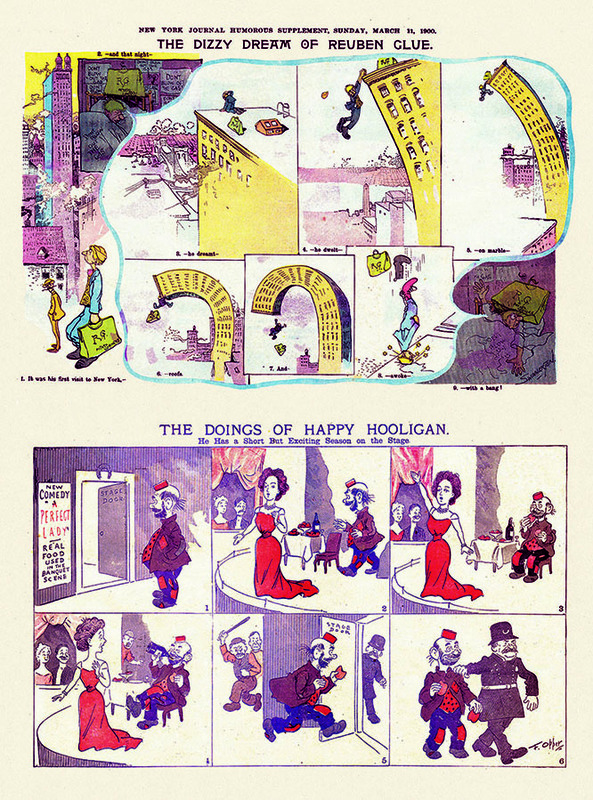 Not content with static drawings, Verbeek was clearly attracted to the emerging form of sequential story telling as seen in several strips he did for Harper's in 1899 and 1900. 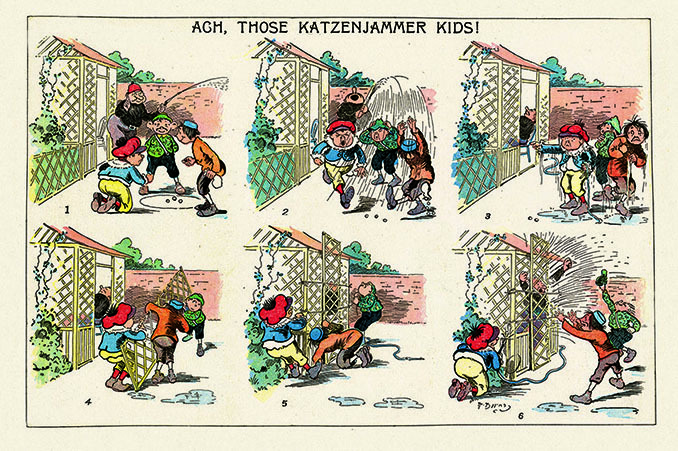 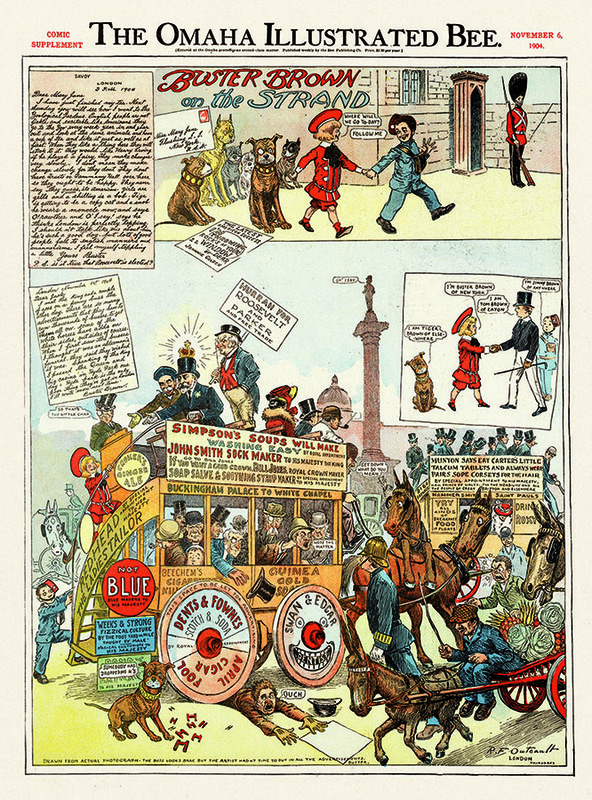 When the newspaper comics supplement started to take off at the end of the 19th century, these humor magazines provided a ready-made farm team for the new art form. 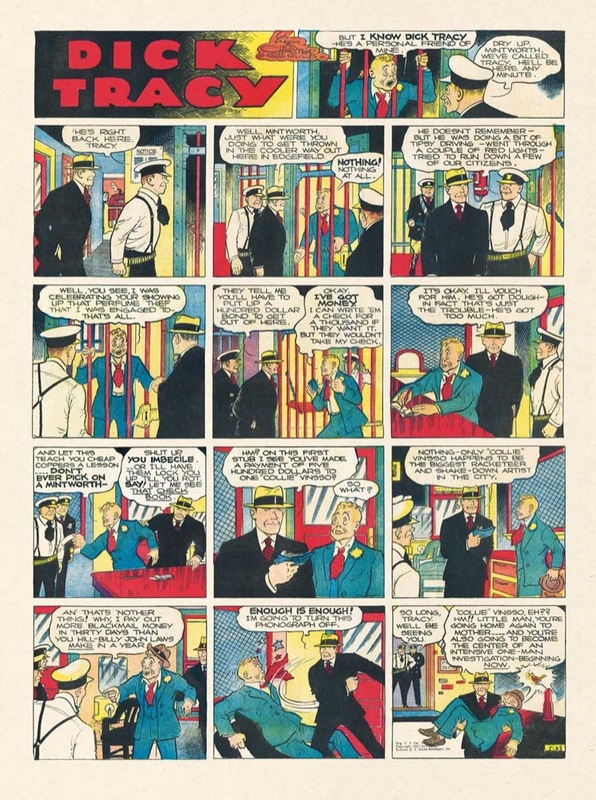 Along with peers like Frederick Opper and Richard Outcault, Verbeek made the leap from the magazine stand to newsprint.
. . . 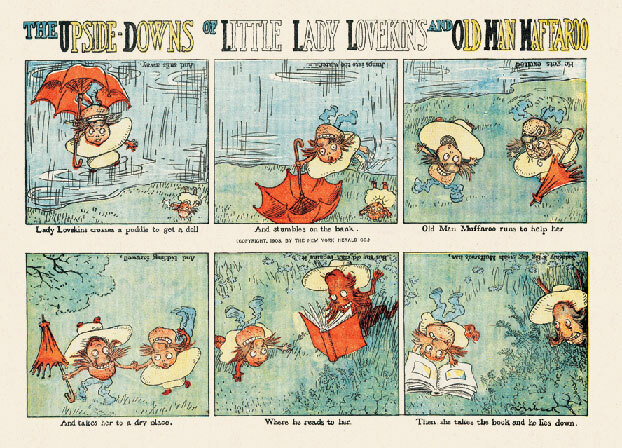 The Upside Downs of Little Lady Lovekins and Old Man Muffaroo is a spectacular visual fantasy based on a remarkable gimmick which he created for the New York Herald. 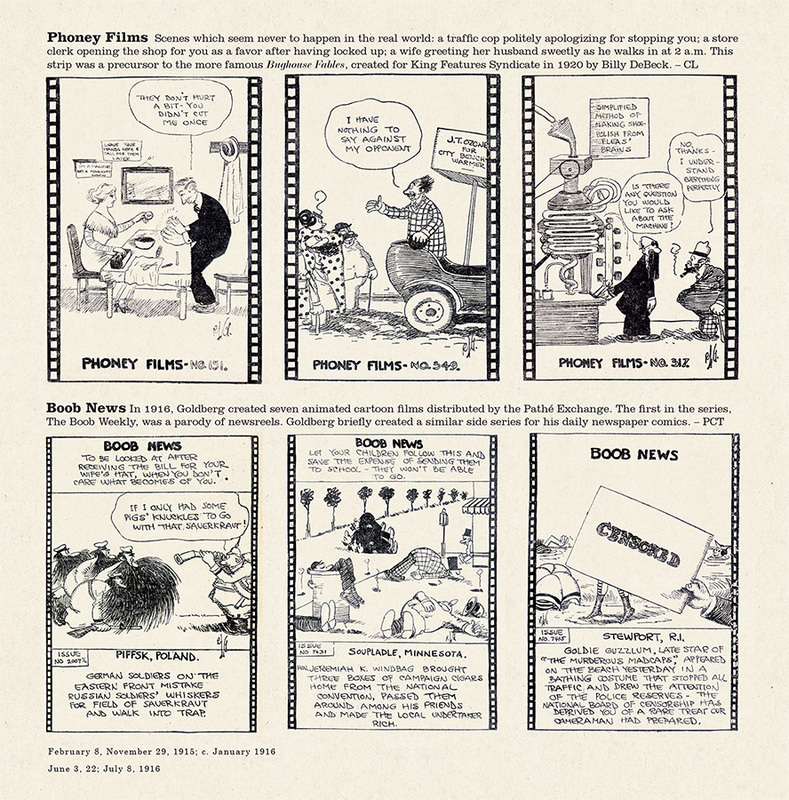 Each episode consists of six panels, which can first be read in the traditional manner from left to right in two tiers. 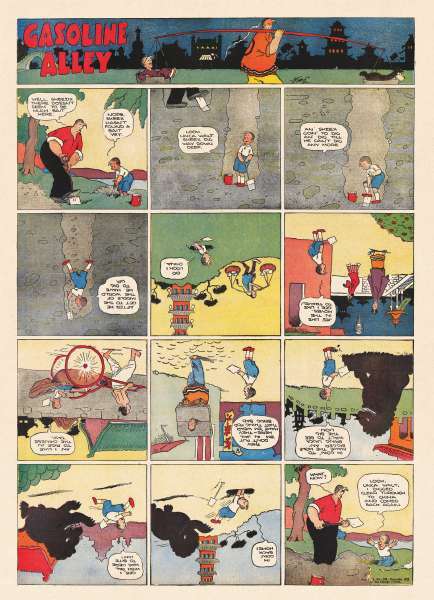 But after reading, you can turn the comic strip page upside-down and continue reading the adventure of the characters for another six panels. 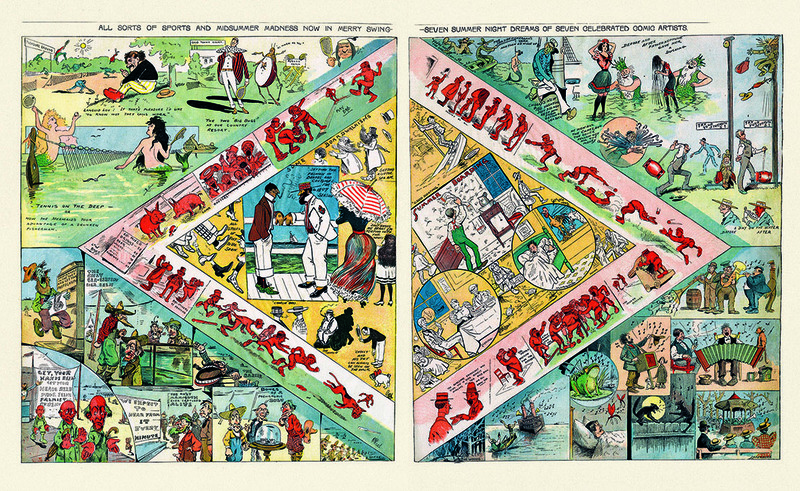 In effect, Verbeek superimposed two narratives on the same page. 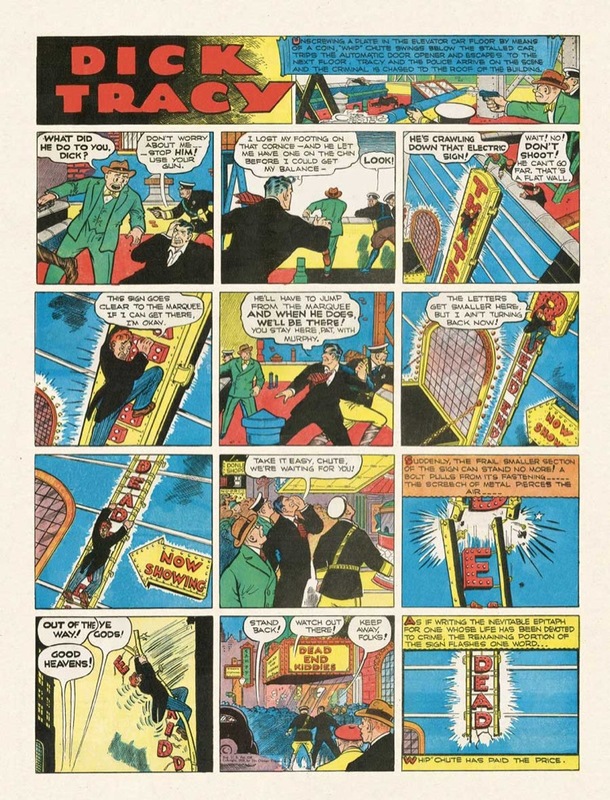 And he did this not once but 64 times for the duration of the strip's run. 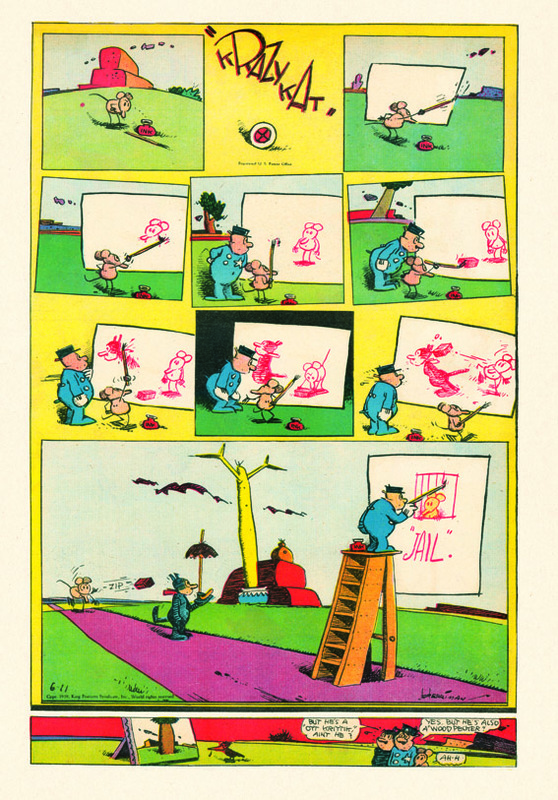 . . .
. . . 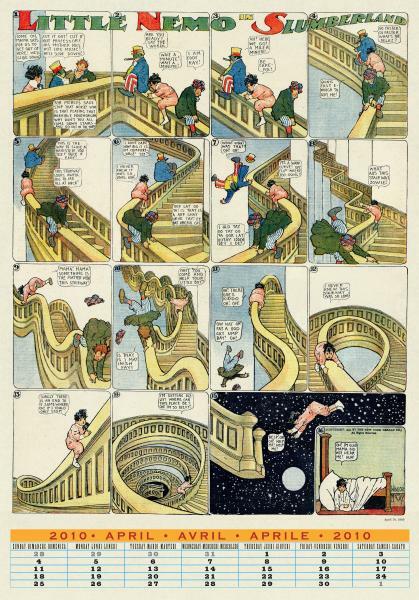 The persistent theme of The Upside-Downs is transience and instability. 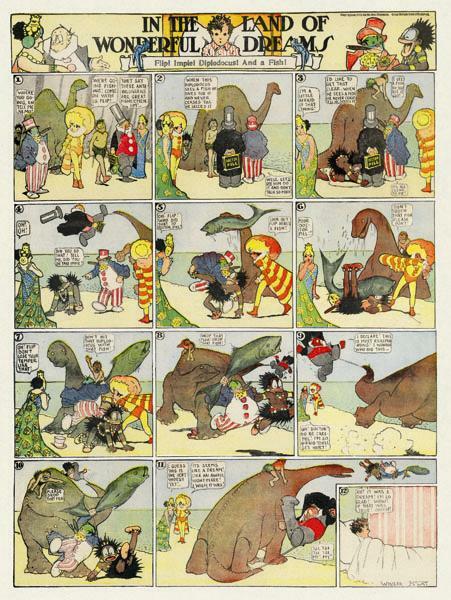 Nothing in Verbeek's world is what it seems: what looks like an ogre in one panel will soon be a beautiful woman, what first looked like a bird turns into a rhinoceros, and, in the much-praised episode of July 31, 1904, a canoe attacked by a fish next to an island is transformed into a giant Roc. 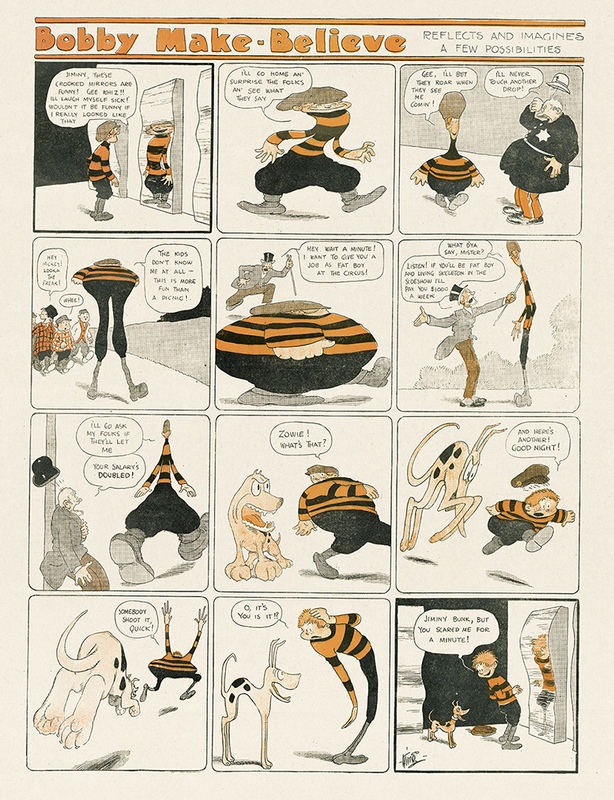 Verbeek was the great cartoonist of camouflage and disguise. 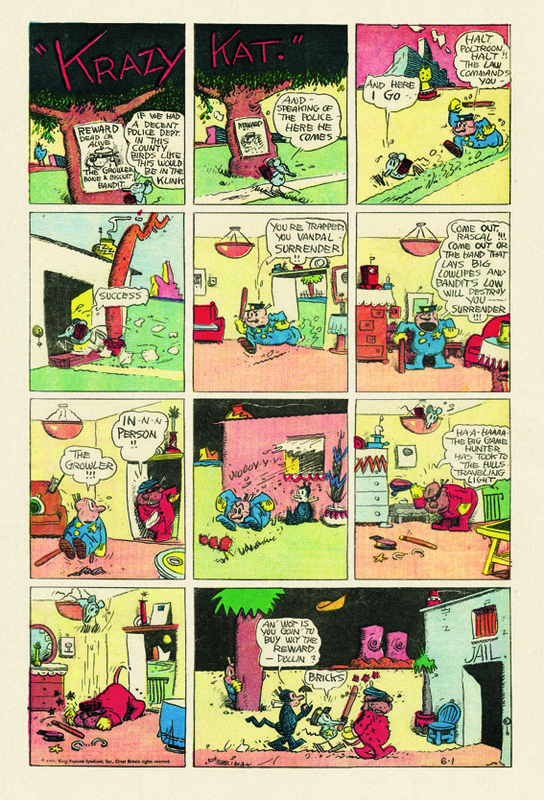 . . .
. . . Verbeek retired Mufaroo and Lovekins after a year, and no doubt they continue happily to spin in their graves at the Comic Strip Cemetery. 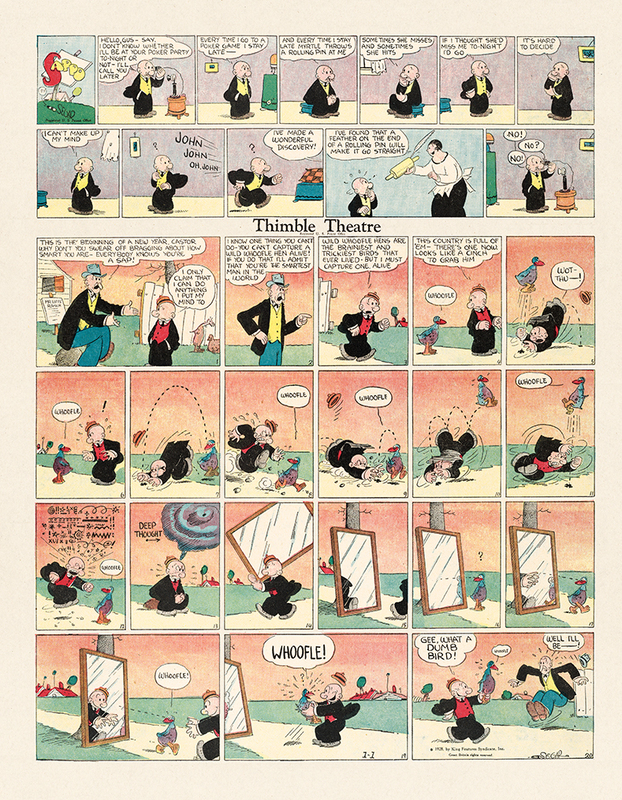 Scarcely less of a creative challenge was Verbeek's next strip, The Terrors of the Tiny Tads. 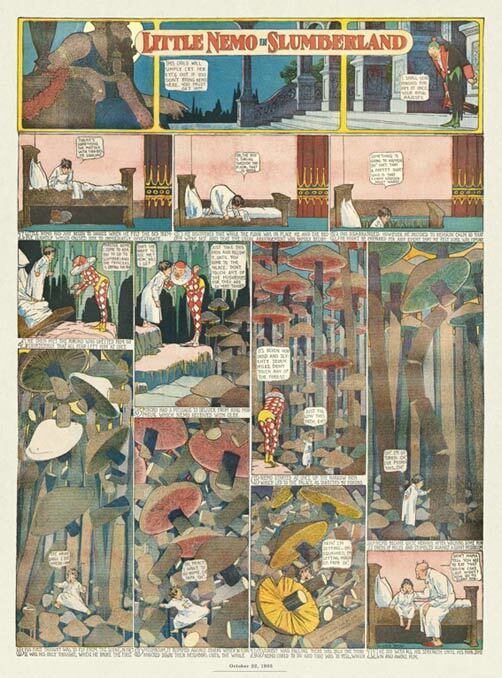 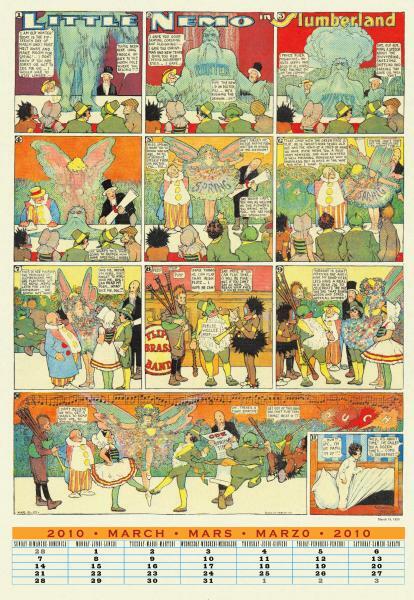 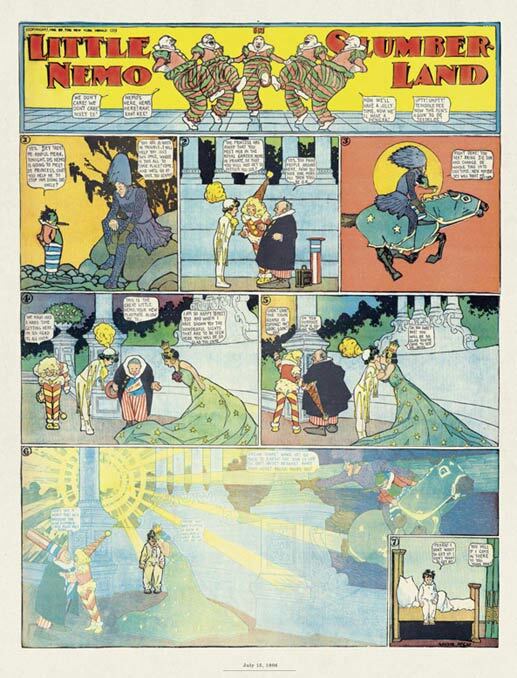 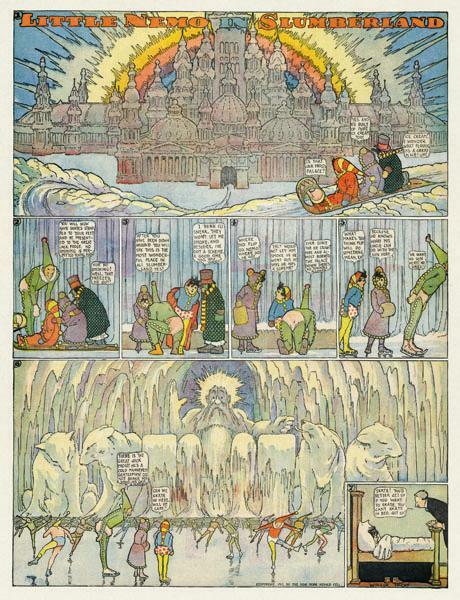 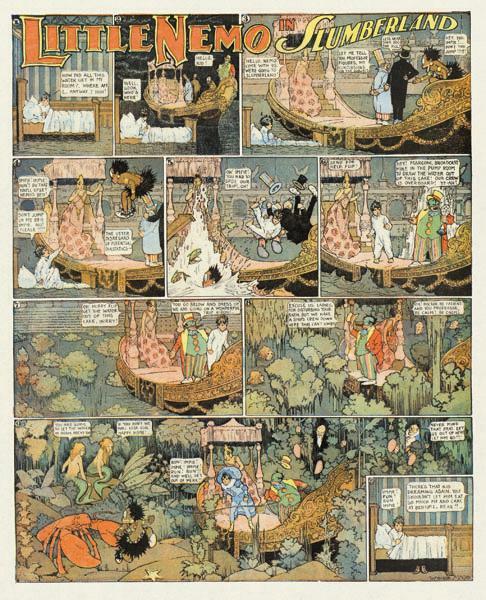 Its debut was the same day as another fantasy classic, Little Nemo in Slumberland, Oct 15, 1905, and it outlived Nemo's two successive runs by a year: into 1915. . . .
. . . Inevitably, Verbeek added ingredients beyond whimsy. 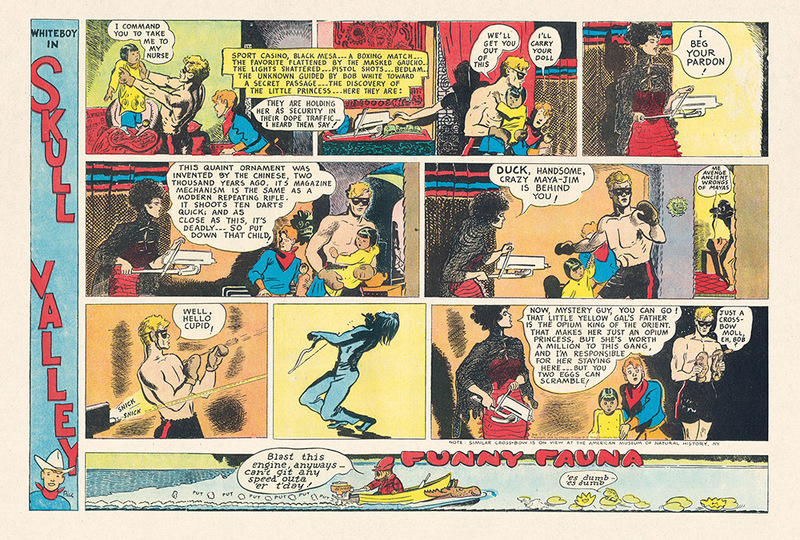 As the strip's title suggests, there were nightmarish aspects to the tads' adventures. 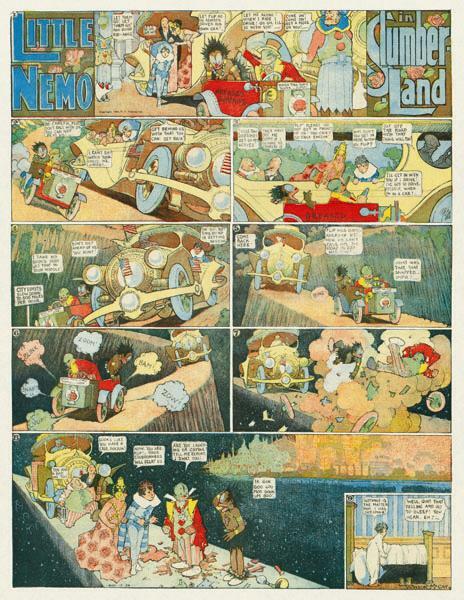 Like Nemo's early adventures, Freudian themes of fears and distress provided a dark subtext to the seemingly charming, inevitably bucolic, environment. 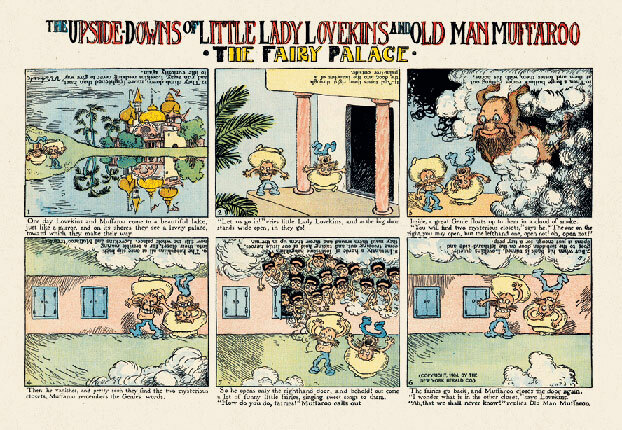 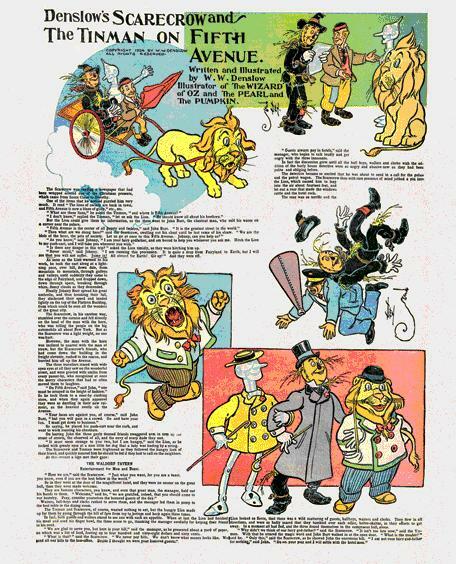 Many fantasy strips of the time were urban (like the settings of the readers' families) or sometimes other-worldly as in Nemo , The Kin-Der-Kids, and The Explorigator. 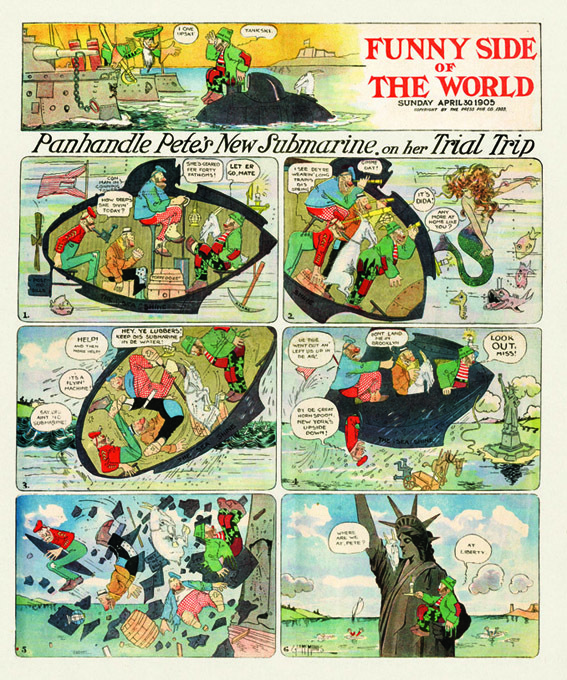 Almost alone, strangely, The Tiny Tads inhabited a friendly-looking paradise. 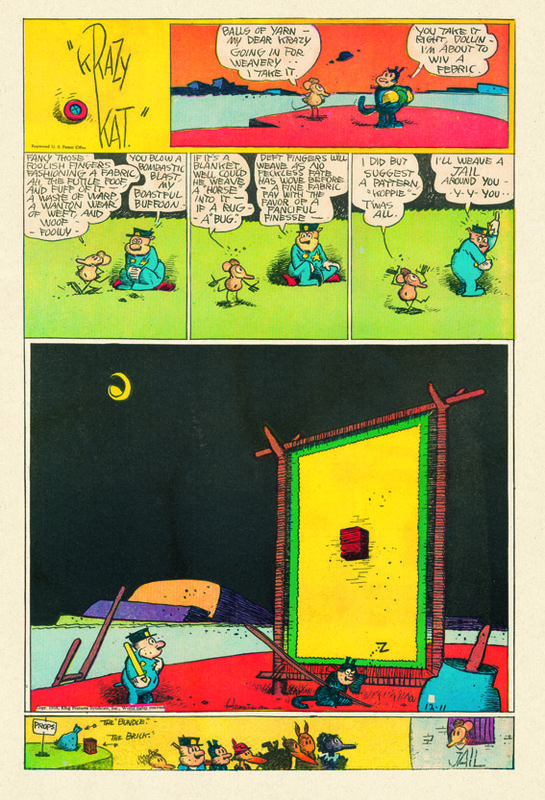 . . .
. . . 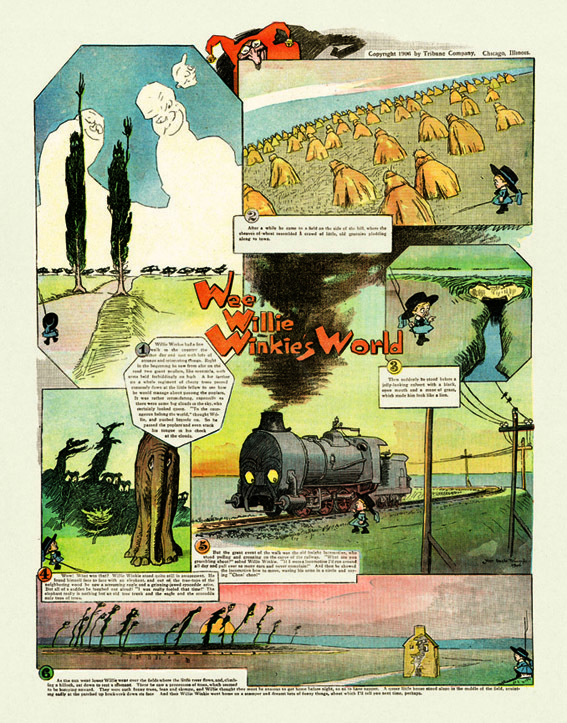 If the tads' arborial world is benign, its intruders are not. 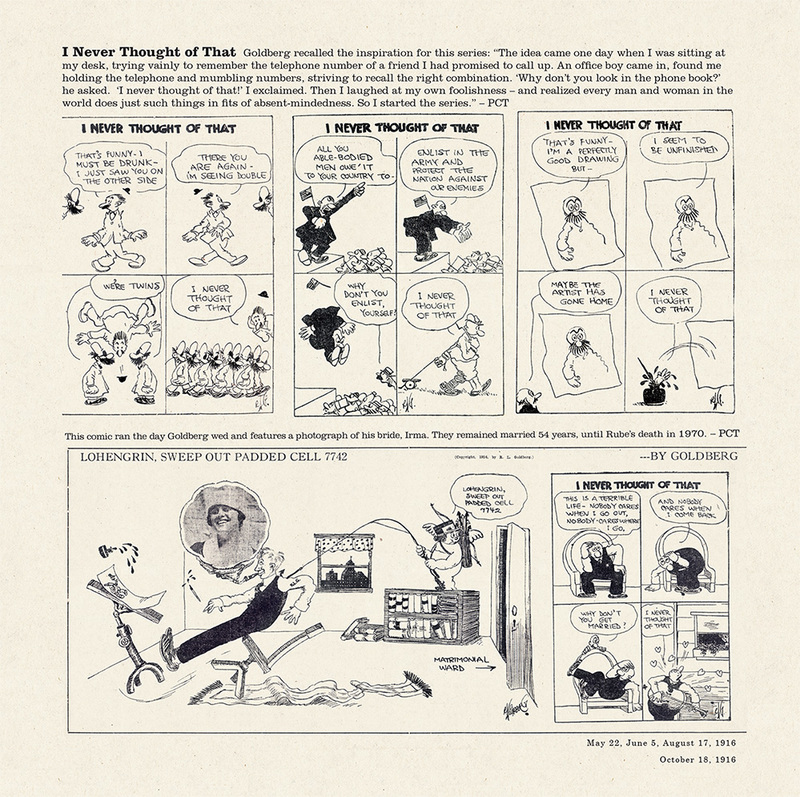 Week after week the sources of "terror" are new creations - animals that Noah might have thrown off the ark, or that Dr. Seuss might have imagined only when stricken with heartburn. 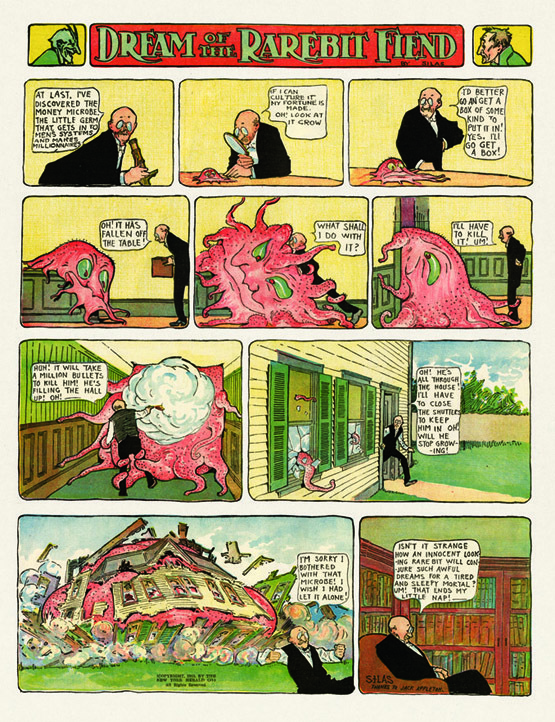 Creatures that, if not menacing, were... weird. 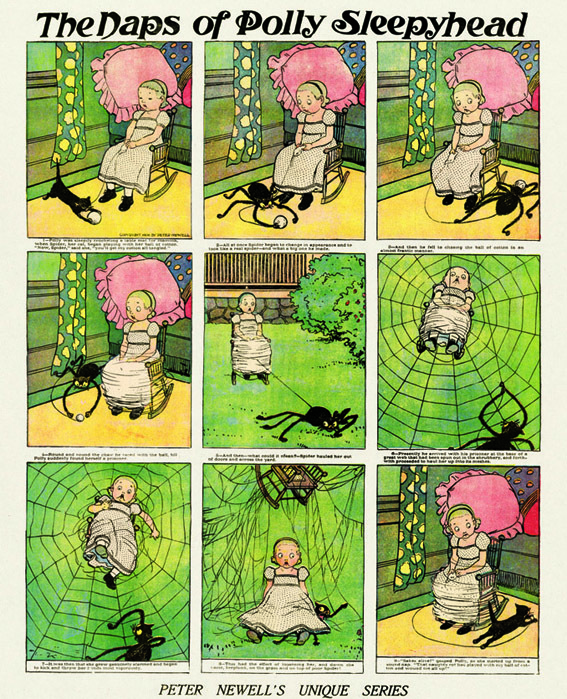 And, in the inevitable Verbeckian mode, dangerous or frightening was not enough. 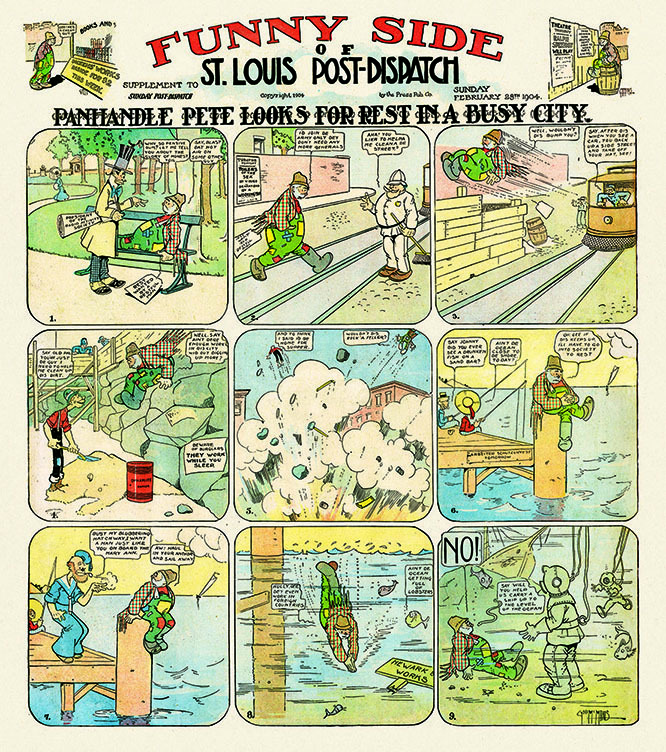 The cartoonist set himself the challenge of creating compound anthropomorphs: two species combined, but more often, animals mutated with inanimate objects - suitcases, trolley cars, hotel buildings, and the like.
. . . 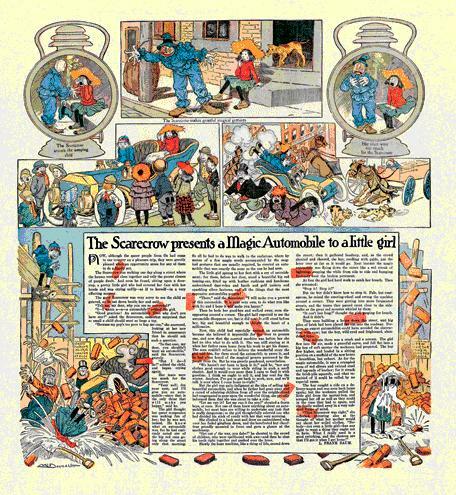 Here we find the Hippopautomobile and the Umbrellaphant, a Sweet Potatoad, a Hotelephant (a quadrupedifice, you see), a Dandelioness, the Kangarooster, Pantaloonatics, an Aeronaughty Boy, Canniballoons, the Buffalocomotive, a Flamingorilla, the Crocodisland, a Flaminghost, the Cariboogaboo, an Uncannymal creature, the Vampirate, a Guitarcher, the Pelicantelope, and the Boa Constrictortoise. 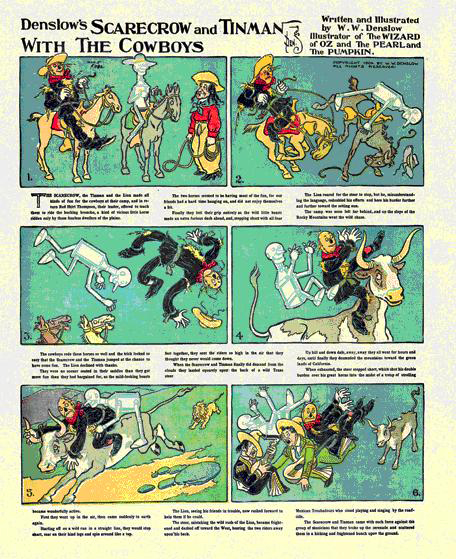 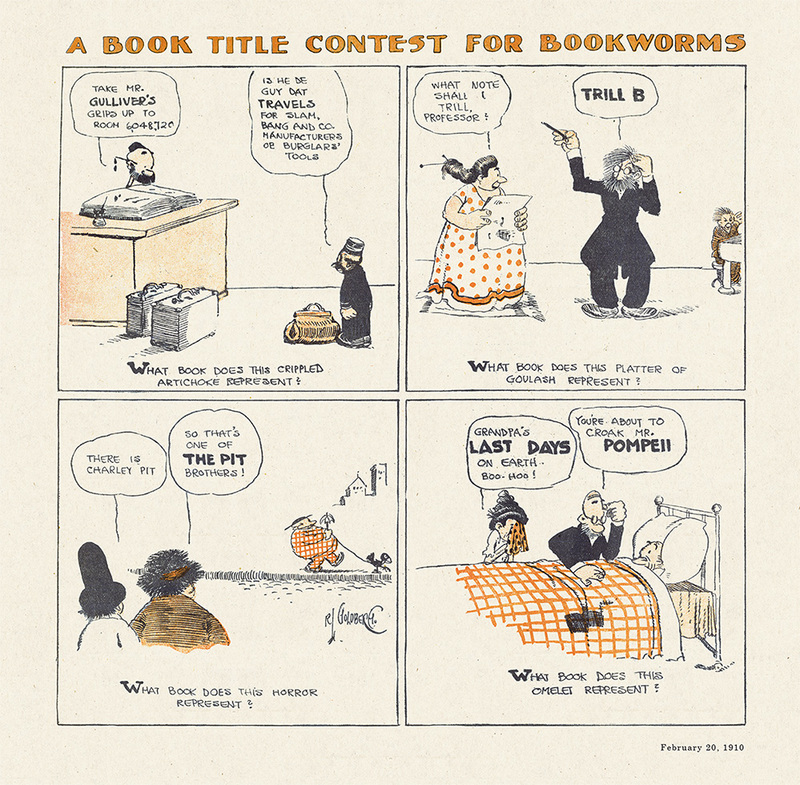 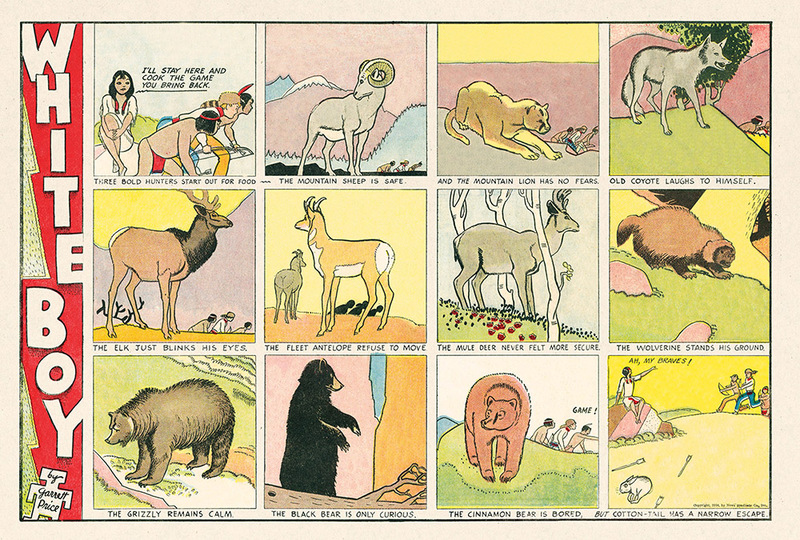 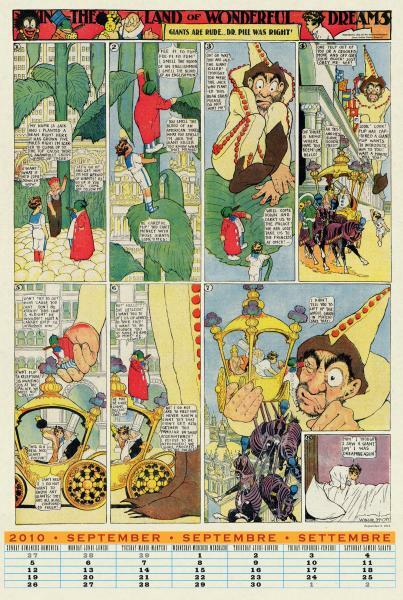 Whether the philological (ultimately, upon reflection, VERY-logical) challenges were Verbeek's real terrors as each deadline approached, we can only guess.. . .
. . . Charming or chilling, Gustave Verbeek's comic strips offered an astonishing ride - not unlike being astride a charging Elephantasy - for tads little and big a century ago. 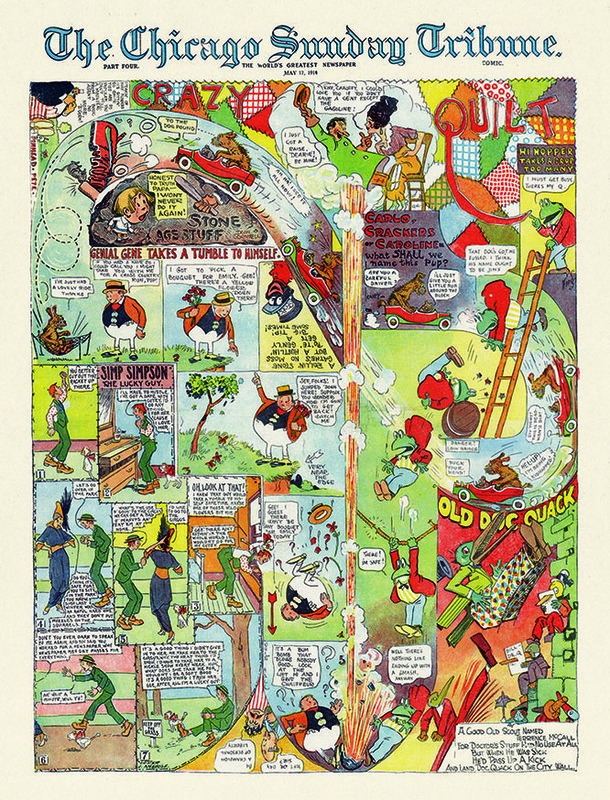 And, again, today, gloriously reprinted, as uncommon as ever. 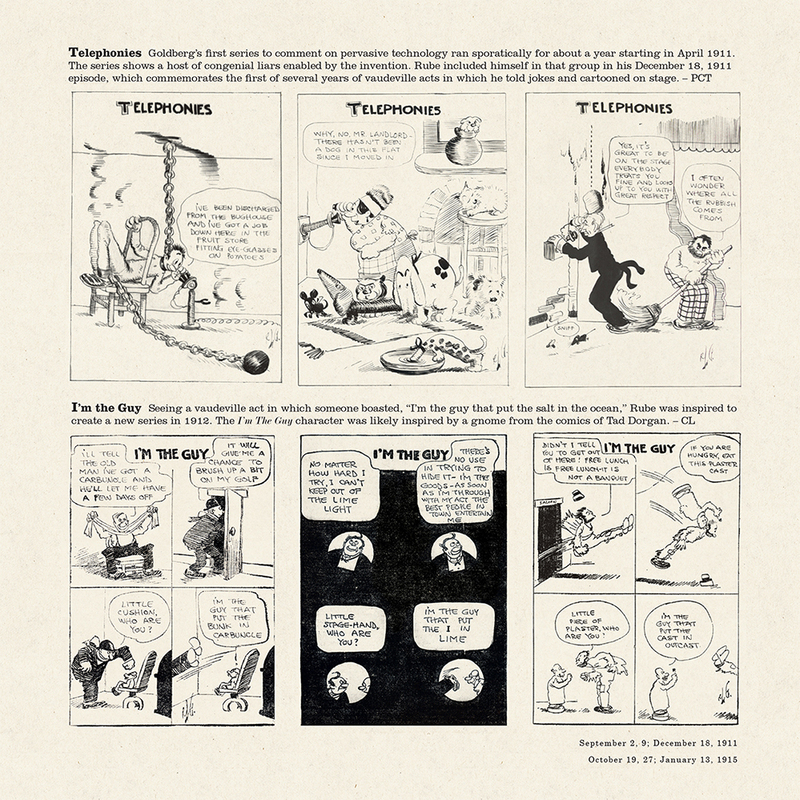 Excerpted from the essay based on an article that originally appeared in Nemo, the Classic Comics Library, #20. 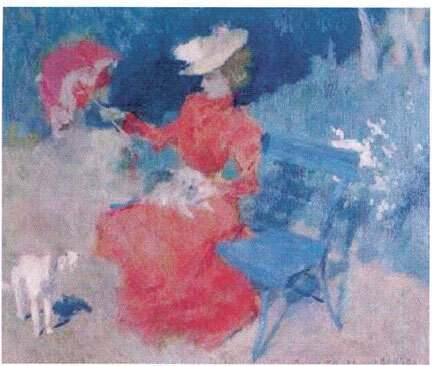 ©1986, 2009 Richard Marschall. 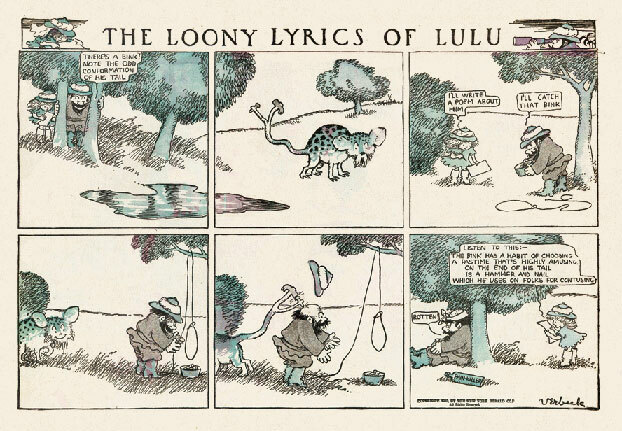 Gustave Verbeek's last contribution to the Sunday supplements, The Loony Lyrics of Lulu (July 17 - October 23, 1910), followed in the tracks of previous alliterating nonsense strips such as The Laughable Looloos (1906) and Loony Literature (1907). 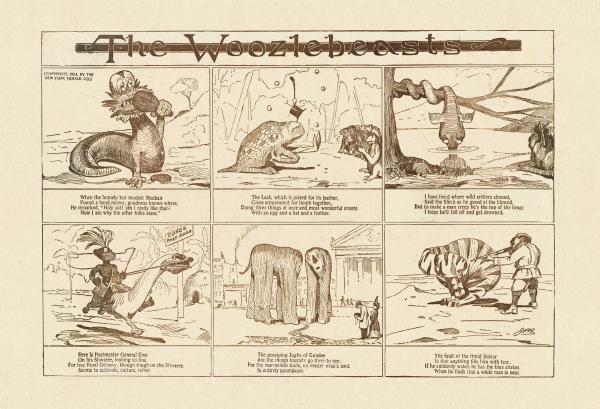 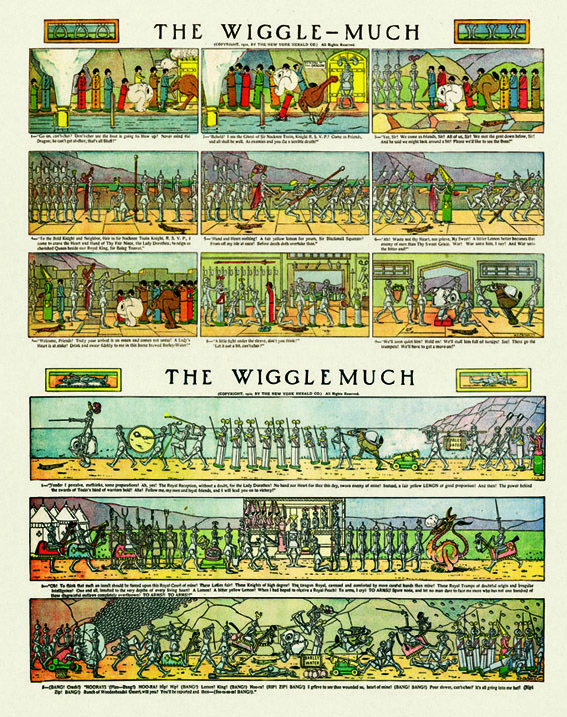 While taking advantage of a recurring fad for reader-contributed limericks, the strip also looked back to Edward Lear, whose Book of Nonsense (1846) had marked the beginning of Victorian Nonsense and popularized the limerick. 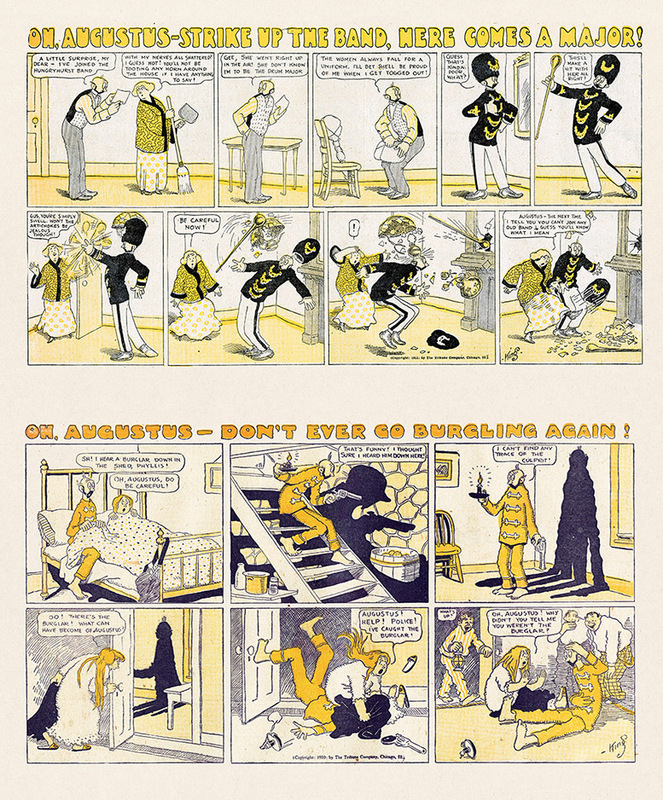 This association of nonsense techniques and contemporary trends had always been a characteristic of Verbeek's work. 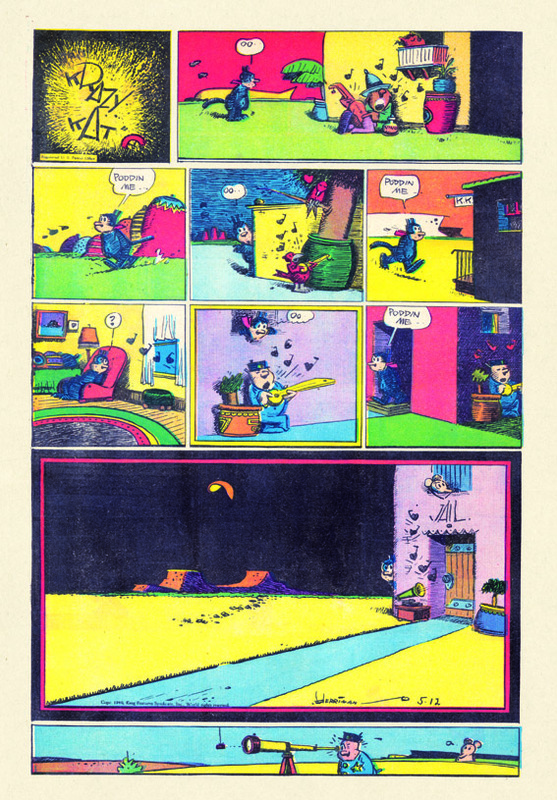 . . .
. . . 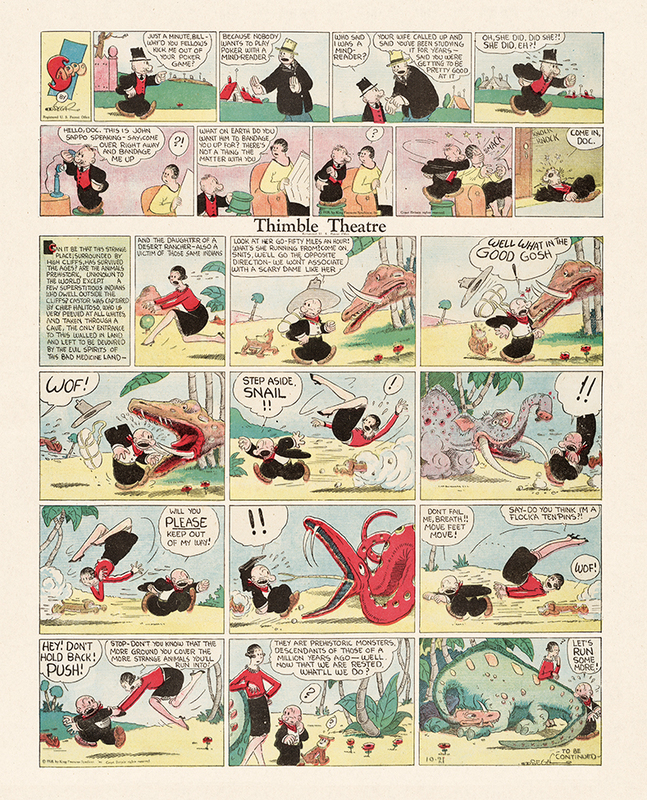 In The Loony Lyrics of Lulu, Verbeek took the single-panel association of limerick and animal and again placed it within a narrative frame: Lulu composes a limerick while her father unsuccessfully tries to capture the beast described in it - the limerick, traditionally relegated to the captions, is moved into the balloons, which the artist brings back for the occasion. 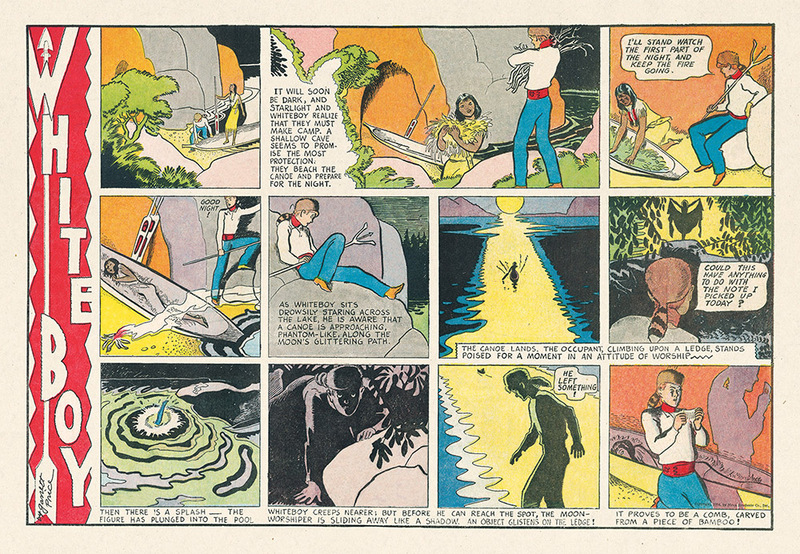 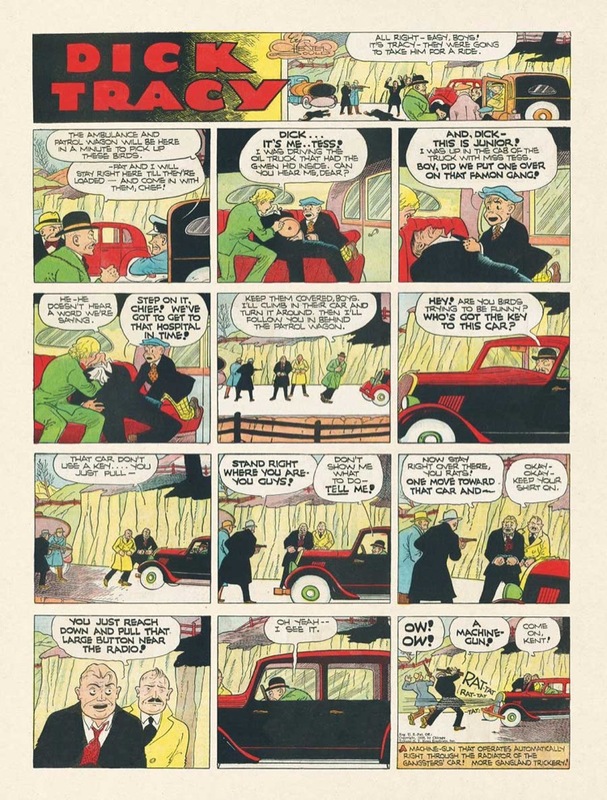 Lulu's lyrics and the dialogue are delightfully incongruous but her adventures no longer contain the violent scenes of his earlier strips, the hunter is fooled but never seriously hurt. 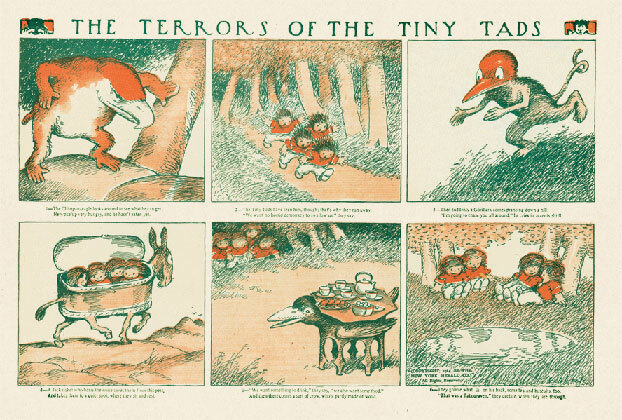 By 1910 the Tads themselves had evolved and their rounded, newly-cute figures had nothing in common with the wiry teenagers of the early episodes; they had even almost completely given up hunting. 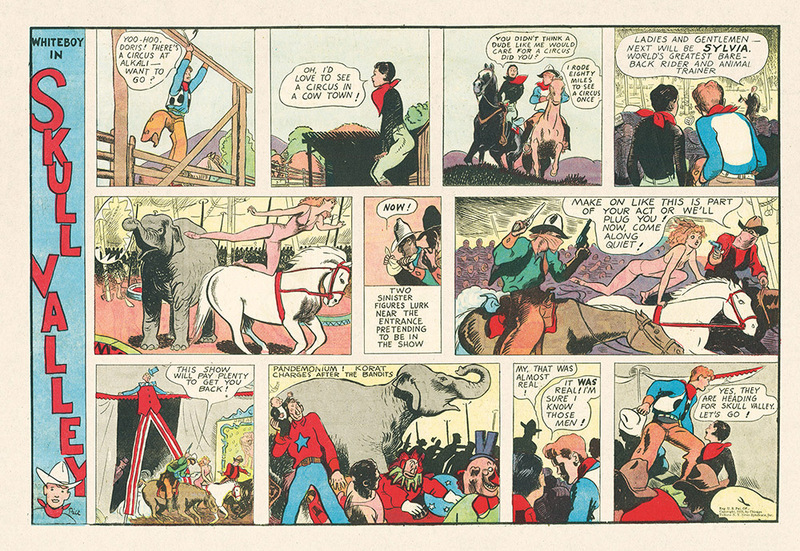 Times were changing and the disturbing experiments of Nonsense were no longer welcome in the comics: time for adventurous cartoonists to move on. 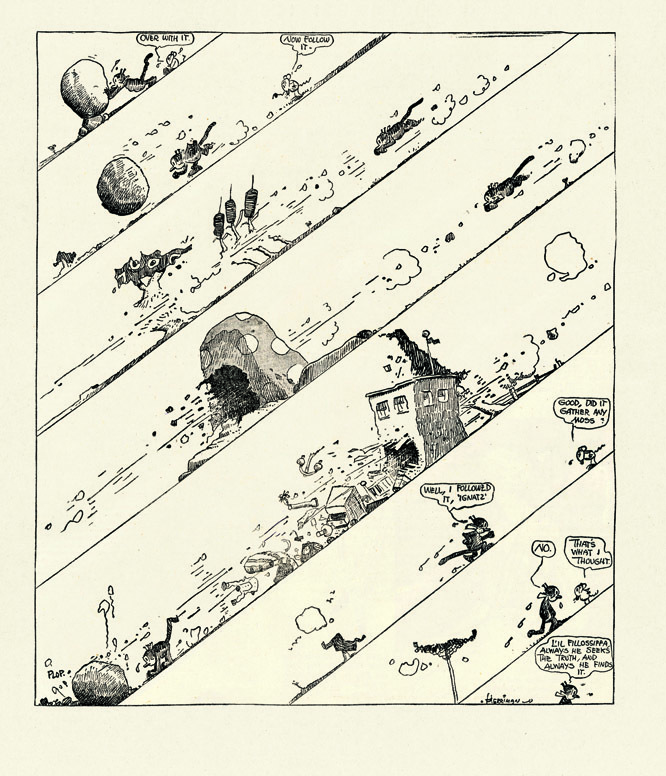 During one of our edits we accidentally omitted the name of a valuable contributor: Michel Dixmier. 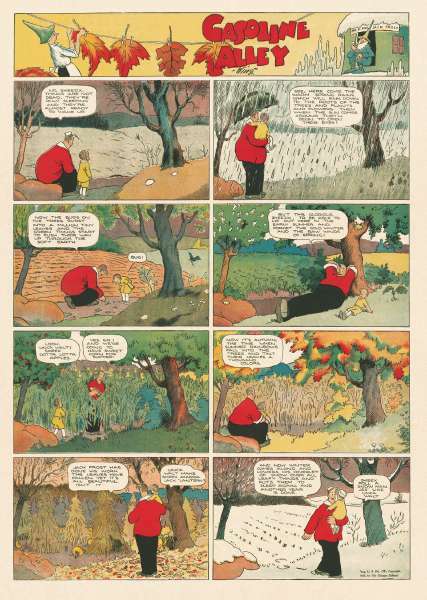 He loaned us rare material to enrich this book and give a more complete overview of Verbeek's work. 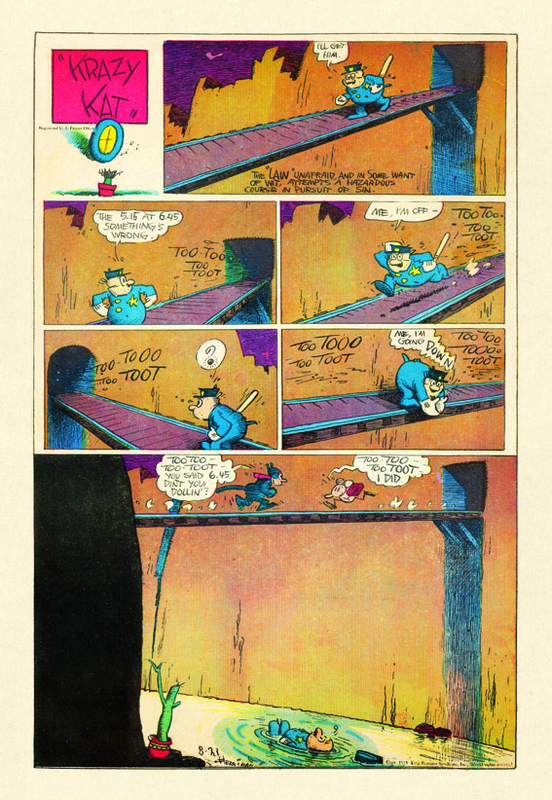 We sincerelly apologize for this error. 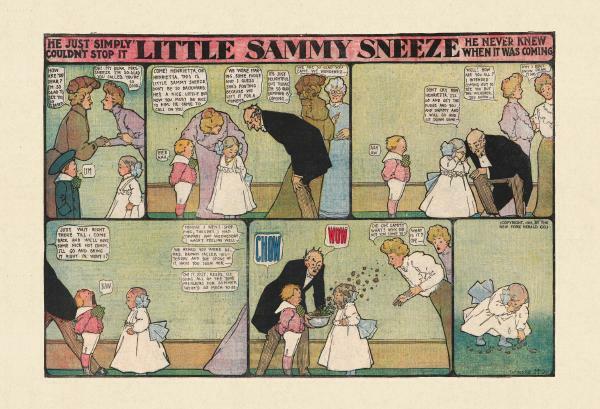 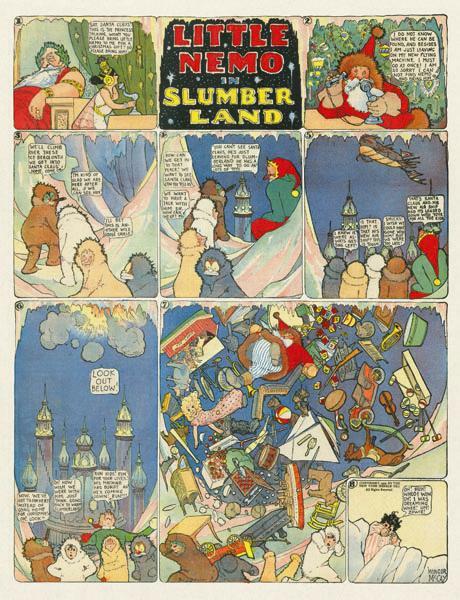 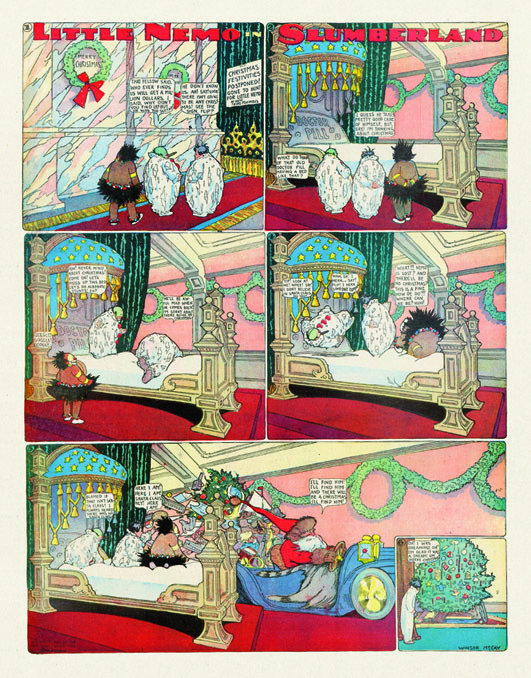 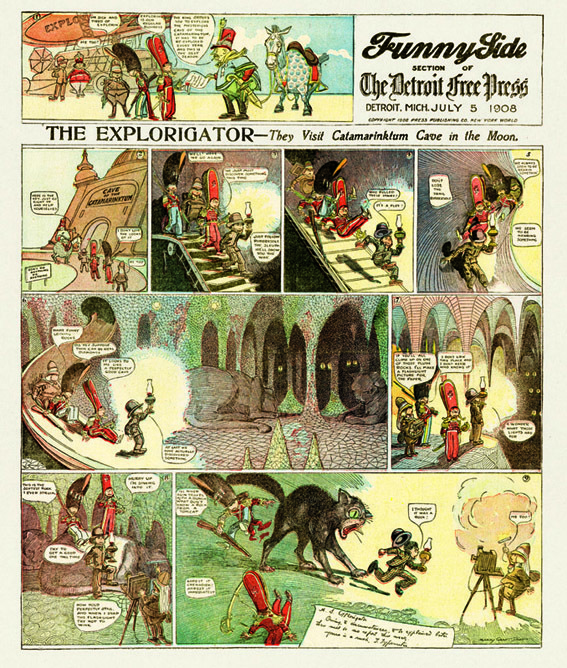 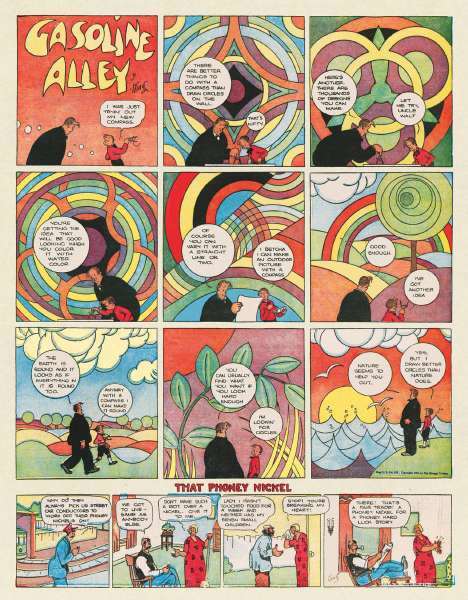 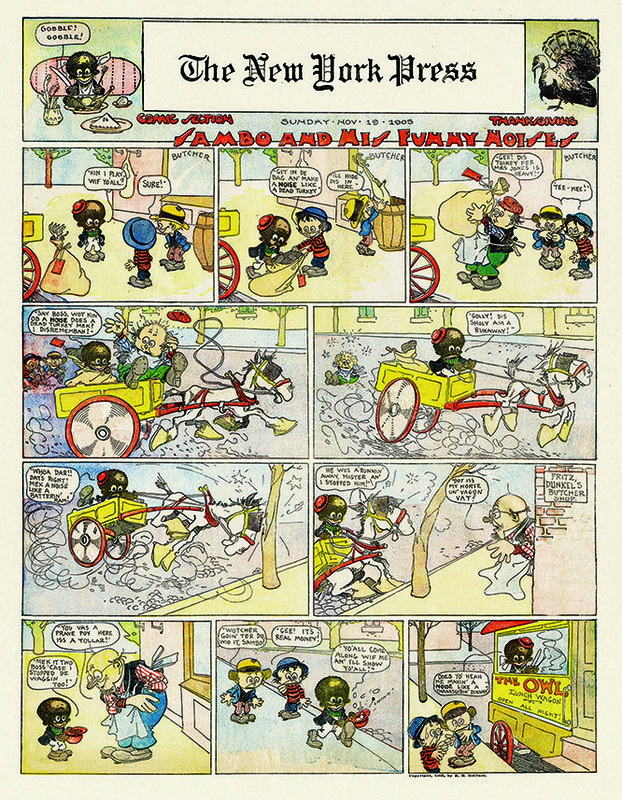 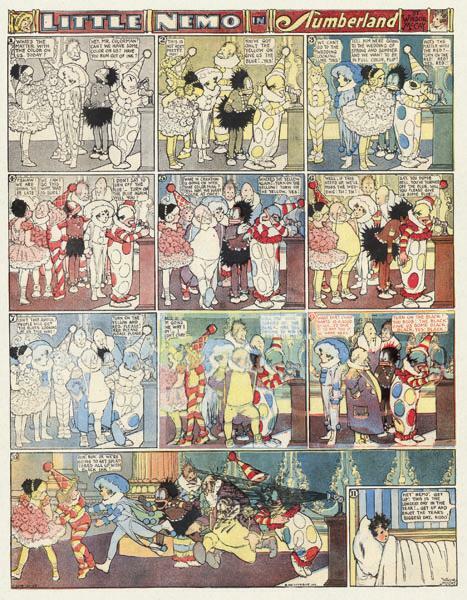 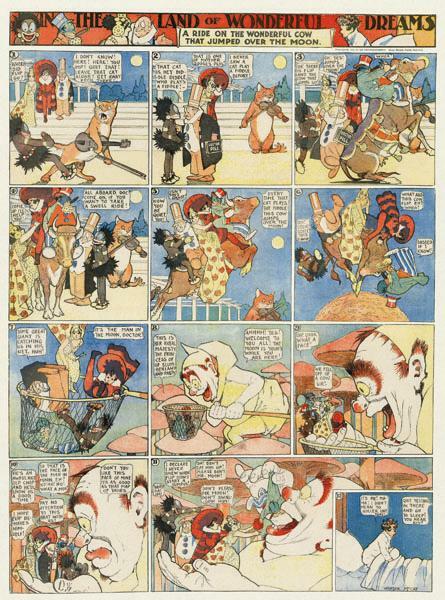 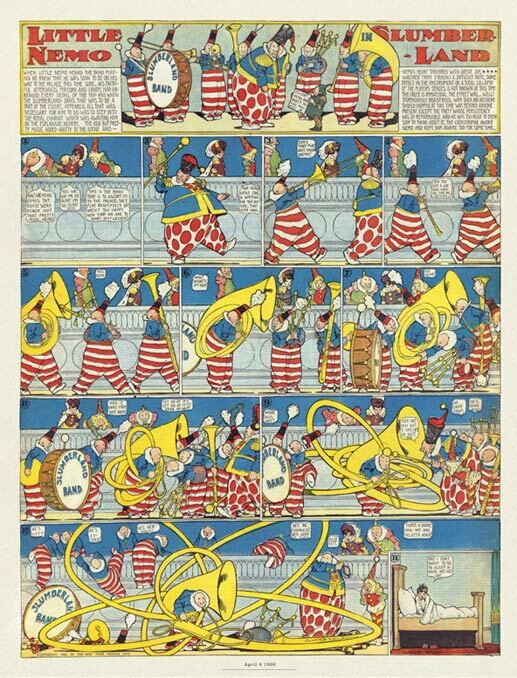 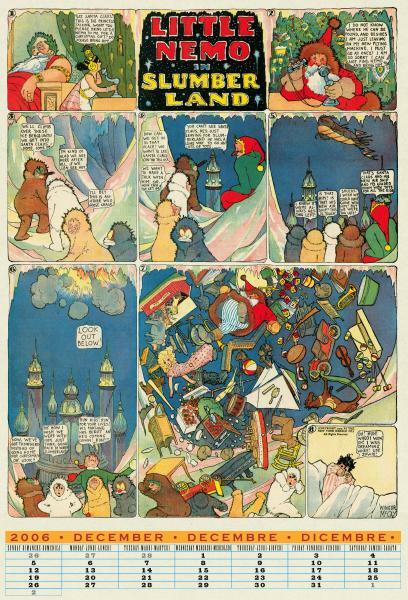 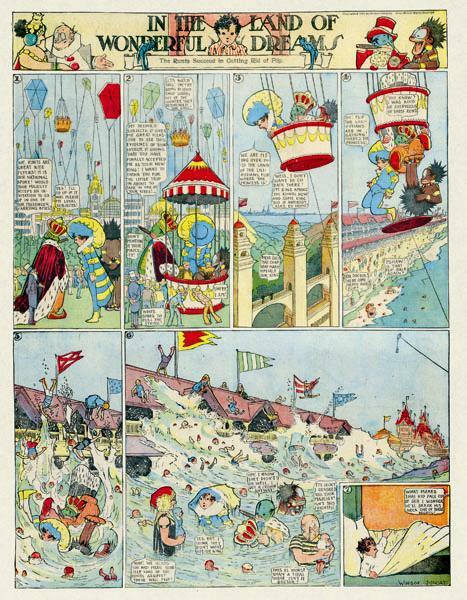 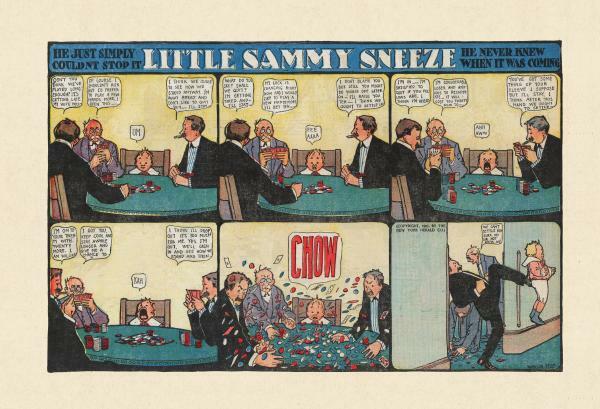 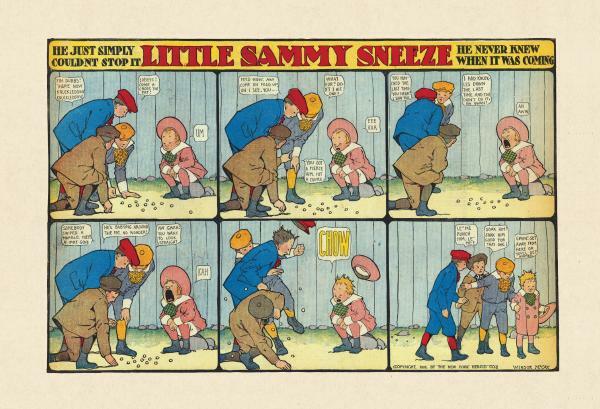 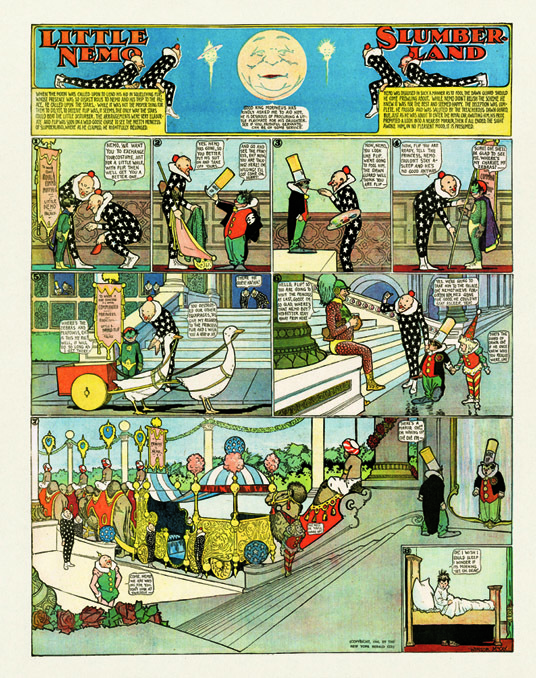 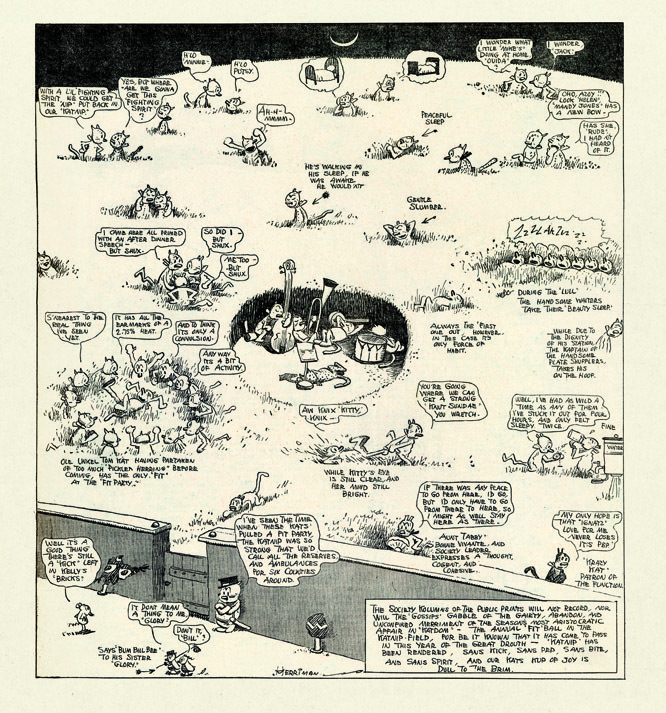 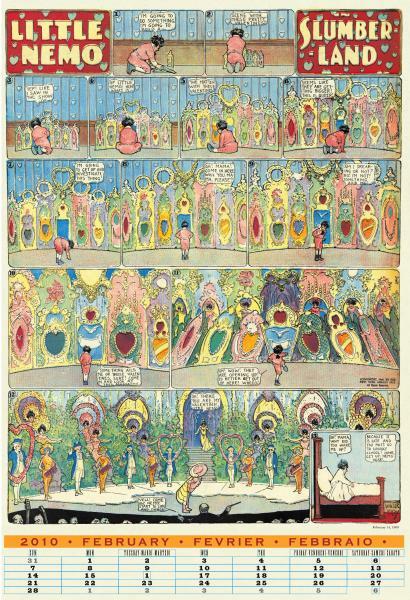 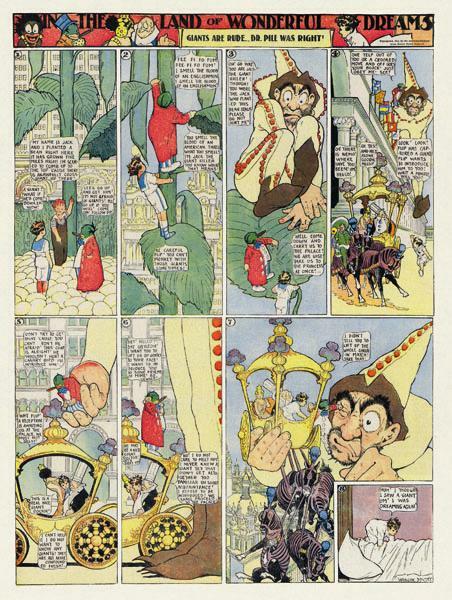 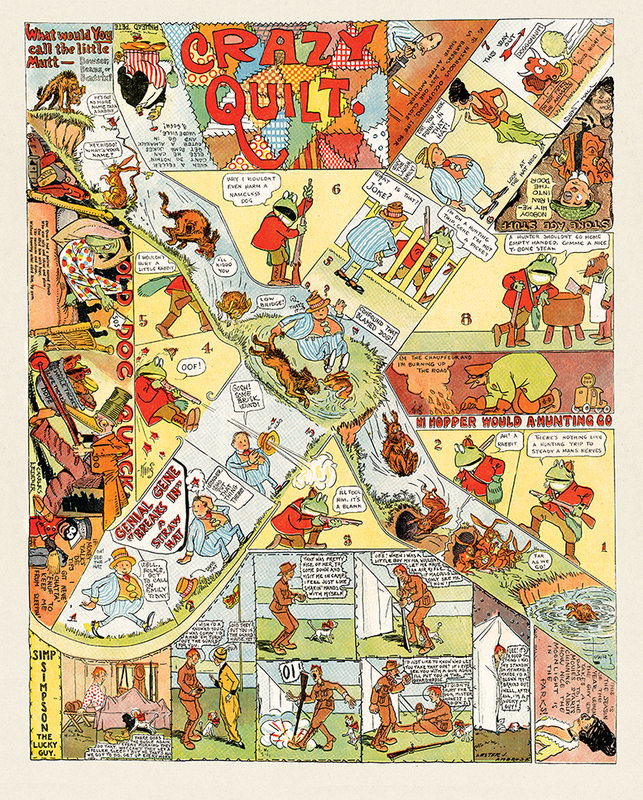 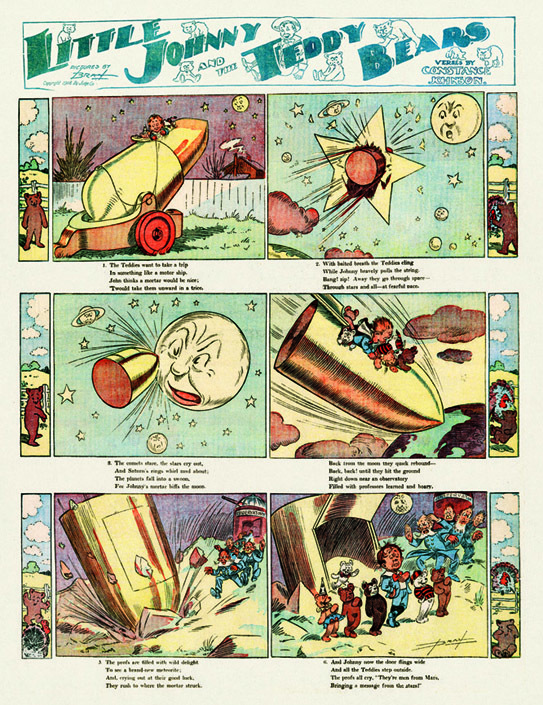 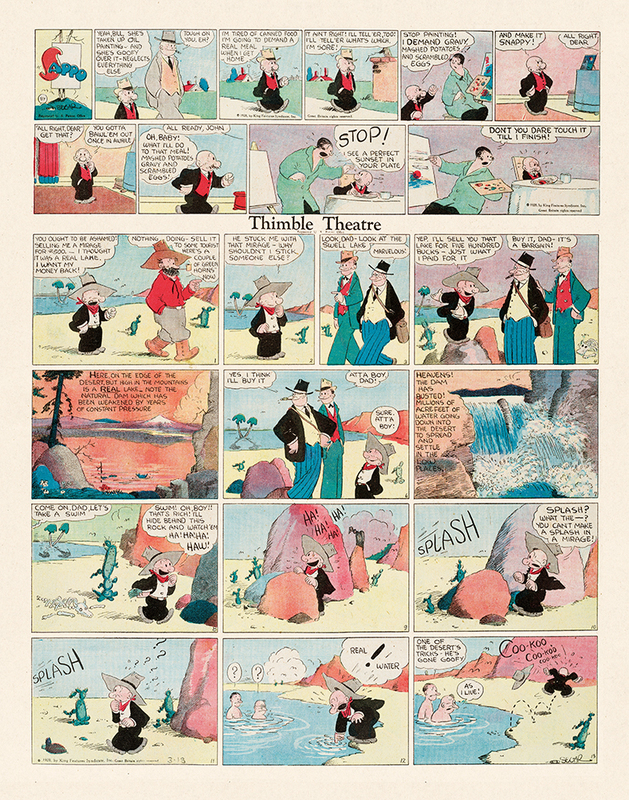 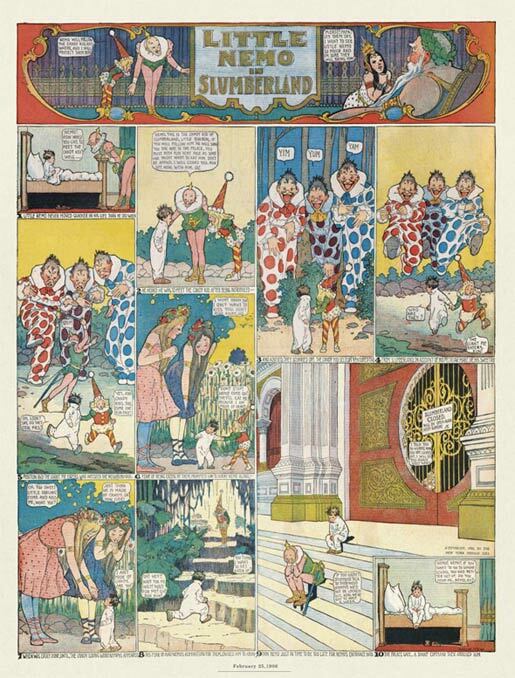 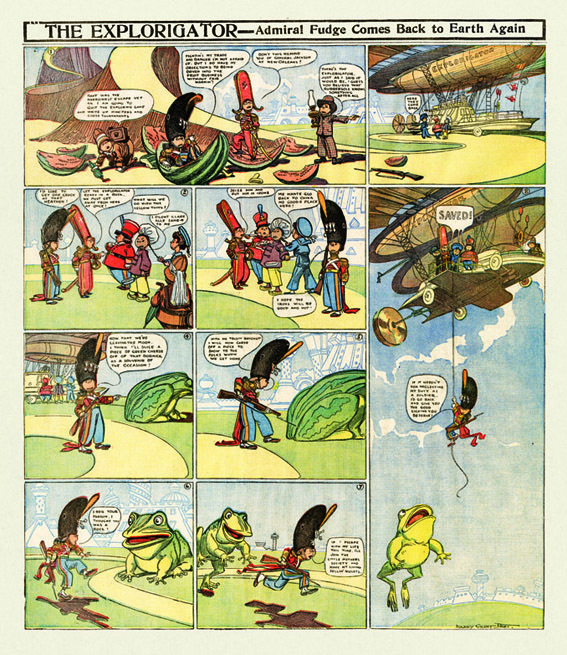 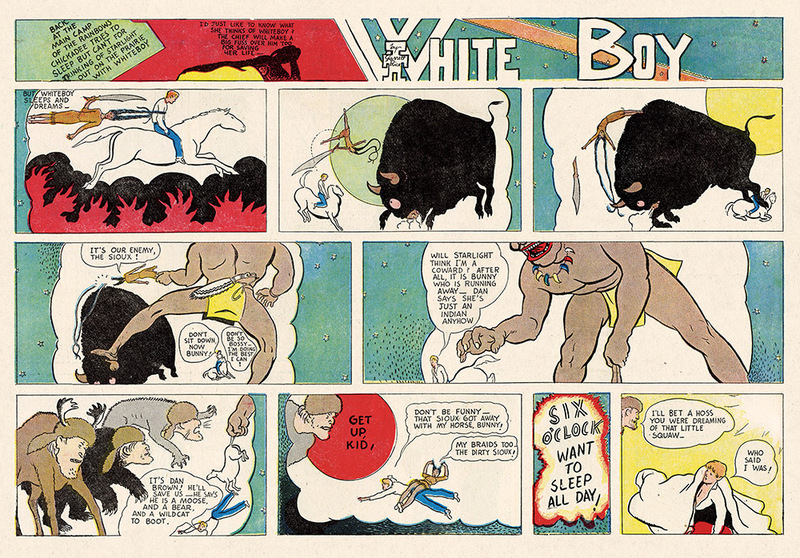 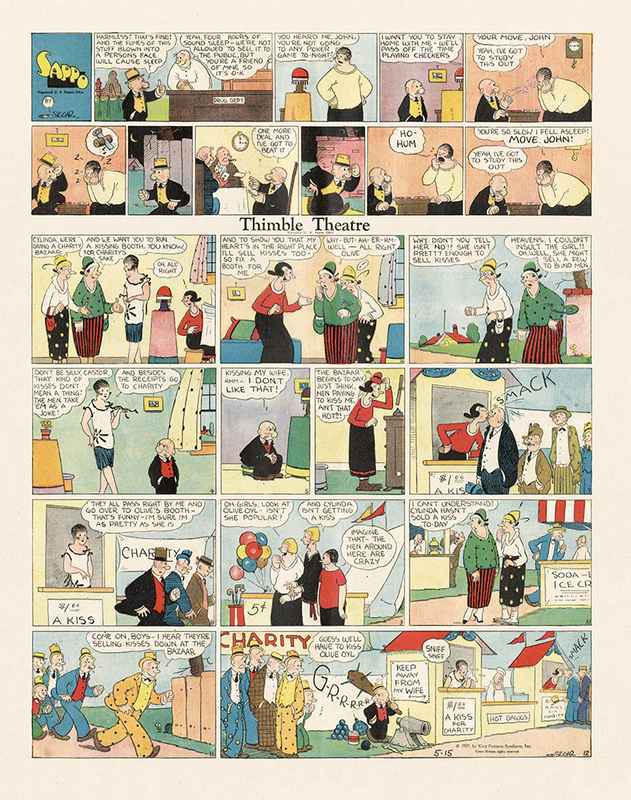 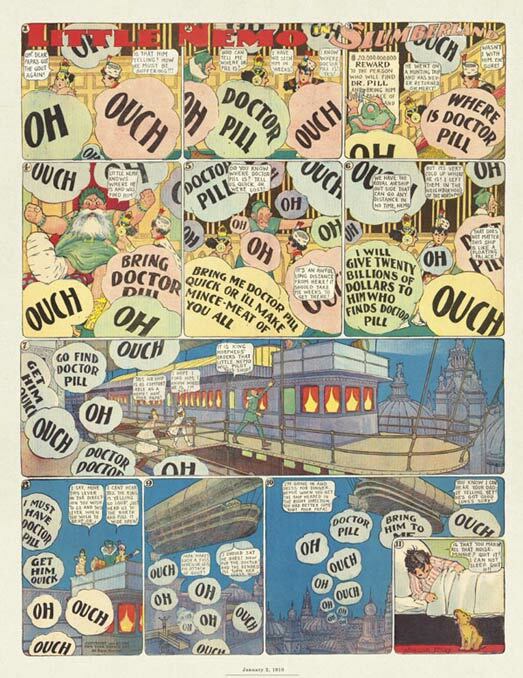 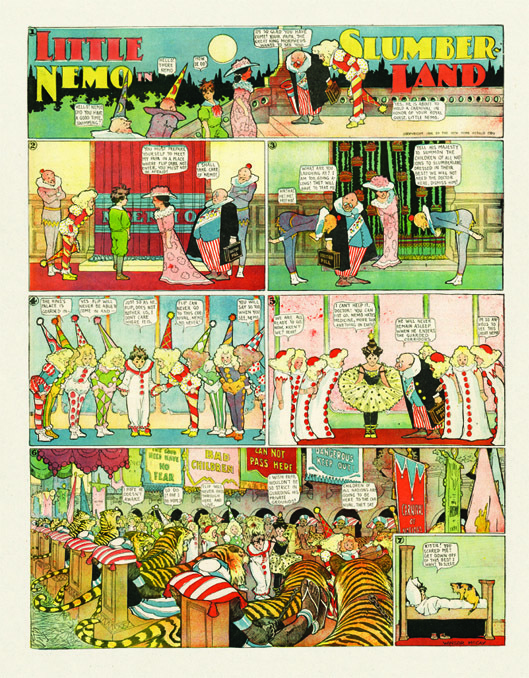 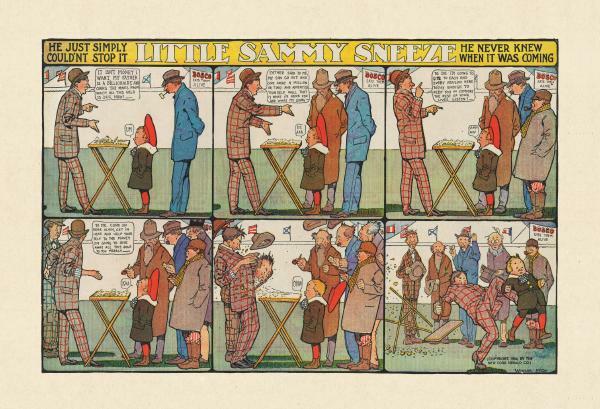 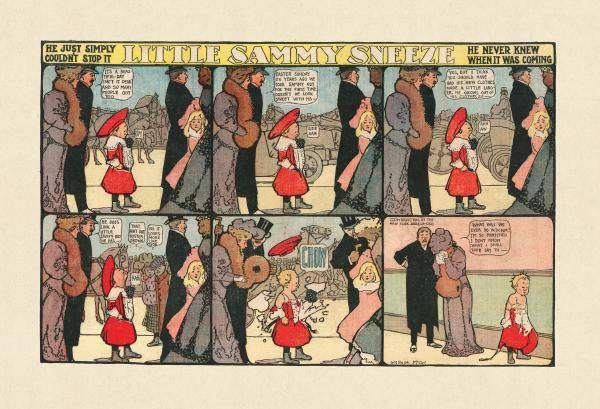 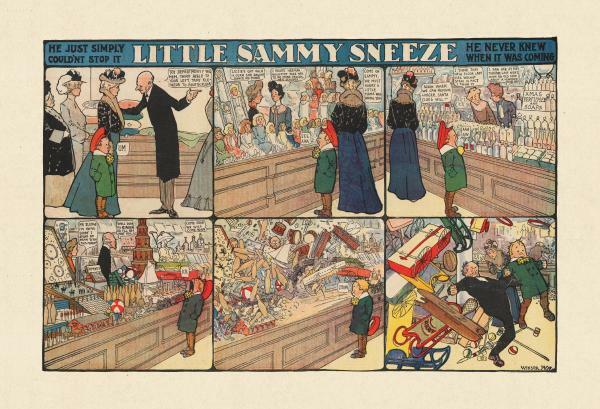 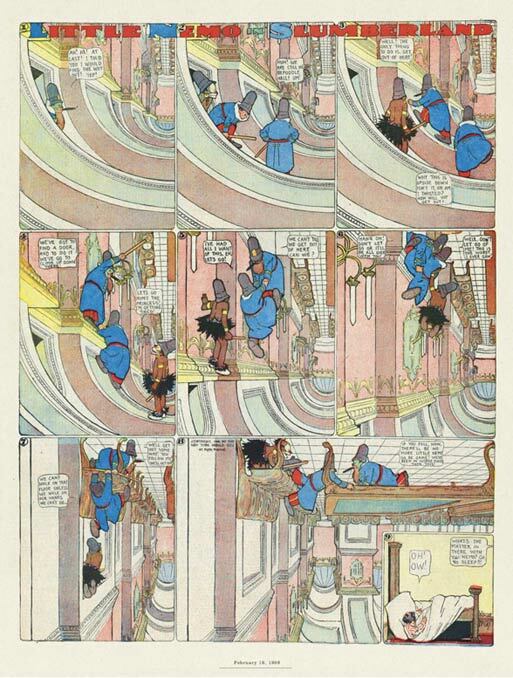 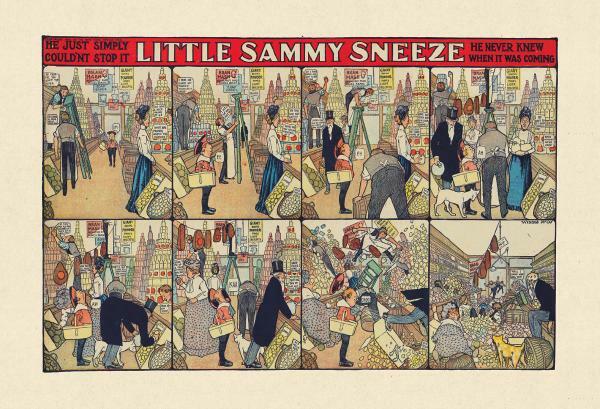 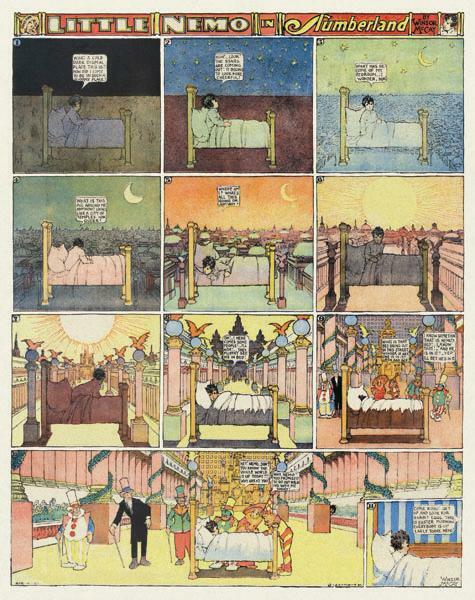 In the TINY TADS article, it was mentioned that the strip started the same day as Little Nemo in Slumberland. 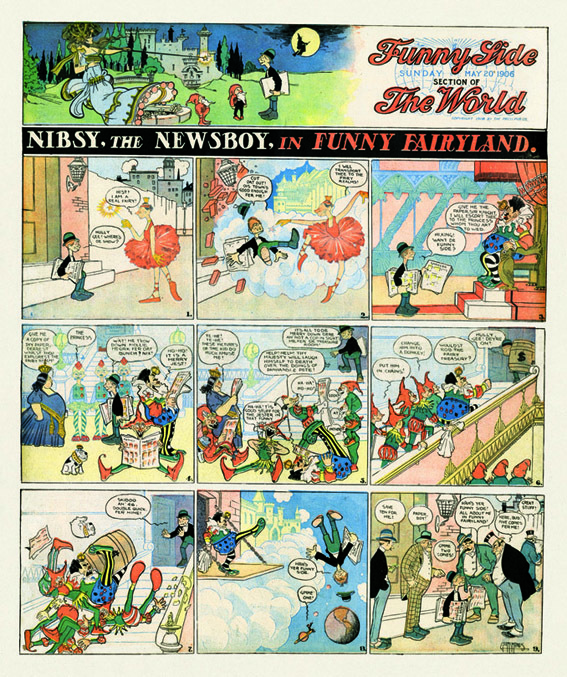 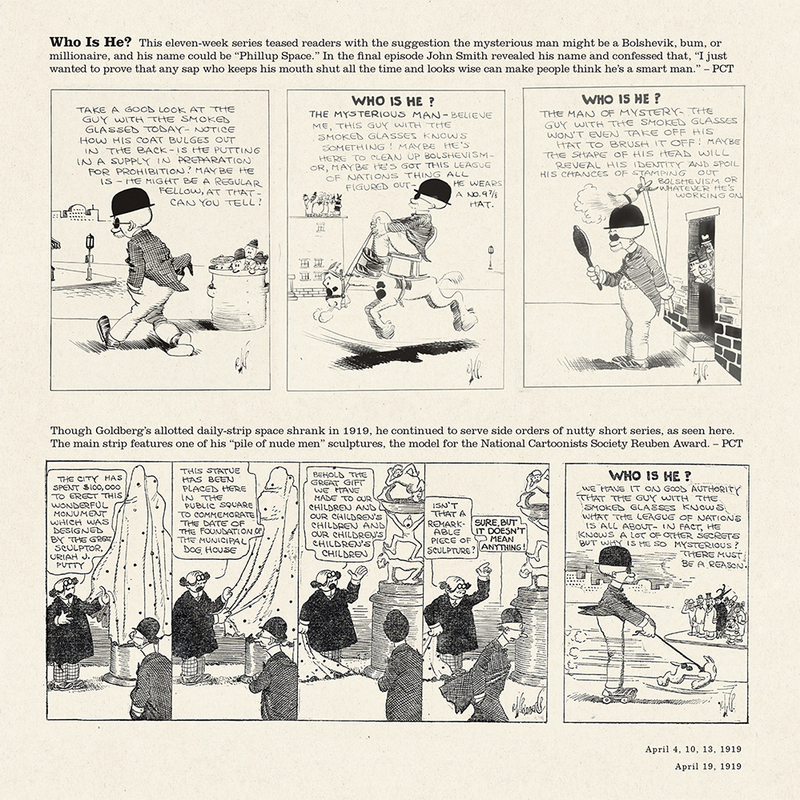 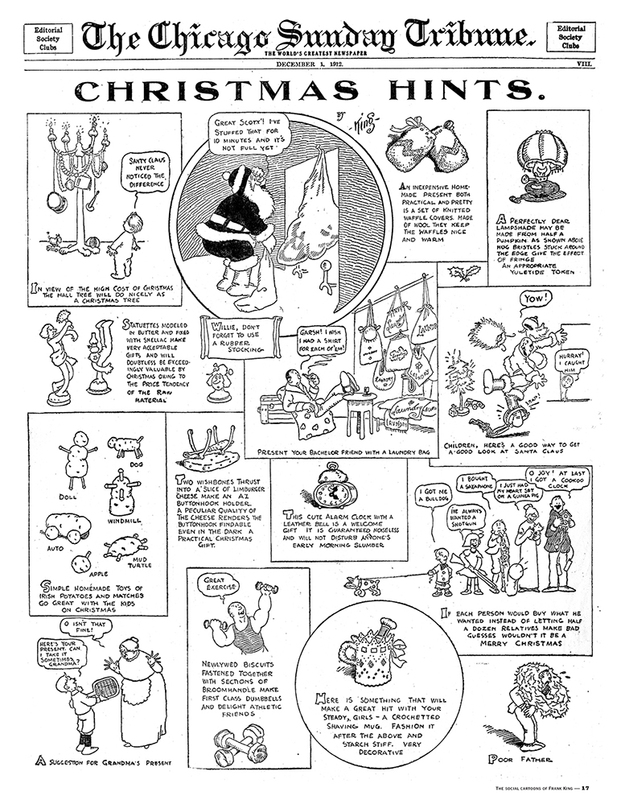 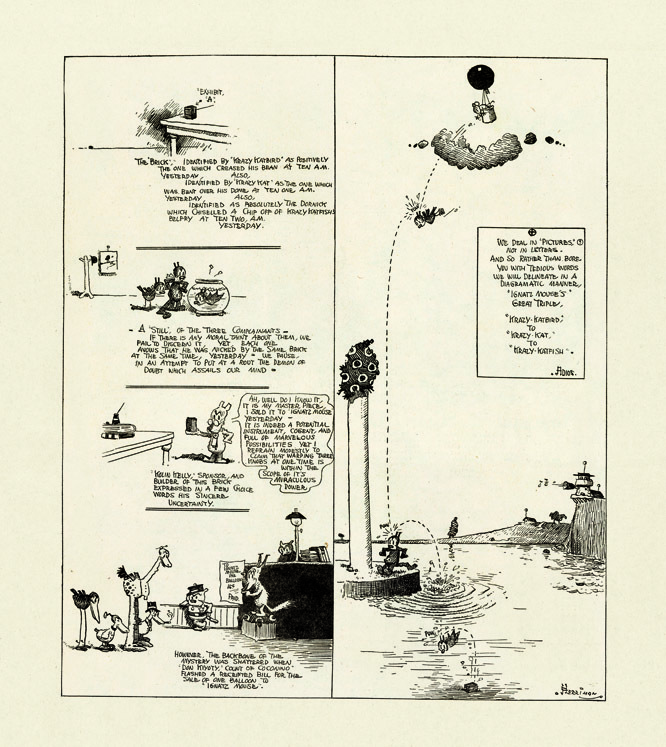 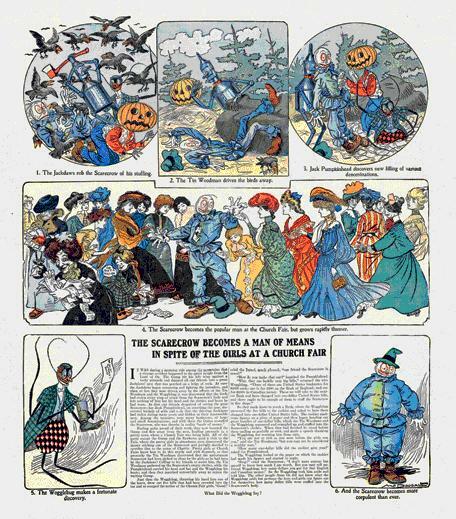 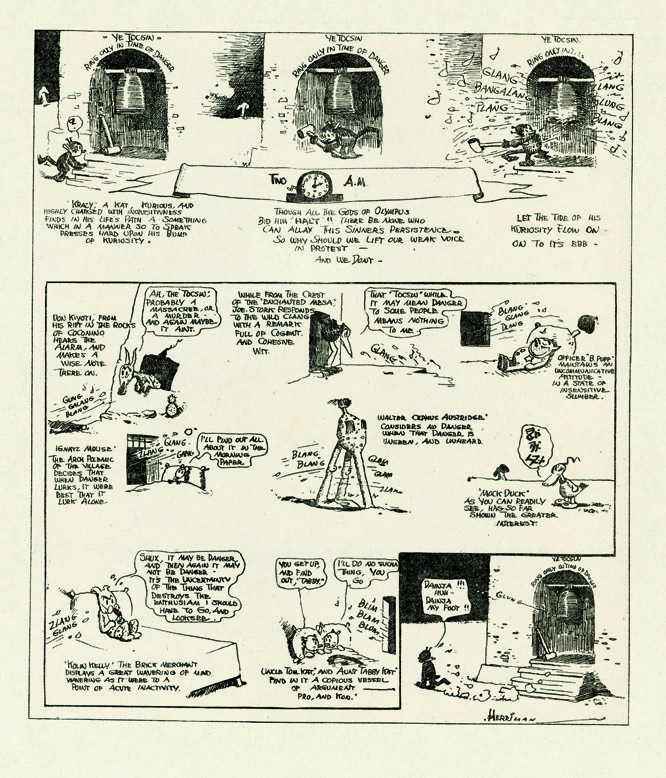 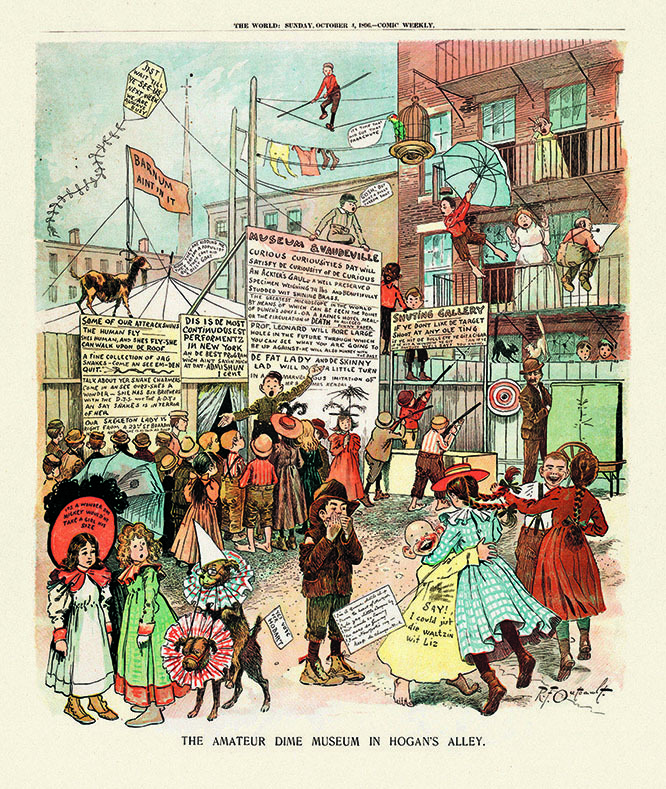 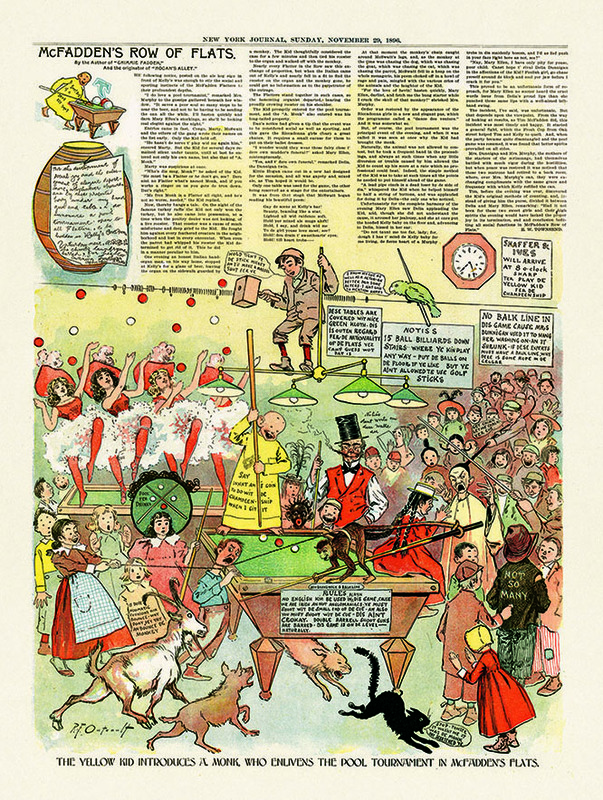 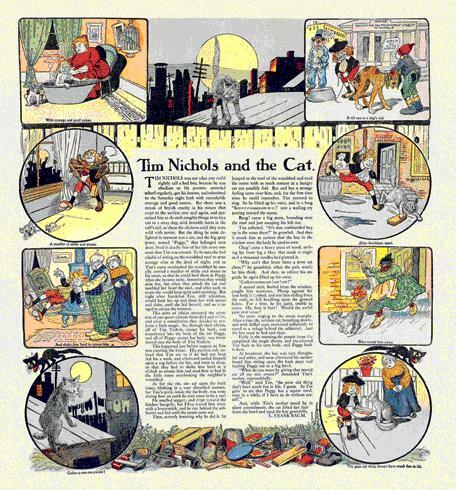 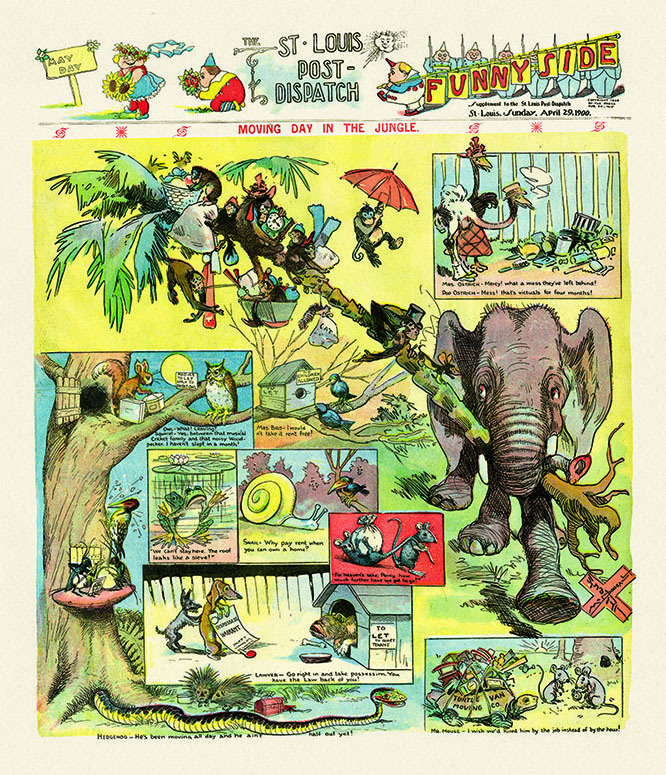 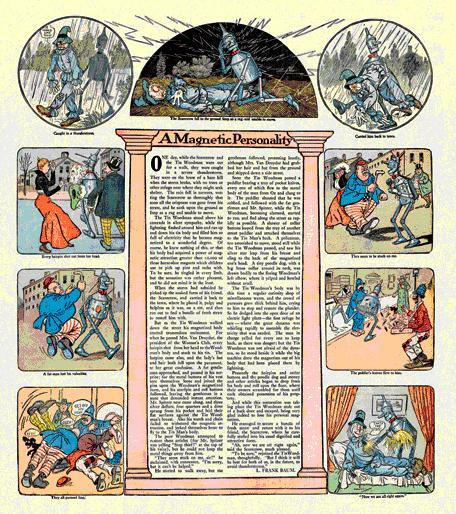 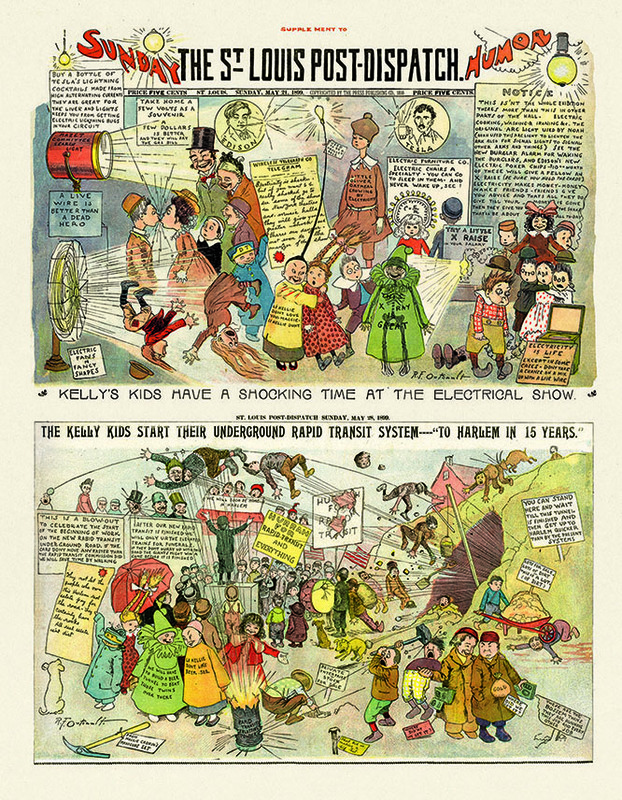 While the Tads did appear on the back of the first Little Nemo Sunday on October 15, 1905, the first Tiny Tads page was, as seen in this book, May 28, 1905. 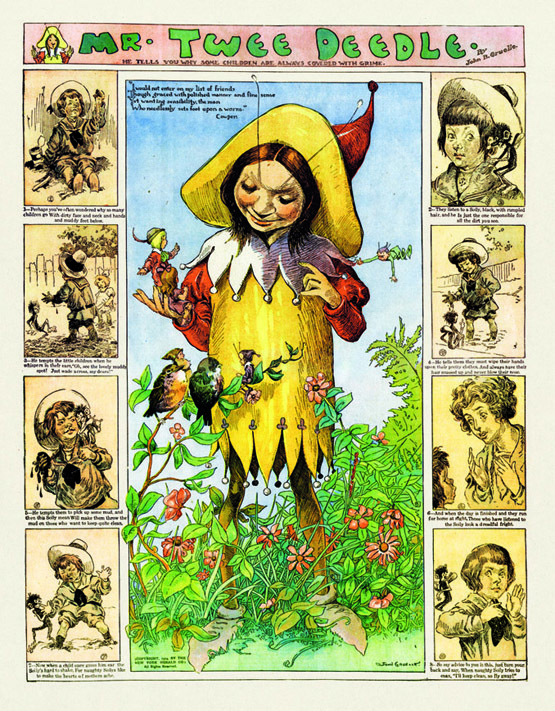 The Newell/Verbeek book referred to in the introduction as Mother Goose for Adults is actually titled Mother Goose for Grownups. 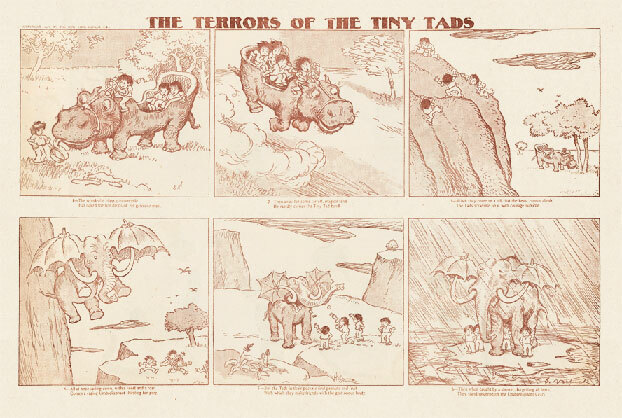 Tiny Tads postcards were distributed from 1907 to 1915, not 1907 to 1914 as stated in the caption for these cards.